Come join us for the carnival today. Its going on right now until 7pm. 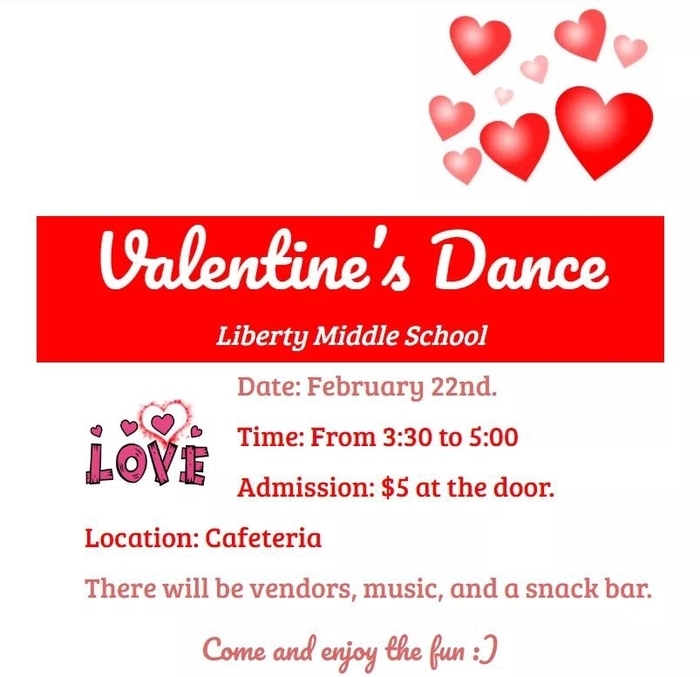 Music by B95 and our Liberty Jazz Band. 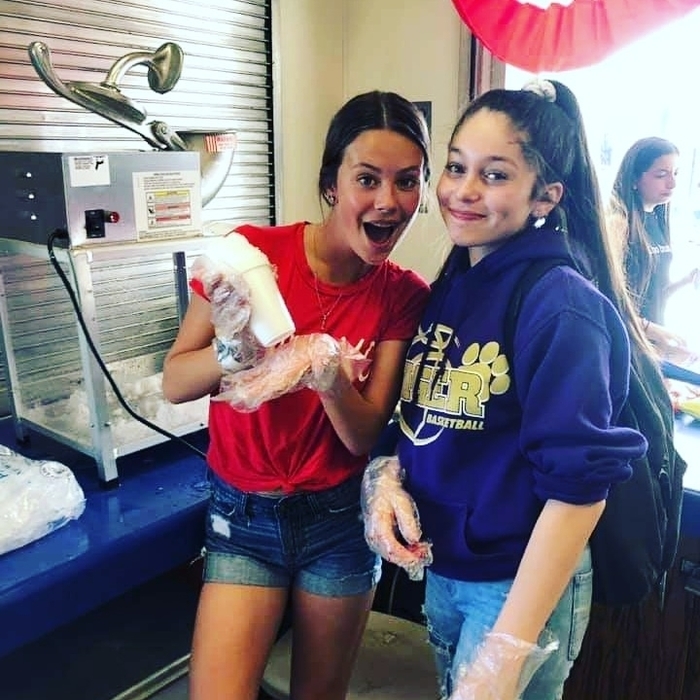 Free carnival games and slime lab. Come get dinner and dessert with quesdilla gorilla, betos, nitro lab and dippin dots. FUN for the whole family. Welcome back, Patriots. 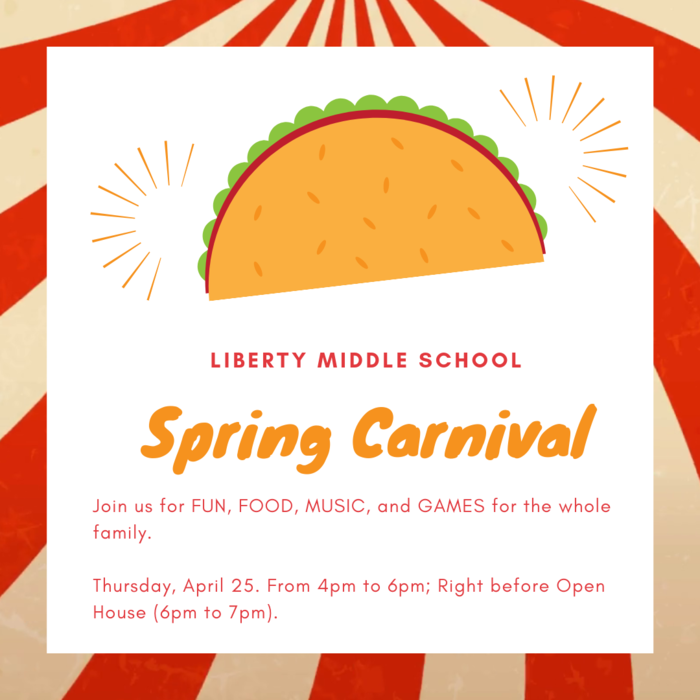 Don't forget to join us on Thursday for our Spring Carnival and Open House. Should be a FUN time for the entire family. Just a reminder that we start school back up tomorrow, Tuesday, April 23. We hope you had an amazing spring break. 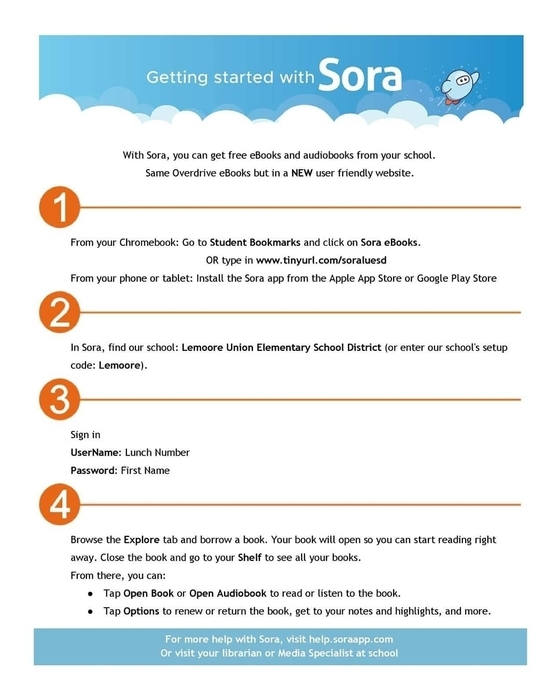 Get some spring break reading in, on your Chromebook, phone, or tablet, completely free from our LUESD district. Have a great break. We kicked off our spring break today with a BBQ lunch for Mr. Luis, our Administrator of the Year. We are so glad to be Patriots. Have an amazing spring break. 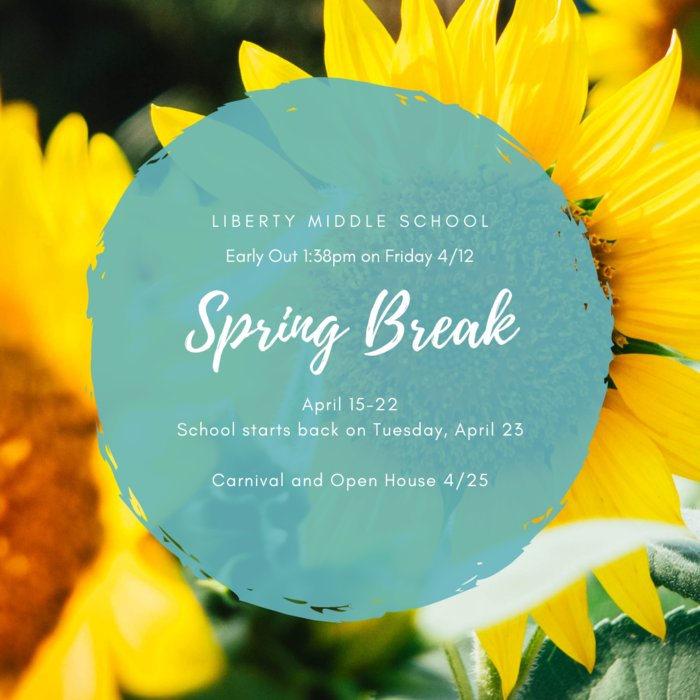 We will see everyone back on April 23. Just a reminder that we are on Early Out Schedule on Friday 12th. School ends at 1:38pm for Spring Break. 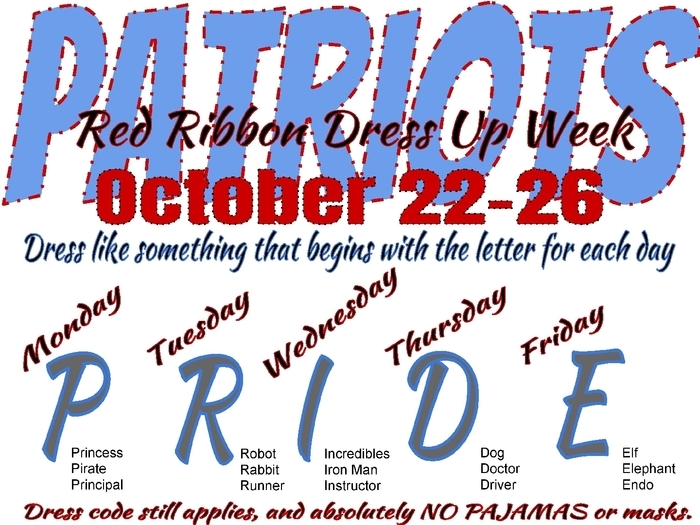 Students that visibly wear red, white, and blue on Friday, will not have to wear a collar. All other dress codes still apply. 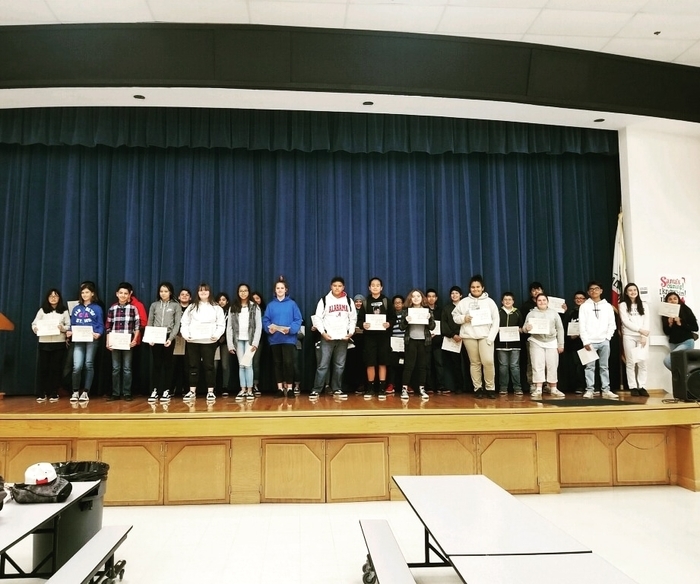 Thank you to all the parents and guardians that attended our student of the month recognition this morning. 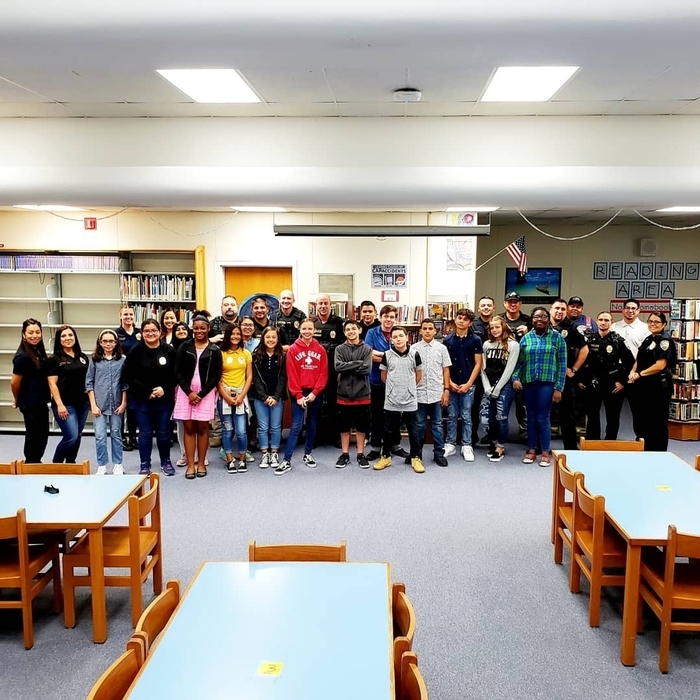 These students were selected as students who best represented all the attributes of PRIDE: Prepared, Respectful, Integrity, Dependable, and Effort. Congratulations. 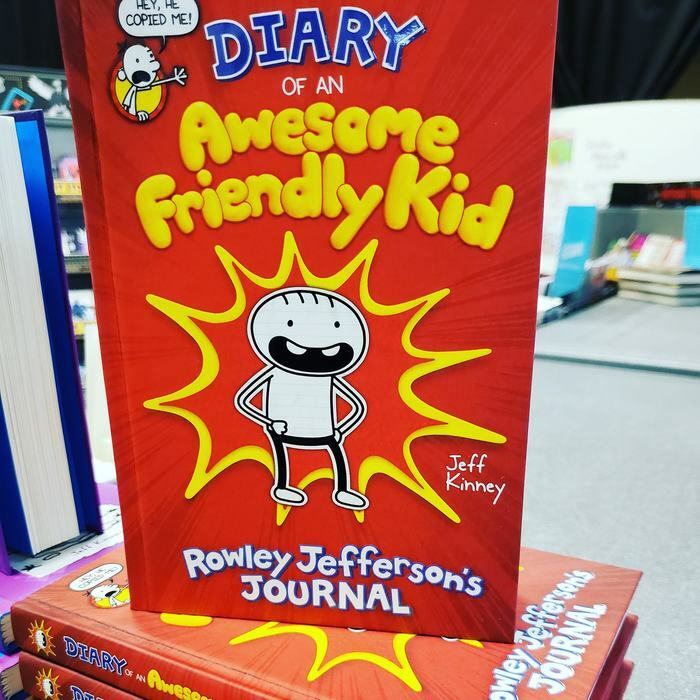 The newest Diary of a Wimpy Kid book was released yesterday and we have the book at our Liberty Book Fair. Buy the book and support reading at our school. 8th Grade T-shirts will be available for purchase for $15 in the upcoming days. 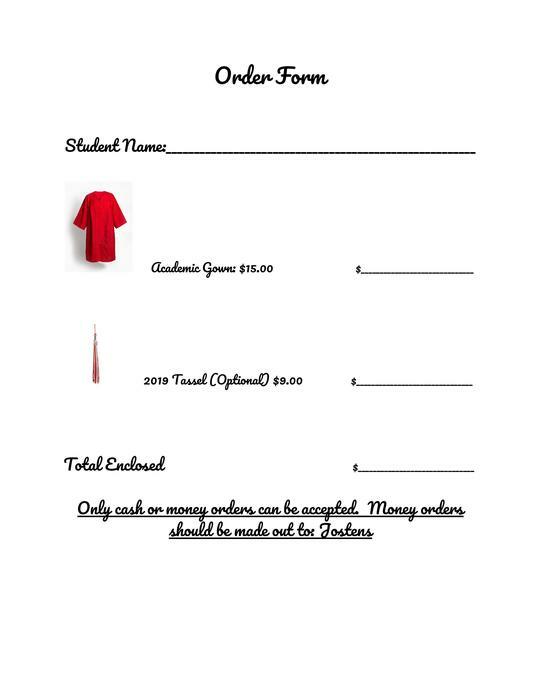 These shirts will be perfect for the 8th grade trip or as spirit wear at school. Get your order in this Thursday or Friday to guarantee your sizes, as some sizes may become limited in the future. 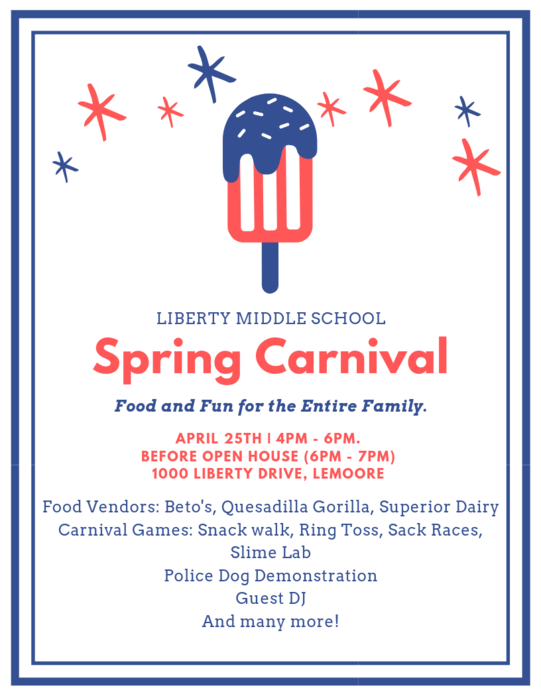 Join us on April 25 from 4-6pm for a Fun Carnival Afternoon for the whole family. Carnival Games and Food Vendors on campus: Beto's Quesadilla Gorilla, and Superior Dairy and so much more. Thank you for your support! 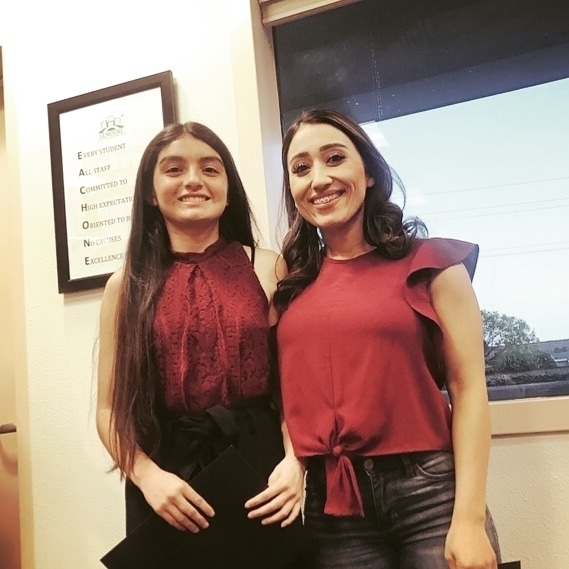 Today at the LUESD Board Meeting, the Board of Trustees and Superintendent Hunt recognized Ms. Llamas and Xitlali Siguenza for the effort they put into preparing for and competing at the Speech & Debate tournament. Congratulations again and Good luck in the State Championships! 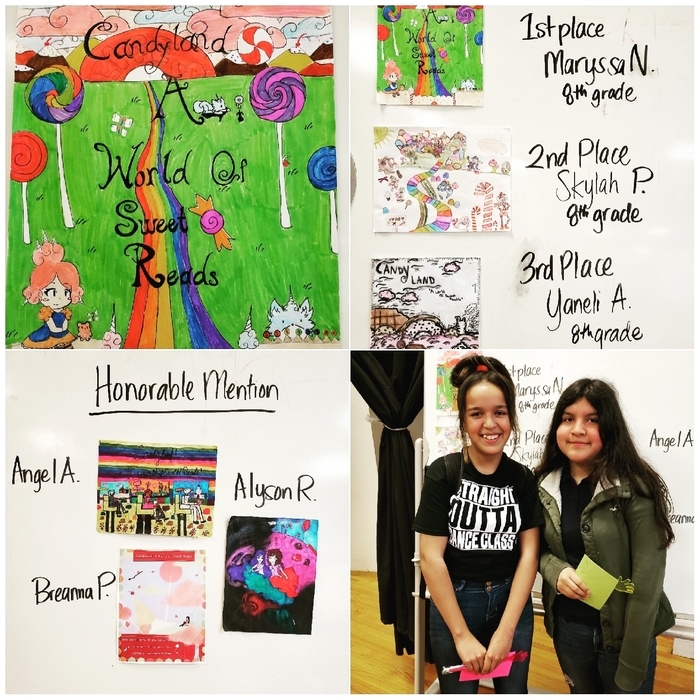 Congratulations to our Book Fair Poster contest winners, especially our 1st place winner, Maryssa N. There were so many great entries for our candyland book fair theme. The book fair continues until Friday. Get some books before Spring break. 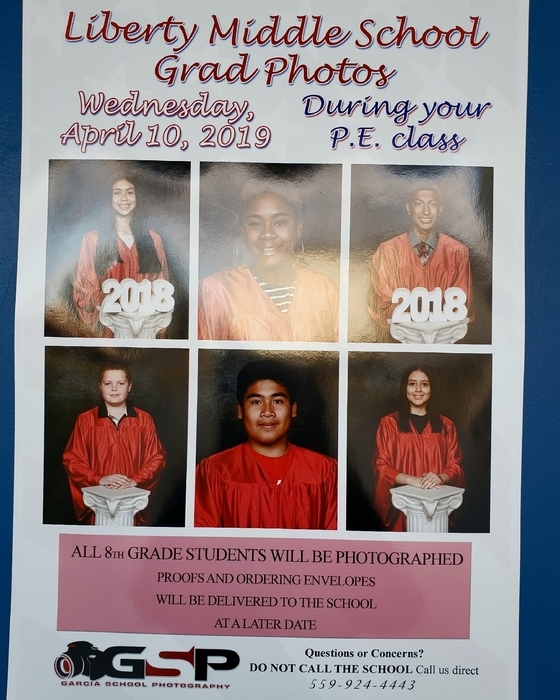 Just a reminder that picture day for 8th grade graduation pictures is tomorrow, April 10th, during scheduled PE classes. 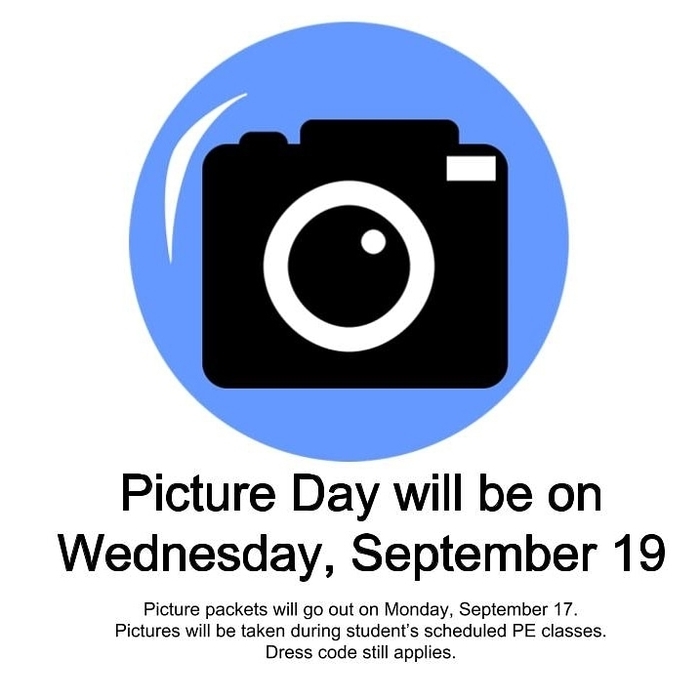 Students will be provided a loaner gown for pictures. 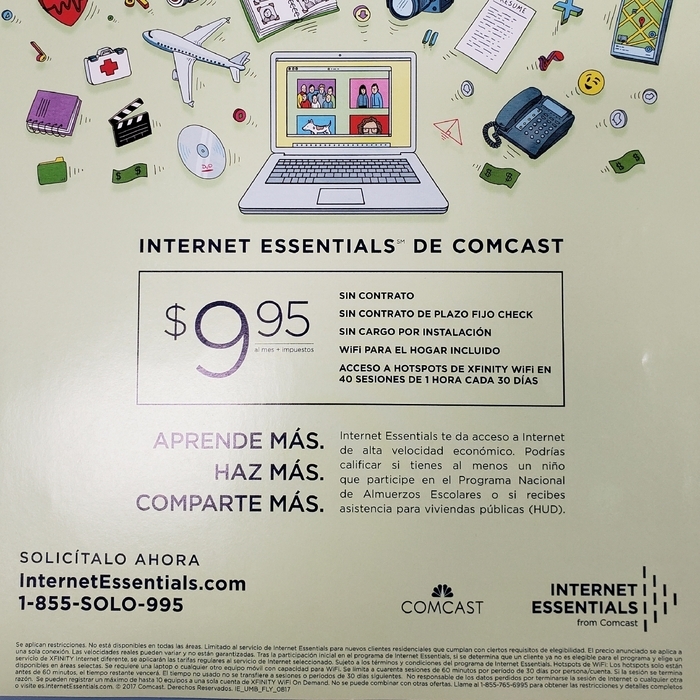 A proof with purchase options will be given to students at a later date. 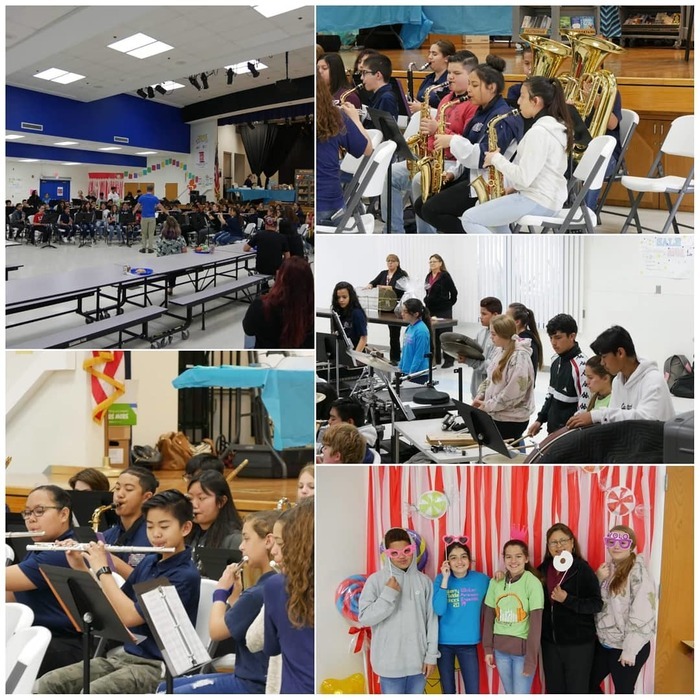 Thank you to all the parents/guardians and staff that were able to attend this morning for our book fair kick off event, featuring the symphonic band and our dance elective. Our Book fair continues until Friday, March 12th. During break, lunch and after school until 4pm. Just a reminder that Monday, April 8th is NOT an early out day. Friday, April 12th is an Early out day for Spring Break. 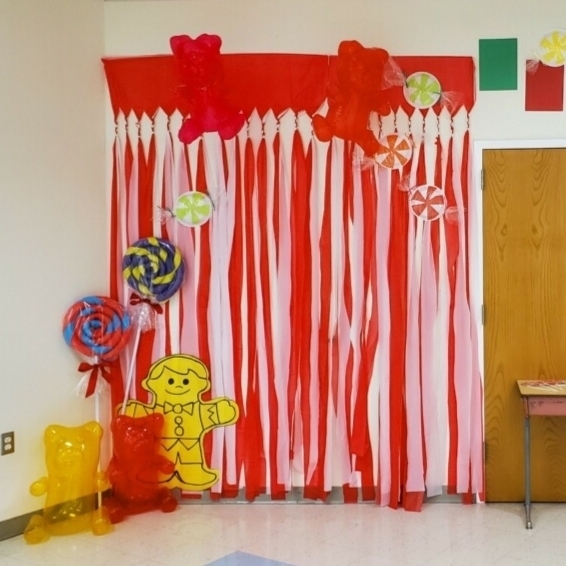 We hope you can join us Monday April 8th, in the Cafeteria, for our book fair kick off event. Doors open at 745am until 845am. 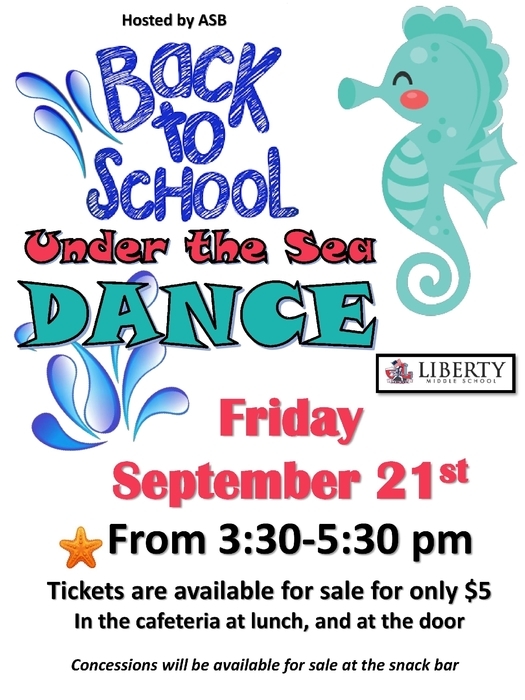 Lots of amazing books, breakfast with your liberty student and performances by the liberty symphonic band (8:15) and dance elective (8:30). Thank you for your support! 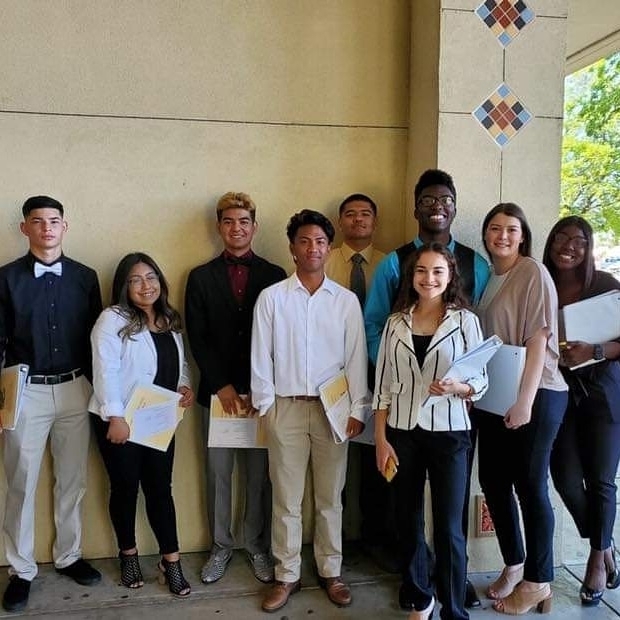 Just a small group of our prior students getting ready to do their Senior Exit Interviews today at LHS. Always a great day getting to see our students and how they have matured and hearing about their next steps and plans for the future. 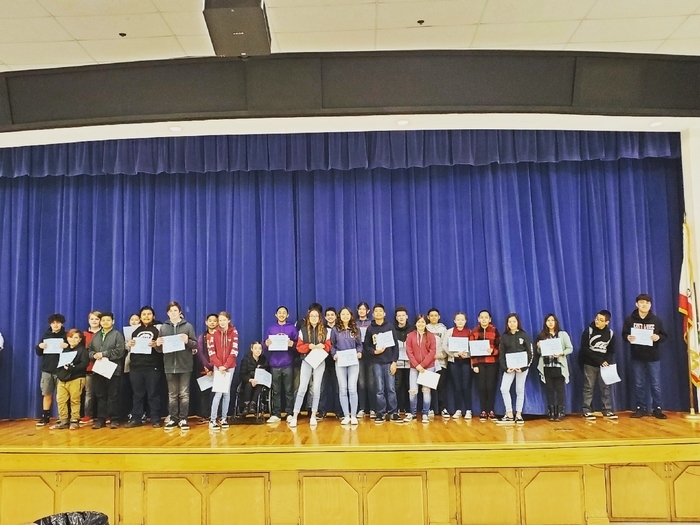 Way to go Class of 2019! So excited for you! Due to rainy weather conditions, baseball and softball practice has been cancelled for today, Tuesday, April 2. 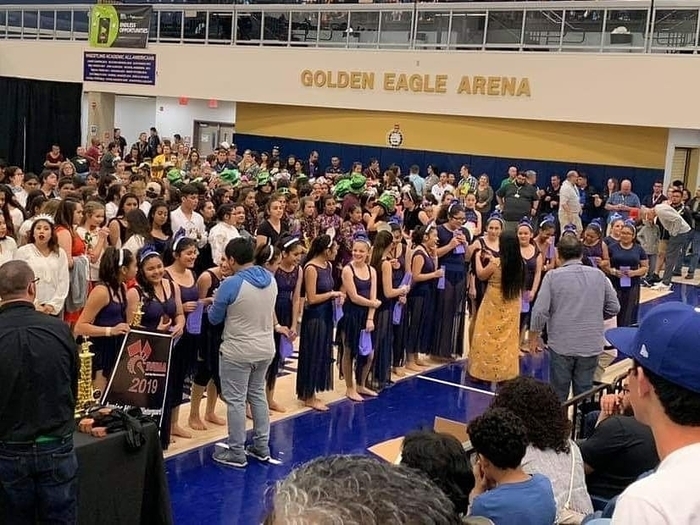 Liberty winter guard also took first in the SVWAA Finals! So happy for all of these hardworking students and staff. It was a good day to be a Patriot. 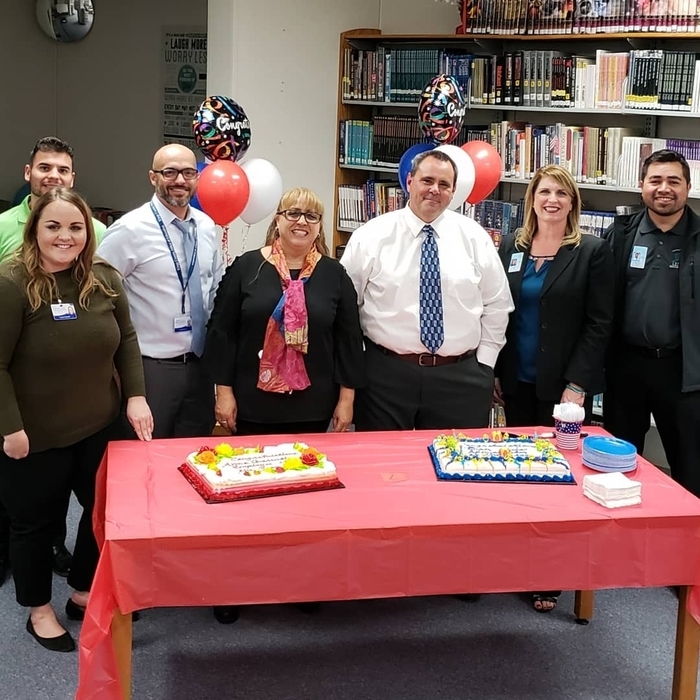 Congratulations to our Liberty Principal, Ben Luis, who qualified as a finalist for Administrator of the Year for the Excellence in Education awards. Go Patriots! The Baseball game scheduled for today, March 29, has been cancelled. We have just been notified that due to illnesses, Kings River Hardwick does not have enough available players. Sorry for the inconvenience and thank you for your support. 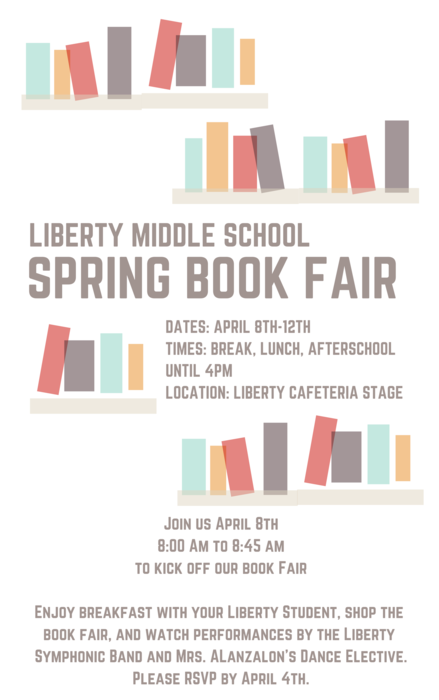 Just 10 more days until our Spring Book Fair. 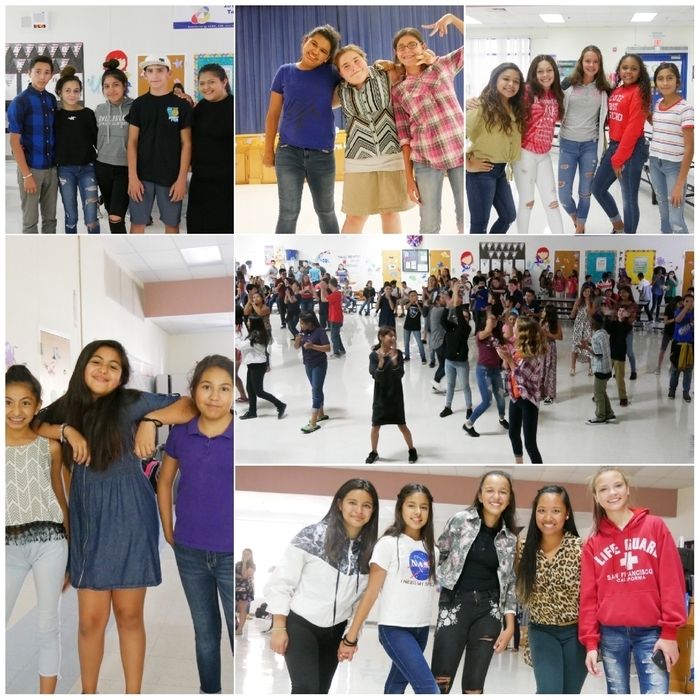 RSVP for our Kick Off Event with performances by our Liberty Symphonic Band and Mrs. Alanzalon's Dance Elective on April 8th. 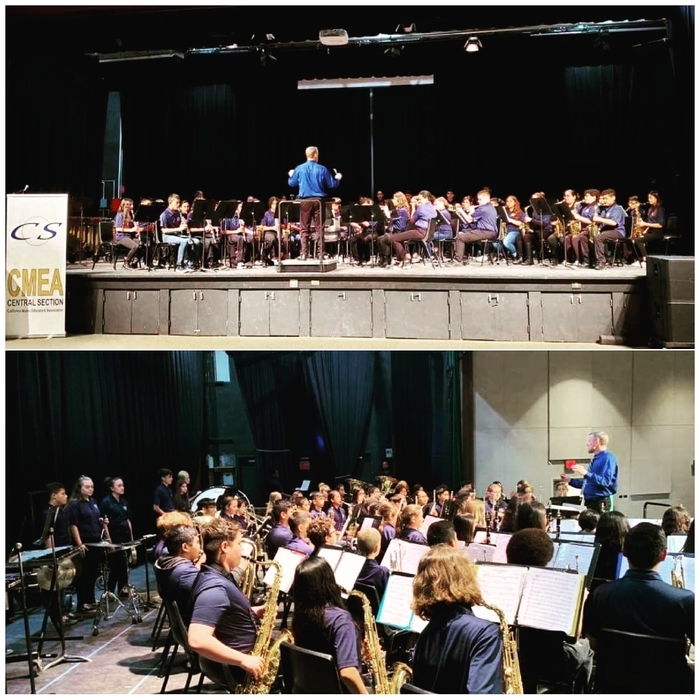 Great performances today by the Liberty Concert Band and Symphonic Band at the CMEA Festival at Kingsburg High School! Due to weather conditions,Caruthers school has canceled the softball game against Liberty for today, March 20. We are sorry for the inconvenience. Hello 8th grade parents. 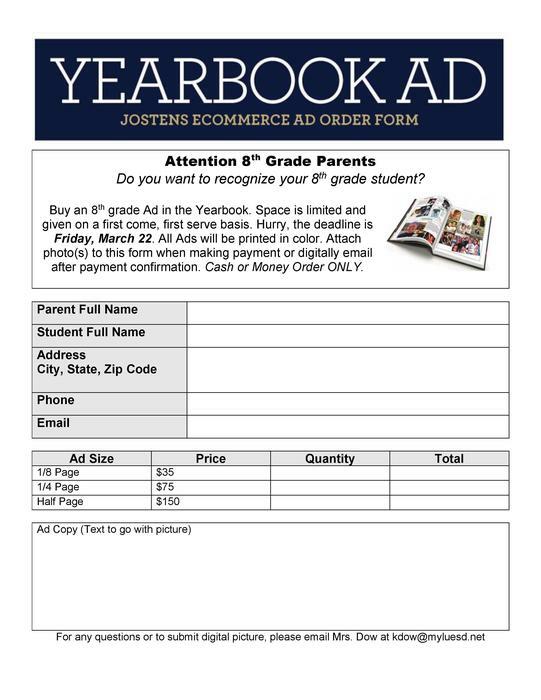 If you haven't purchased an 8th grade Yearbook ad for your student, but would still like to. The time is now. 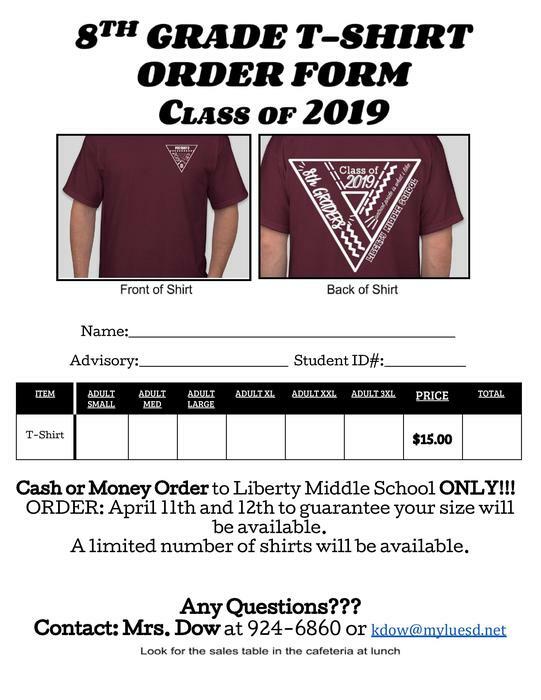 All forms and payments must be in by this Friday, March 22. Cash and Money Orders ONLY. Graduation Gowns are now available for purchase for $15.00; Cash or Money Order ONLY. All students who participate must have a gown. If you do not participate in the ceremony, a full refund will be given. 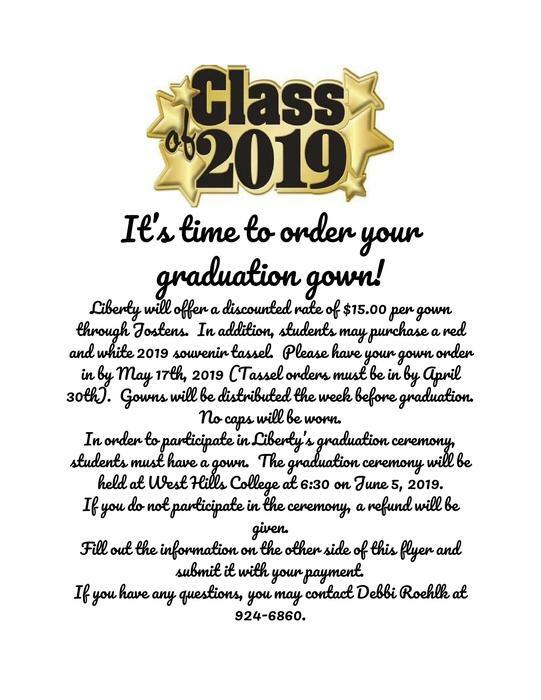 You may purchase your gown from student services, media center, and Mrs Roehlk in the office. It's not too early. Don't wait, order yours soon! Please return payment with order form. 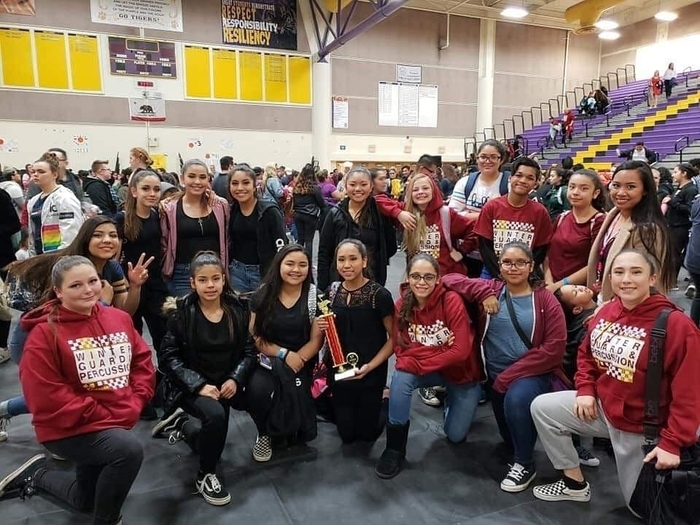 Congrats to the Winter Guard and Percussion who both took 1st place at the SVWAA show at Lemoore High School on Saturday. 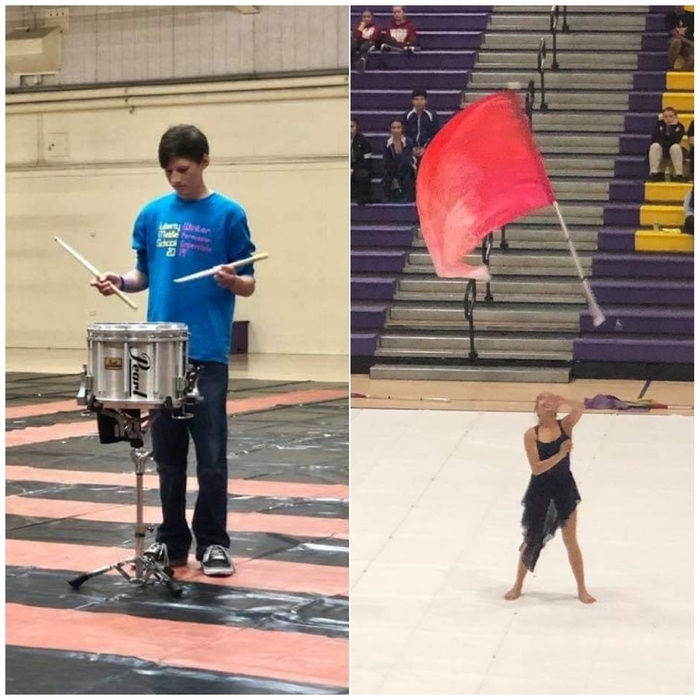 Great job also to our solo competitors, Ryan Ohrt, 1st place snare drum solo, and Liberty Joy Banania, 2nd place mixed guard solo. Come see both groups at Championships hosted at West Hill College on March 30th. 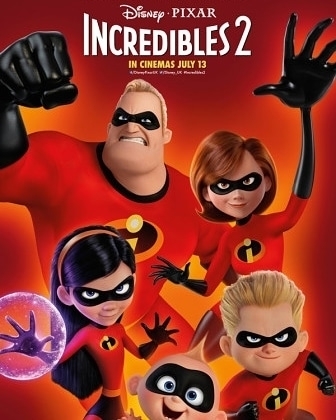 Your family is invited to come by and watch the Incredibles 2 at our school. Friday march 22, Located in the liberty cafeteria. Concessions and food vendors. Movie starts at 5pm Anyone dressed in their pajamas will receive free popcorn. We hope everyone can join us. 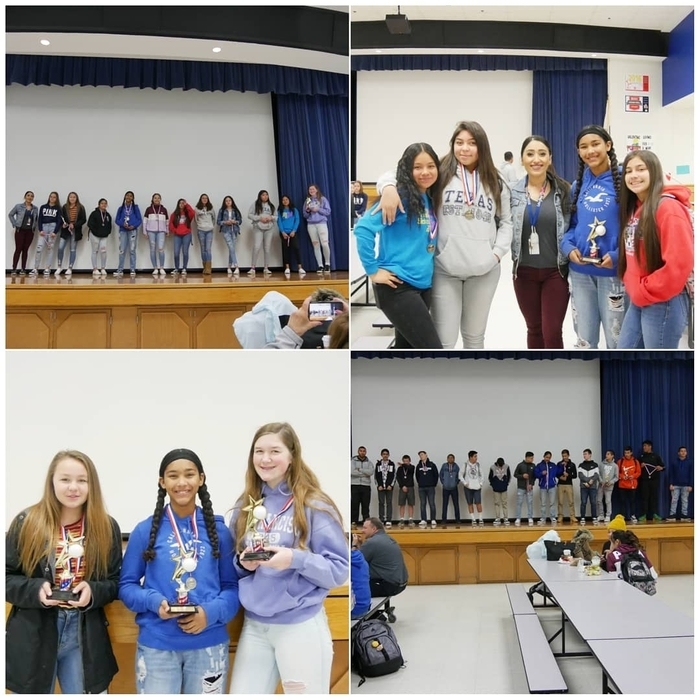 These amazing students of the month showed tremendous patriot EFFORT in their classes. We were so happy to celebrate them this week. Keep up the good effort as we continue our benchmark testing on Monday. 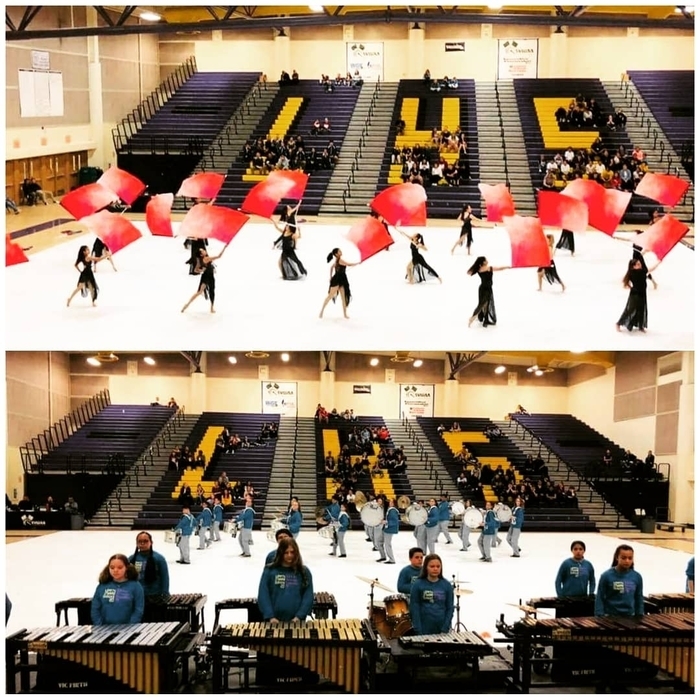 Great Job Winter Guard and Winter Percussion on your performance at the San Joaquin Valley Color Guard and Percussion Review hosted at Clovis North High School last night. Both groups took 3rd place in their division. Great Job! 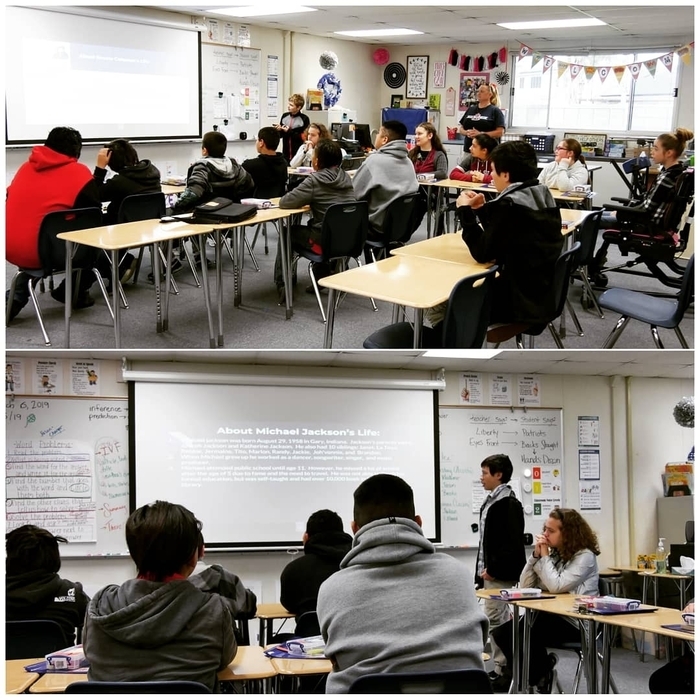 Classroom spotlight: Mrs Lackey's class, at Liberty, has been researching African American historical figures in class. Students checked out books and researched online for information. They then shared their presentations in front of their entire class. 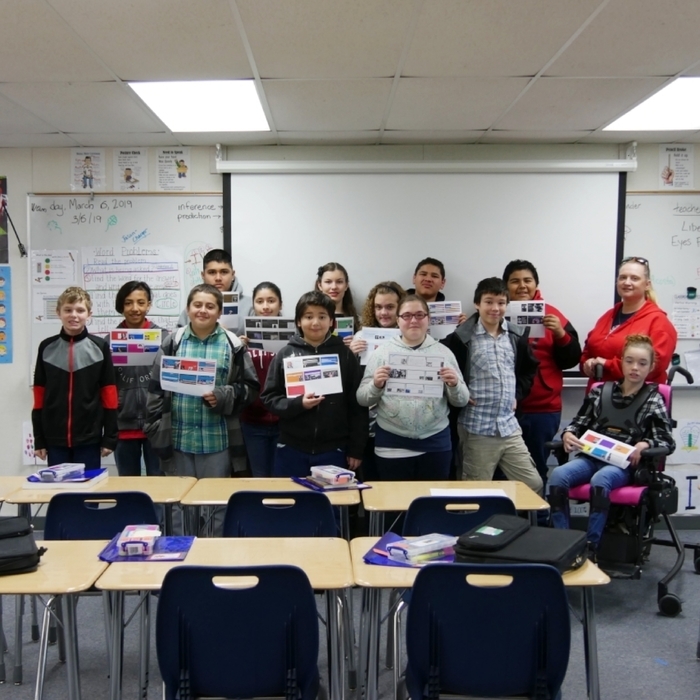 Students learned about these amazing people as well as how to create presentations and citing their resources through a bibliography. We are so proud of their hard work and effort. Don't forget to Spring Forward on Sunday for Daylight Savings Time. Get some well needed rest for Benchmark testing starting on Monday in ELA classes. Also just a reminder that 3/11-3/13 we are on Early Out Schedule for Parent Teacher Conferences; school ends at 1:38pm. Benchmark testing starts next week in student's scheduled ELA classes. 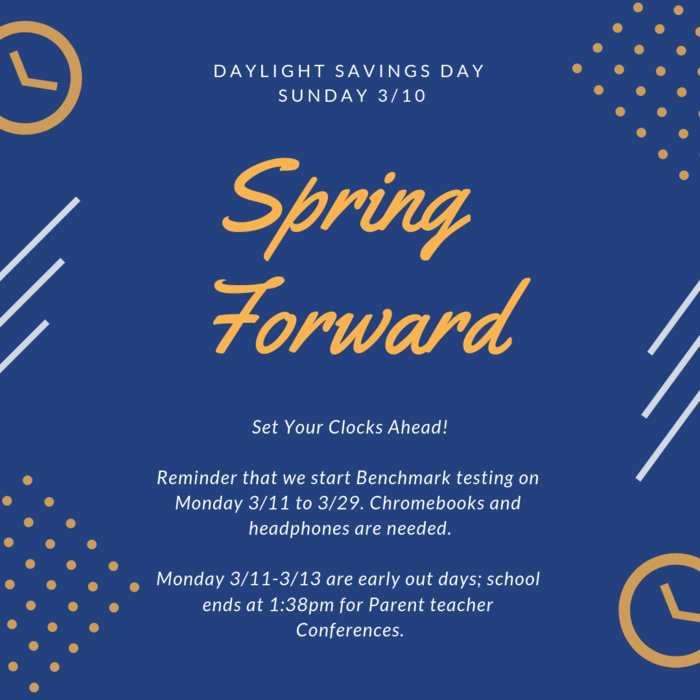 Please make sure your student is on time and has a charged Chromebook and earphones for testing. Good Luck, Patriots. 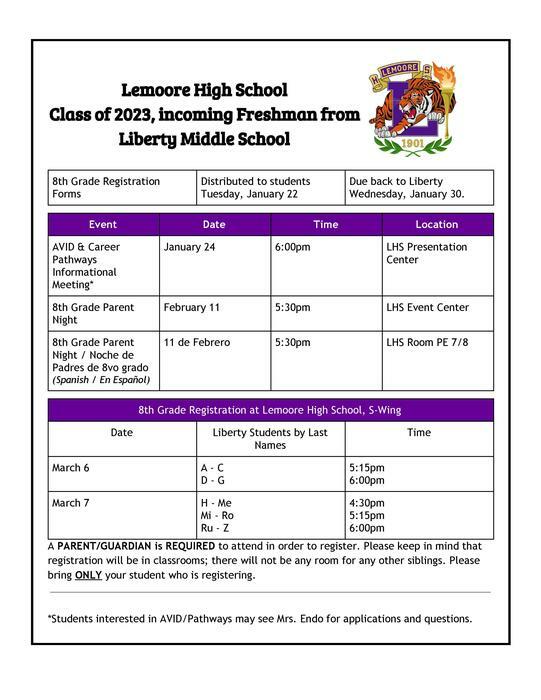 Lemoore High School Registration starts today for Liberty Students. This is our Liberty Baseball and Softball Season. Our first Home games starts on Monday, March 11. We hope you can come and cheer on our teams this season. 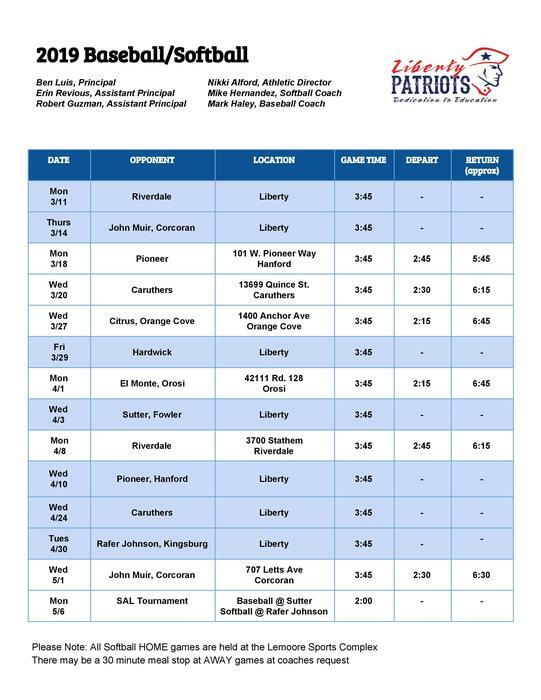 Reminder: All Home Games for Softball are at the Lemoore Sports Complex. Wonderful time watching our music programs perform this morning at the annual Pancake Breakfast. Despite the crazy burst of rain, we had a wonderful turnout thanks to the fabulous parents and community. 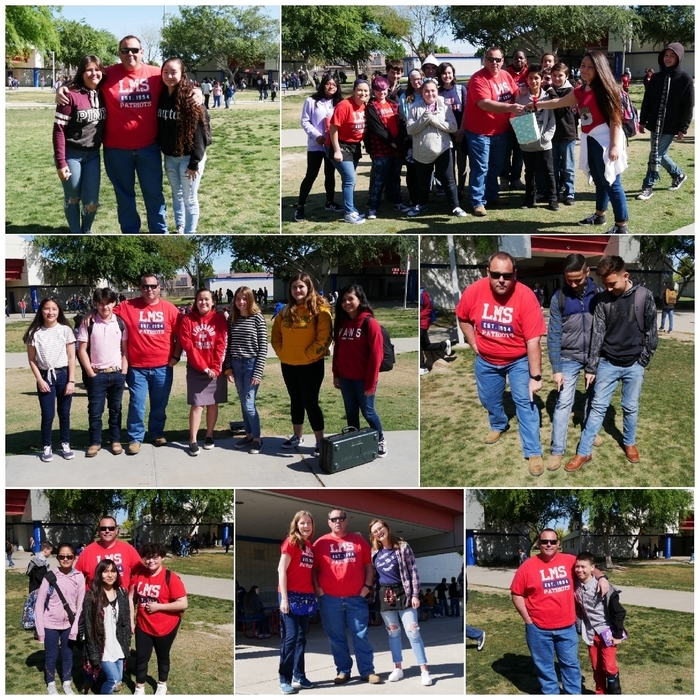 Thank you for coming and celebrating our music department and thank you to all of the hard work of our parent volunteers, student volunteers- and ASB and Music department teachers for all of your hard work- as well as our other teachers and custodial crew for making this event happen! 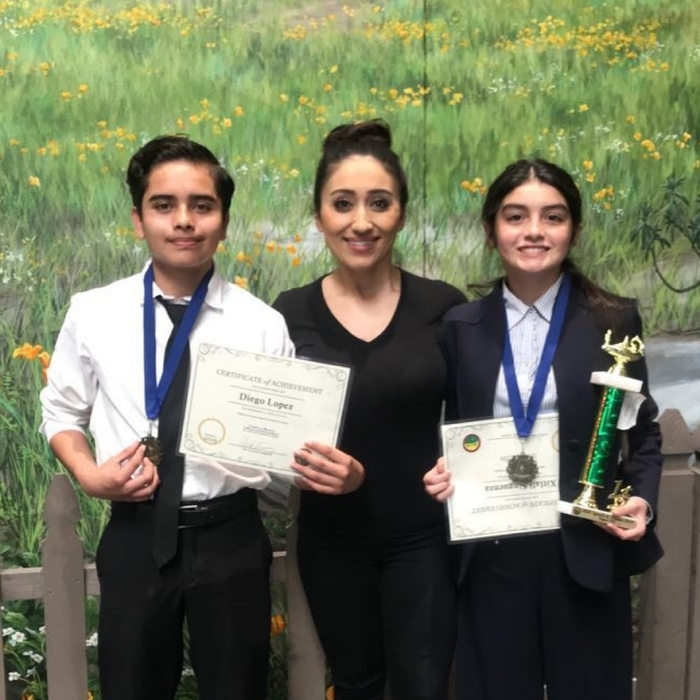 A BIG Congratulations to Xitlali Siguenza and Diego López, along with their teacher coach Llamas, for their participation in the speech and debate competition. Xitlali got 1st place and qualified for state championships in Ventura, and Diego Placed 2nd. 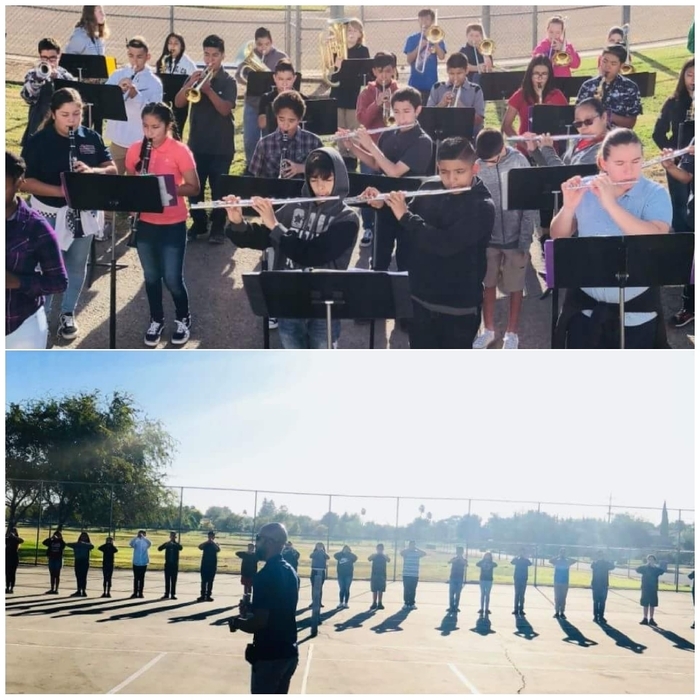 These two students have been practicing after school all year long and we are so proud of their hard work. Nerdy fun Friday. 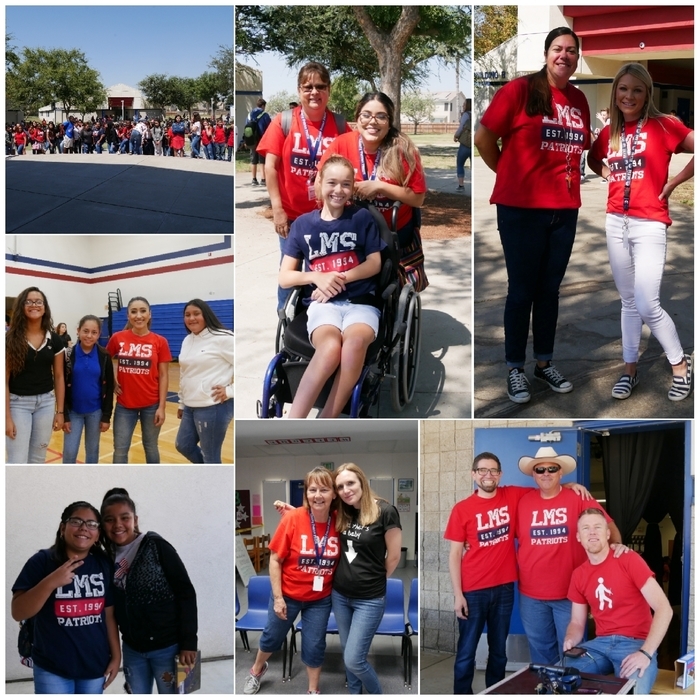 We hope you have an amazing weekend and hopefully you join us tomorrow for the LUESD annual pancake breakfast. 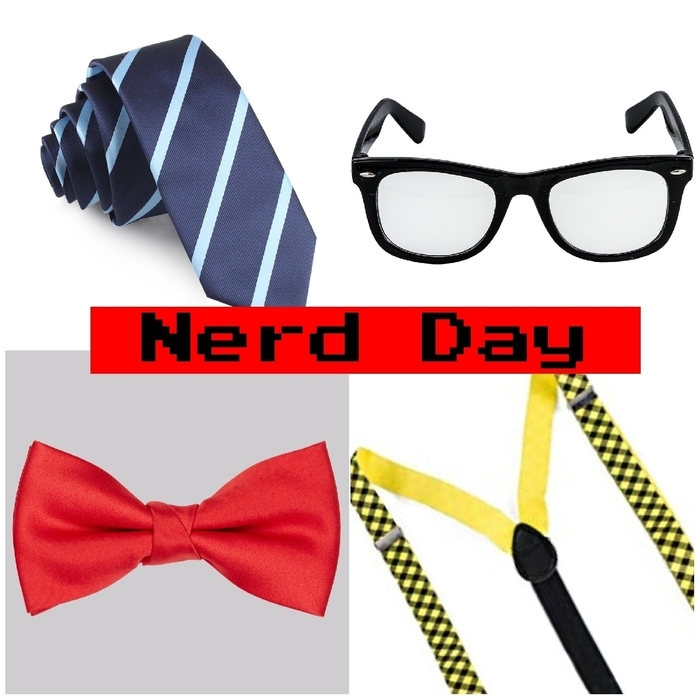 Tomorrow, Friday March 1st, is Nerd Dress Up Day. 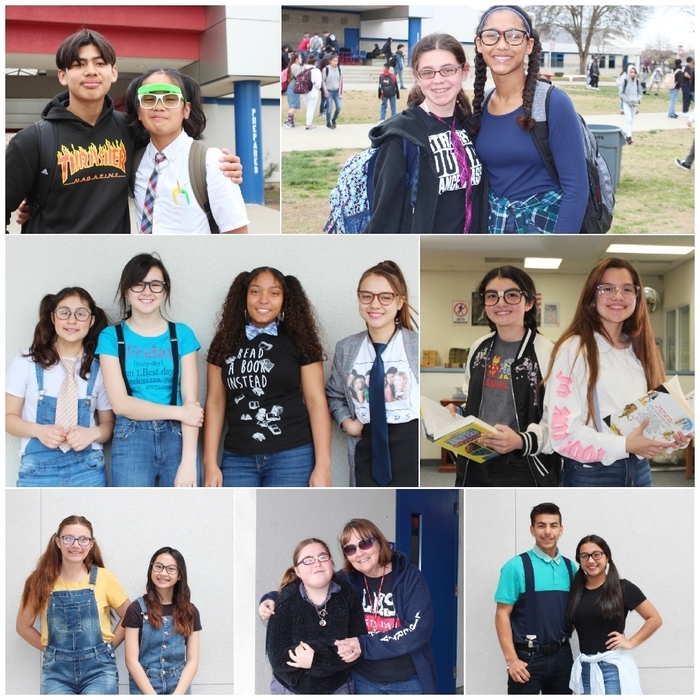 If students are clearly participating in Nerd Day, they do not have to wear a collar. However, all students who are not participating need to be in dress code. 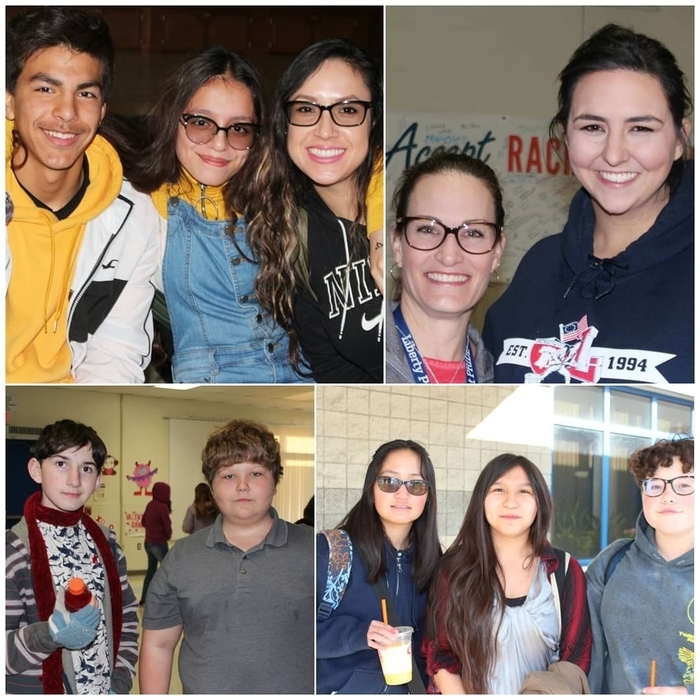 Just a friendly reminder that High School Registration is NEXT week, Wednesday, March 6 and Thursday, March 7 at Lemoore High School. A parent/guardian is REQUIRED to attend in order to register. 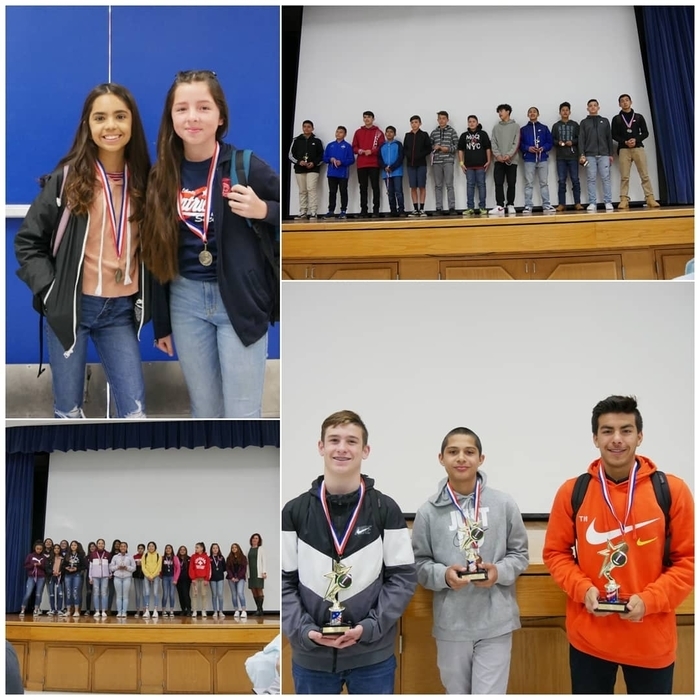 Congratulations to our Boys and Girls A basketball Teams. They finished their seasons out with Boys 3rd Place and Girls 2nd Place at the SAL Basketball tournament. We are so proud of their hard work all season long. Baseball and Softball Tryouts start today afterschool. 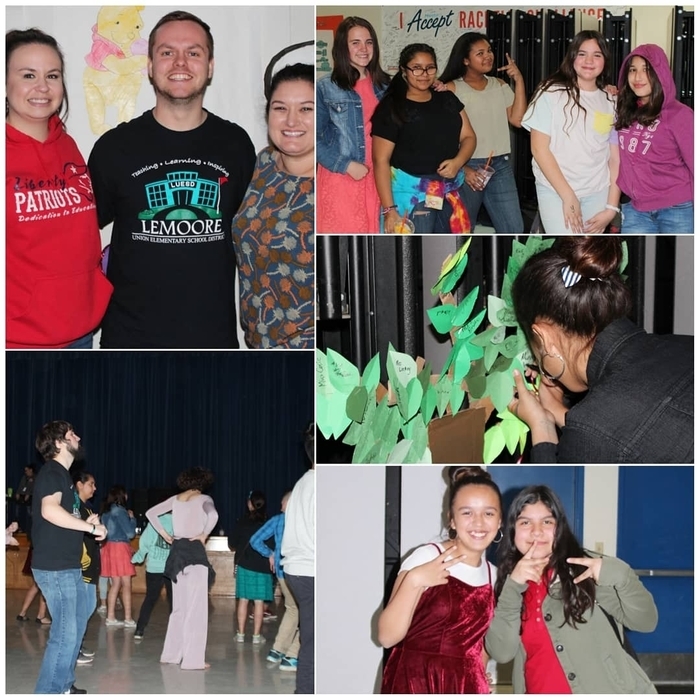 Thanks to all the students and staff that were able to attend our Valentine's Dance after-school today. Have a great weekend, Patriots. 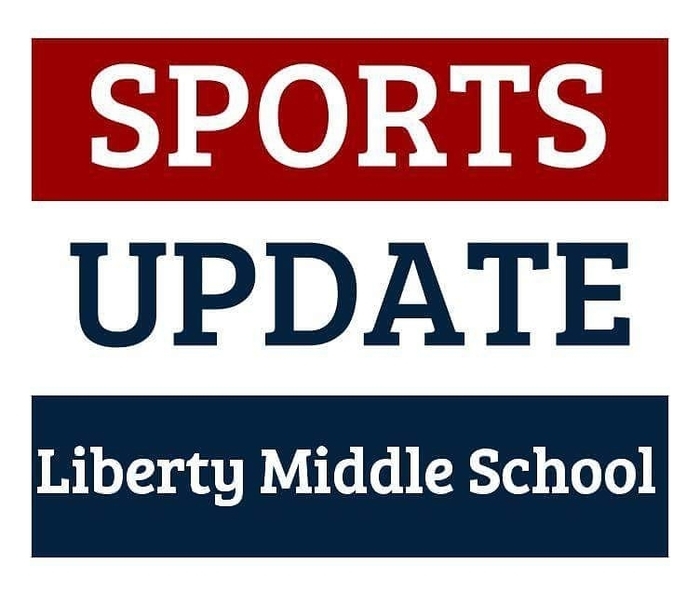 Due to rainy conditions, both Girls and Boys B Basketball Teams will be playing today, Thursday, February 21, on the same court in the GYM (HALF COURTS). They will both start at 3:30pm. Followed by Girls A Team (FULL COURT) and Boys A Team (FULL COURT). Unfortunately with scheduling conflicts our Percussion and Colorguard will not be performing this Saturday at Sierra Pacific. But we have some many more opportunities to see our amazing students, including our pancake breakfast and many upcoming events in March. Baseball and Softball tryouts start next week 2/26-2/28. 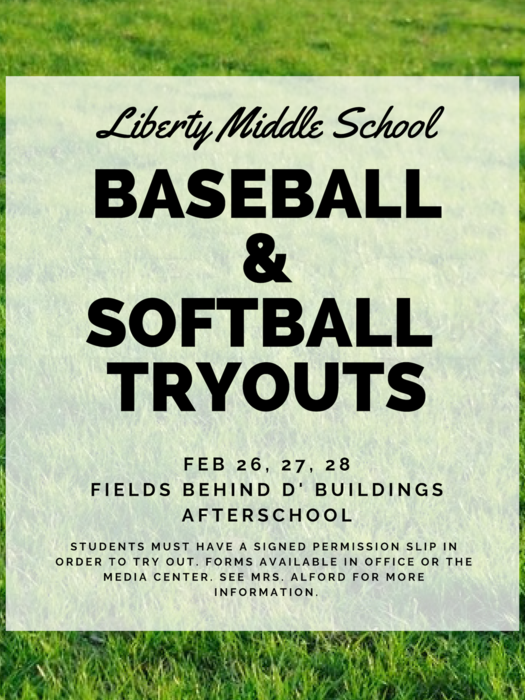 Permission slips are available in the office or Media Center to all students that would like to try out for our Baseball and Softball Teams this year. Good Luck! The Basketball tournament orginally scheduled for Saturday, February 23 has been rescheduled for Monday, February 25. Only A teams will be participating in the tournament. Thank you for understanding and for your season long support! 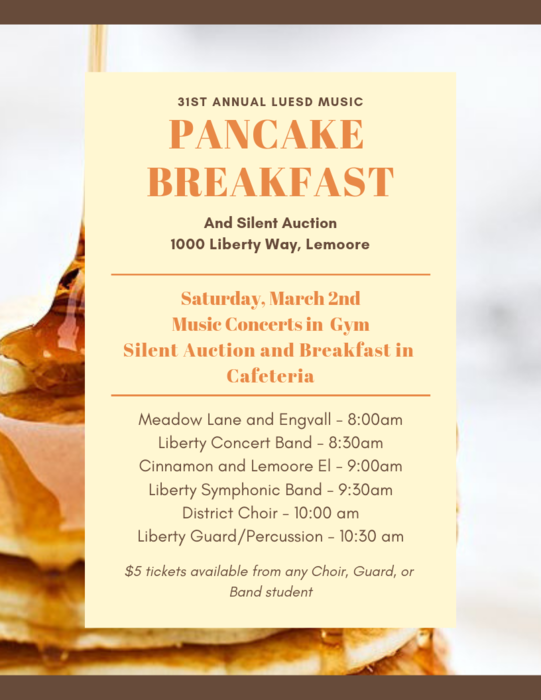 LUESD Pancake Breakfast tickets are now available from any Band or Choir Student. We hope that you join us! If you'd like to donate to our silent auction, there is still time. Please contact our ASB advisors: Mrs. Oliveira and Mrs. Swafford. Thank you for your support. 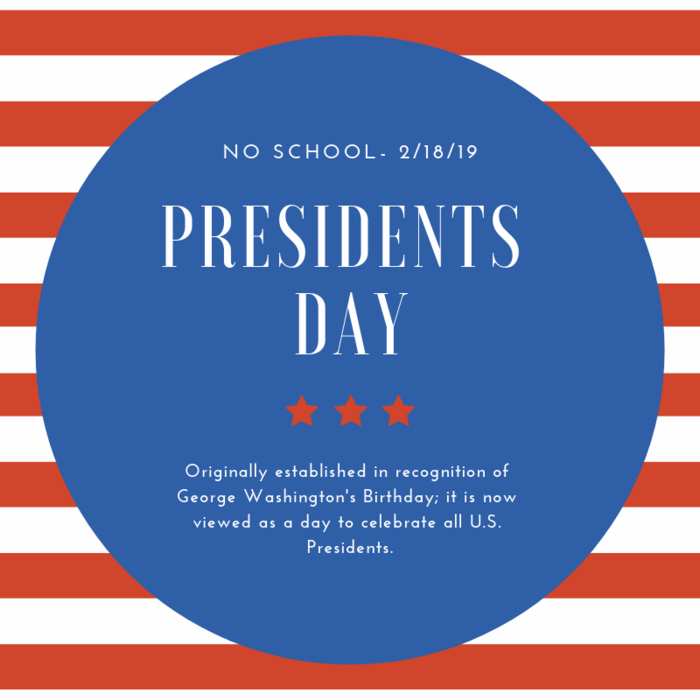 Just a reminder that there is no school on Monday, February 18, 2019, in observance of Presidents Day. Due to weather conditions, both Girls and Boys B Teams will be playing today, Friday, February 15, on the same court in the GYM (HALF COURTS). They will both start at 3:30pm. Followed by Girls A Team (FULL COURT) and Boys A Team (FULL COURT); Their start times will vary. Due to the rainy weather conditions, it was determined at 12:30 that outdoor Basketball games for B team boys and B team girls has been cancelled. Both A teams will continue to play their indoor games at the regular start time. We apologize for the inconvenience and thank you for understanding. 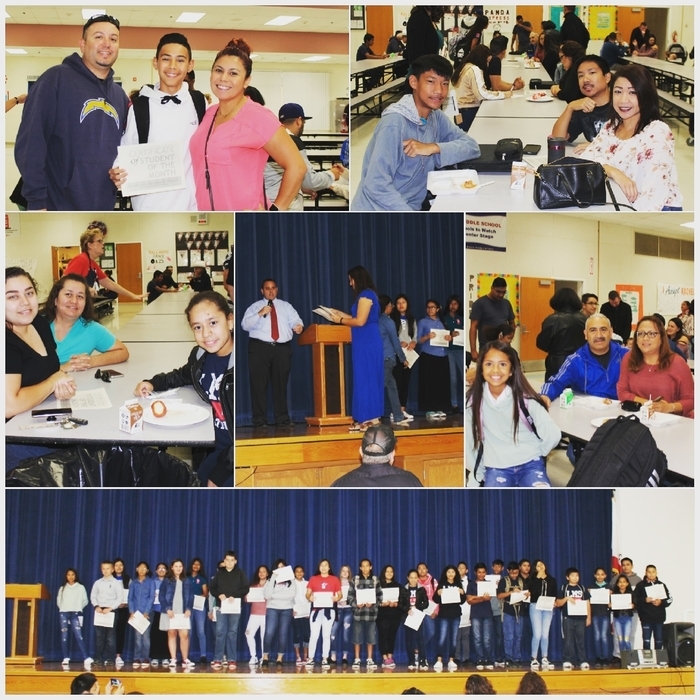 Thank you to all the parents and guardians that were able to attend our celebration of our athletes here at Liberty in the morning. 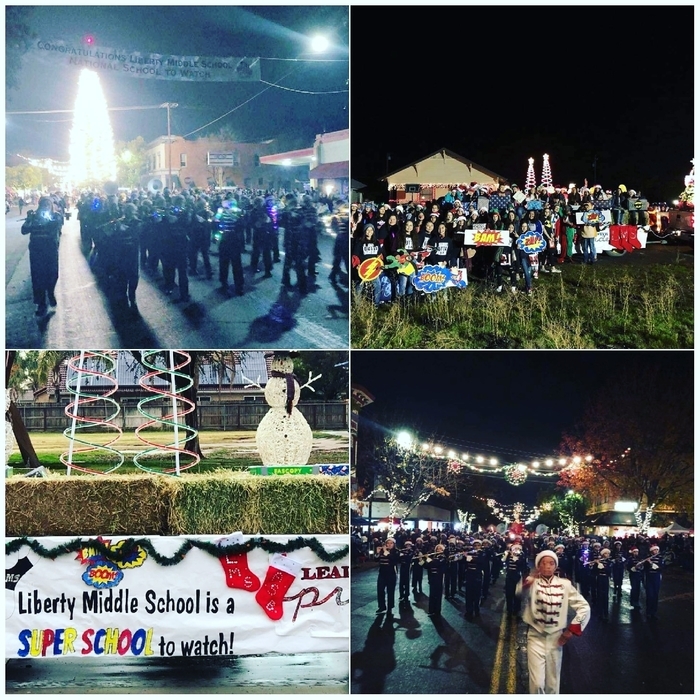 We are so proud of all of our students' hard work and for representing Liberty with Pride. 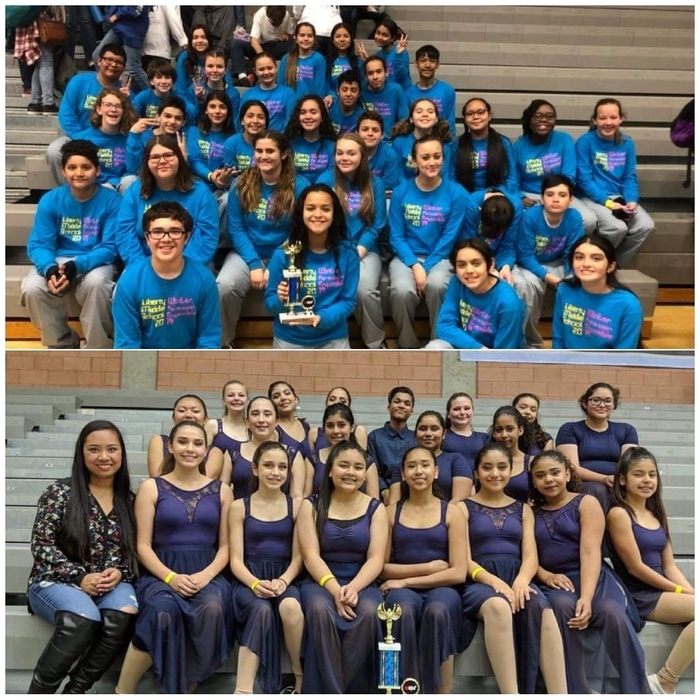 Congrats to Liberty Winter Guard and Winter Percussion. 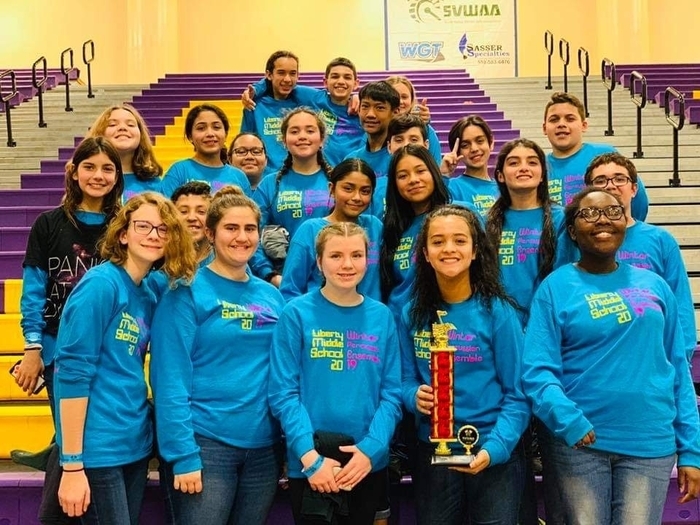 Both groups won their divisions at the first competition of the South Valley Winter Arts Association. Great job! If you missed us this round, please check out our teams on Feb 23 at Sierra Pacific in Hanford. 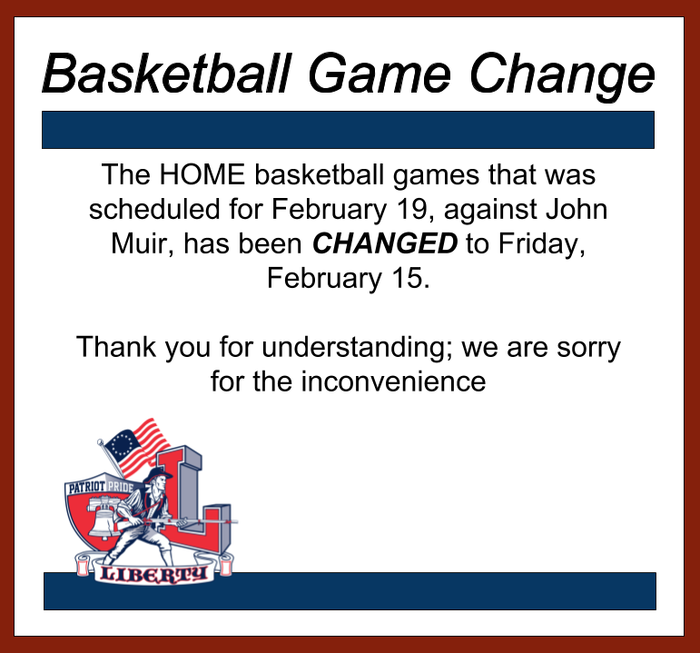 Basketball Notice: The game the was originally scheduled against John Muir at Home, on February 19 has been CHANGED to Friday, February 15. 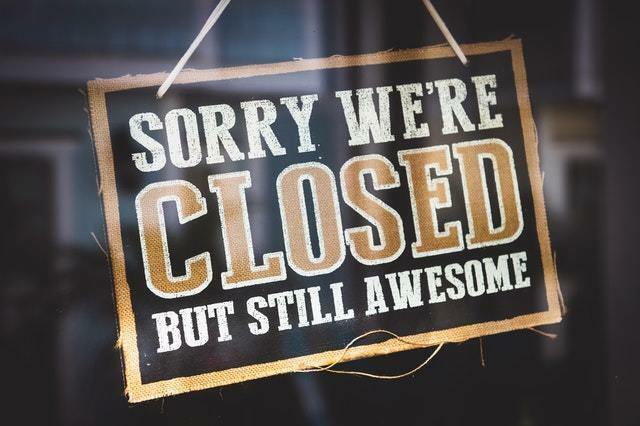 Thank you for understanding and we are sorry for the inconvenience. Just a reminder that 8th grade parent night is on Monday, February 11. All 8th grade parents are encouraged to attend at the LHS Event Center at 5:30pm. 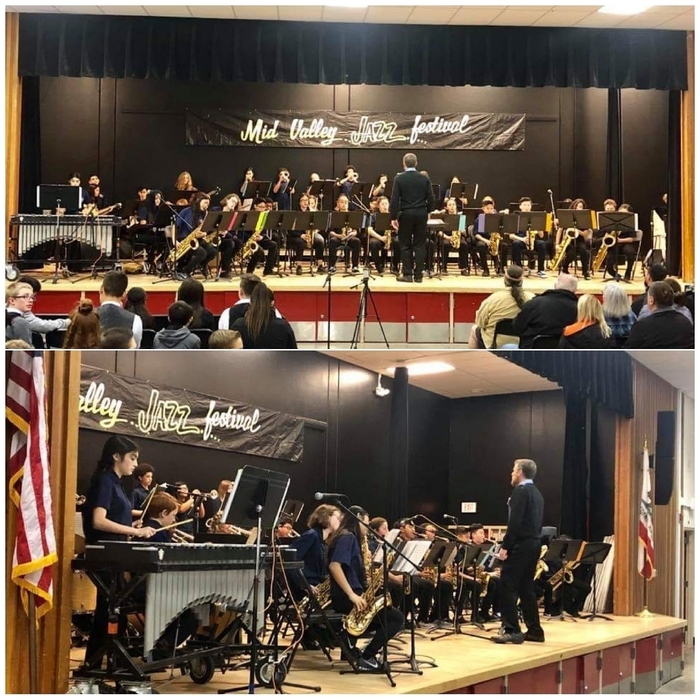 Great performance today by the Liberty Jazz Band at the Mid Valley Jazz Festival in Tulare! 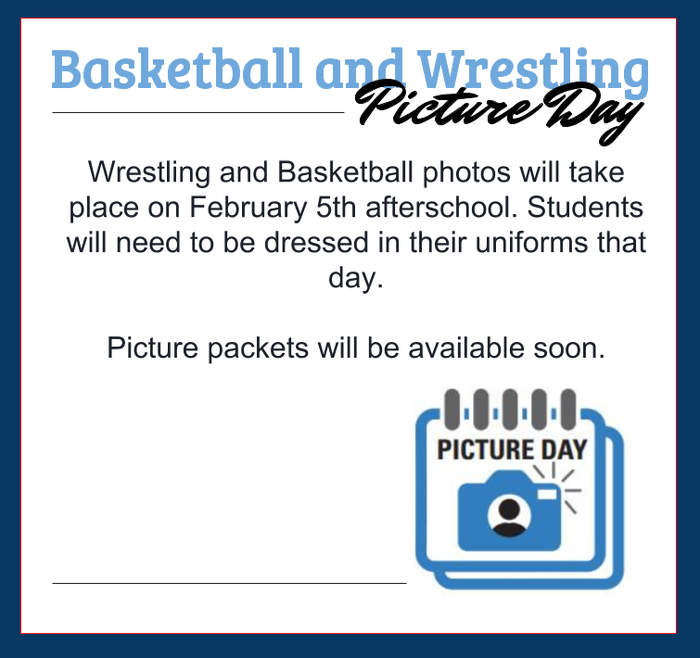 Wrestling and Basketball Teams will be taking pictures after school on Feb 5th. Picture packets will be distributed shortly. 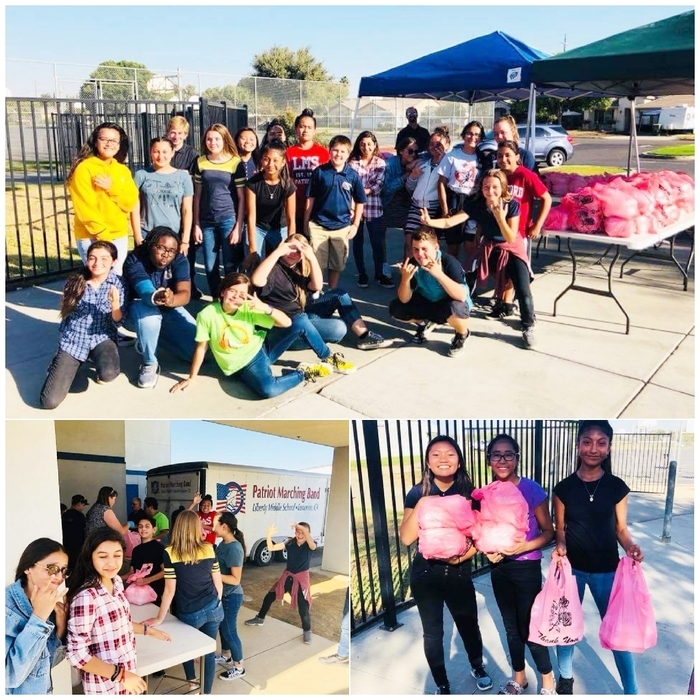 https://5il.co/6cyu Check out the link to our LUESD District Newsletter and see all the amazing things happening at Liberty and our District, this past winter. Lemoore Area Schools including Liberty Middle School is on PLAN A for January 30th. Class times are 9:45 –3:36. Buses will be delayed 1 1/2 hours. Don't forget to turn on your car lights as you drive safely today. Lemoore Area Schools including Liberty Middle School is on PLAN A for January 29th. Class times are 9:45 –3:36. Buses will be delayed 1 1/2 hours. Don't forget to turn on your car lights as you drive safely today. Girls basketball teams will not play tomorrow, January 29th. Boys basketball teams will play tomorrow against Island. 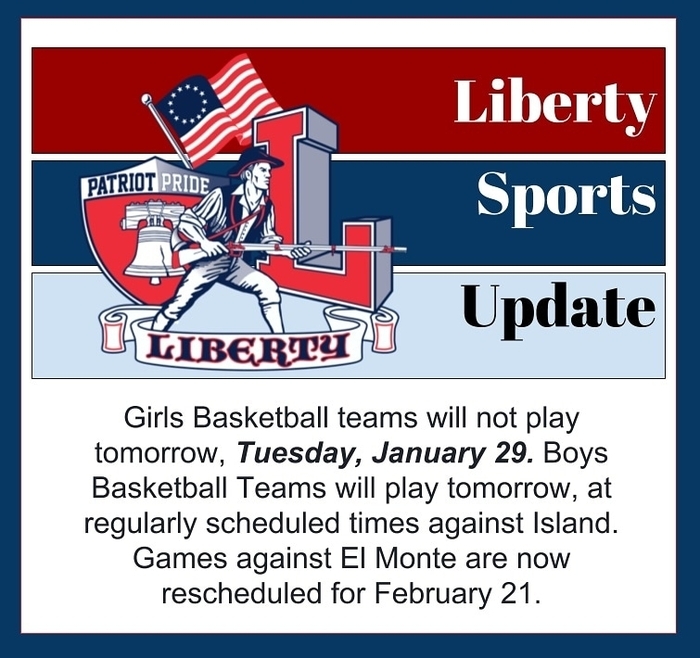 Basketball games against El Monte are rescheduled now for February 21. Due to foggy day schedule: coffee with the superintendent has been cancelled and will be rescheduled for a later date. We are sorry for the inconvenience. 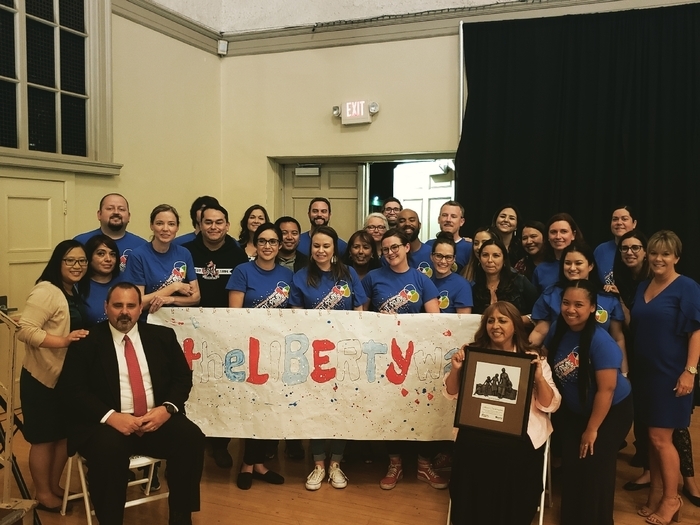 Lemoore Area Schools including Liberty Middle School is on PLAN A. Class times are 9:45 –3:36. Buses will be delayed 1 1/2 hours. 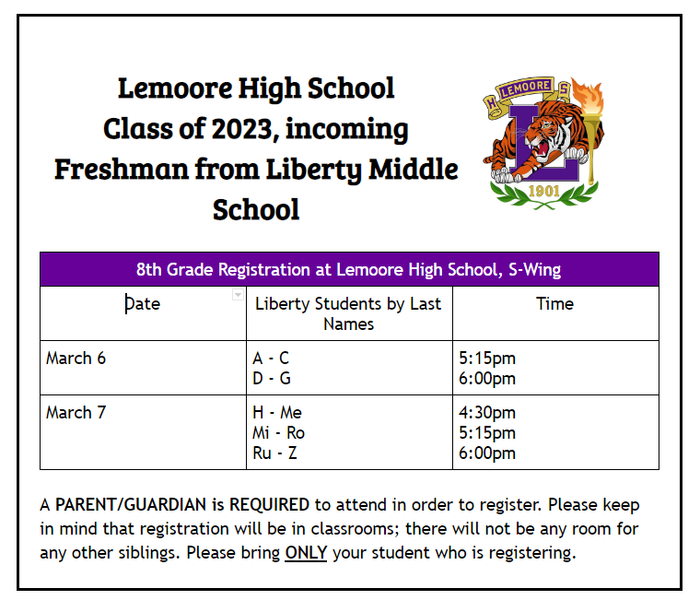 Important information regarding 8th Grade Lemoore High School registration. Please fill out the forms given to students TODAY, January 22, and have them returned no later than Wednesday, January 30. 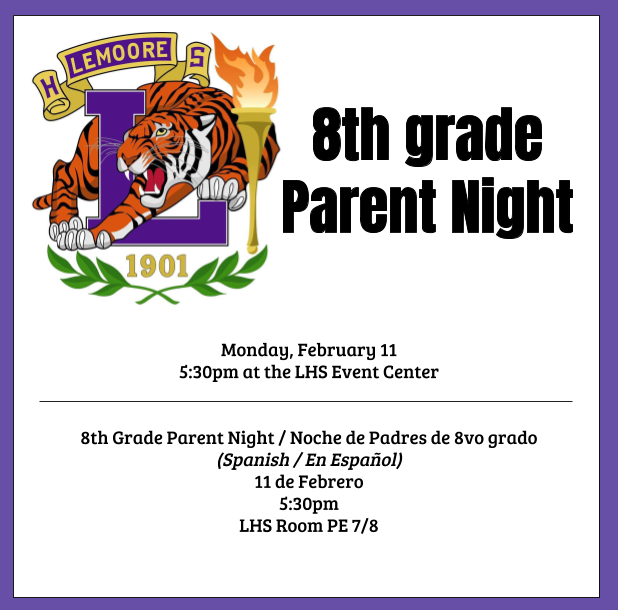 Parents are also encouraged to attend the Parent Night at Lemoore High on 2/11. 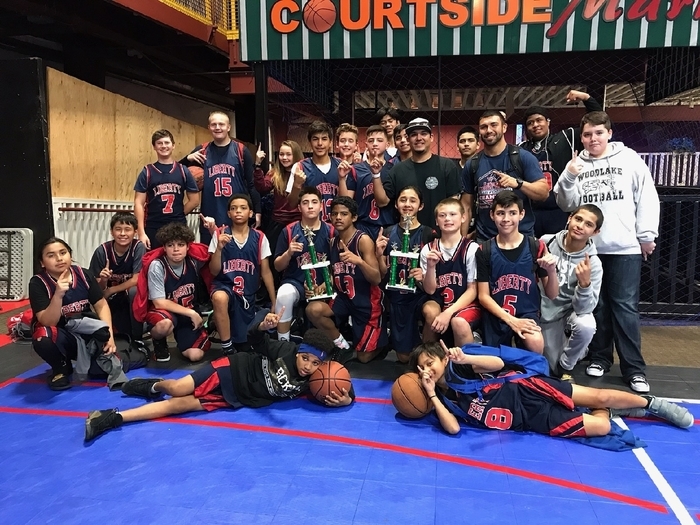 Congratulations to our A and B boys l basketball team who took 1st place this weekend. 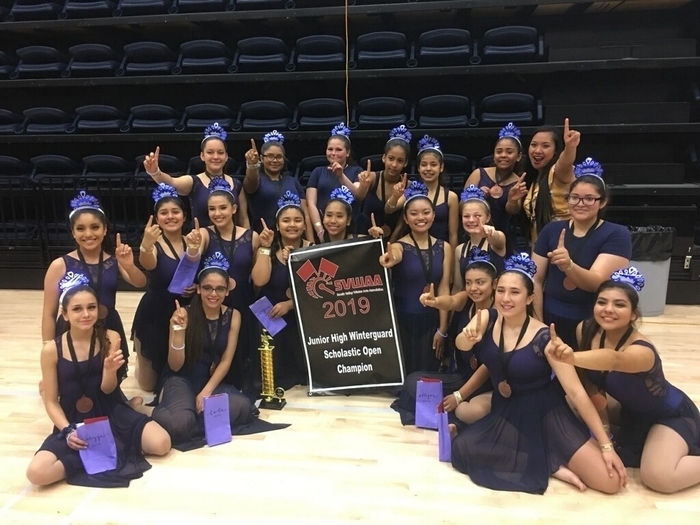 Amazing job to our athletes and our coaches Gamboa and Hernandez. The B Girls Basketball game has been cancelled today, January 18. All other teams will still be playing today at our AWAY game. We are sorry for the inconvenience. 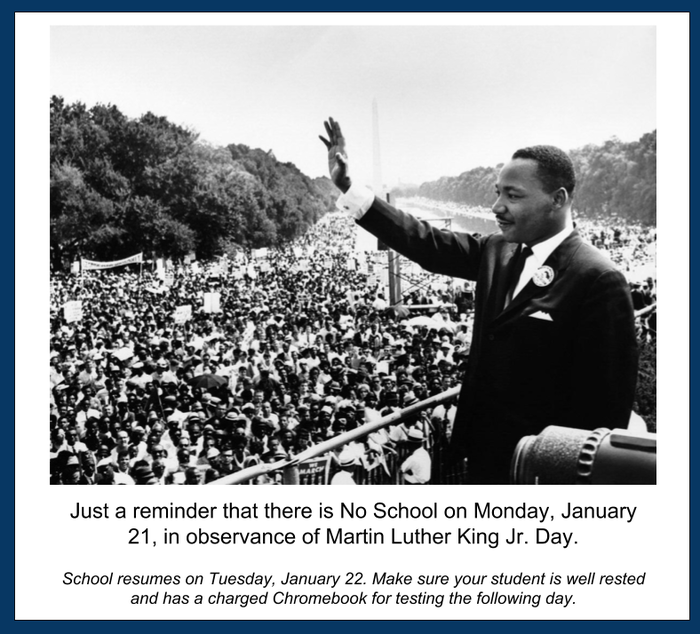 Just a reminder that there is No School on Monday, January 21 in observance of MLK Day. School resumes on Tuesday. Have a great weekend. Apologies for the lateness of the basketball Schedule. Good luck to our Patriots today against Kings River Hardwick at Pioneer Middle School. We hope to see you at our next home game next Wednesday. 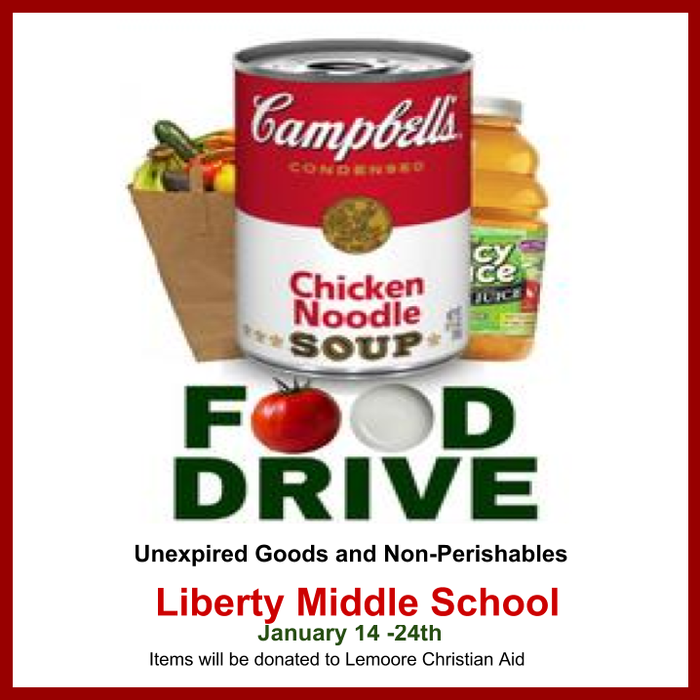 Liberty Middle School is having a can food drive starting this week until next week. We are trying to donate more than we had last year. 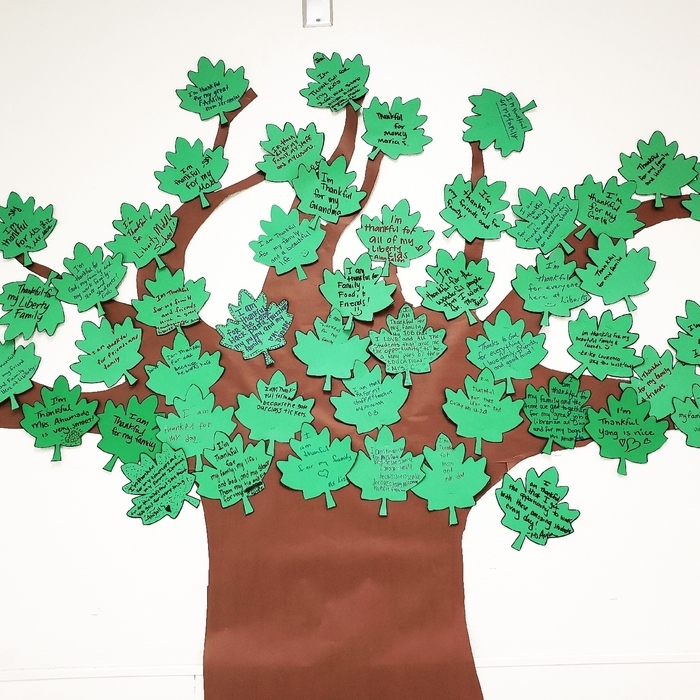 Please help us make our goal. Thank you for your support! 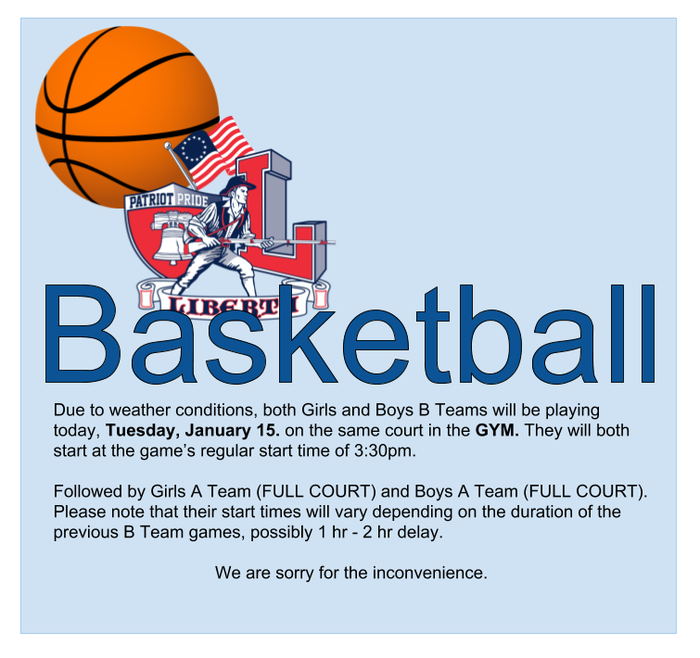 Due to weather conditions, both Girls and Boys B Teams will be playing today, Tuesday, January 15. on the same court in the GYM (HALF COURTS). They will both start at the game’s regular start time of 3:30pm. Followed by Girls A Team (FULL COURT) and Boys A Team (FULL COURT). District Benchmark testing start on Monday 1/14 to 2/1 in student's scheduled classes. Students should bring a charged Chromebook to school every day and also bring their earphones for testing. Good luck, Patriots! Sports Notice: Wrestling has been cancelled for tomorrow, Wednesday, January 9th. We are sorry for the inconvenience. Just a reminder that we start school again tomorrow, Monday, January 7th. We hope you had a great winter break and are ready to learn! Happy new year, Patriots. Enjoy the rest of your winter break. See you January 7th. 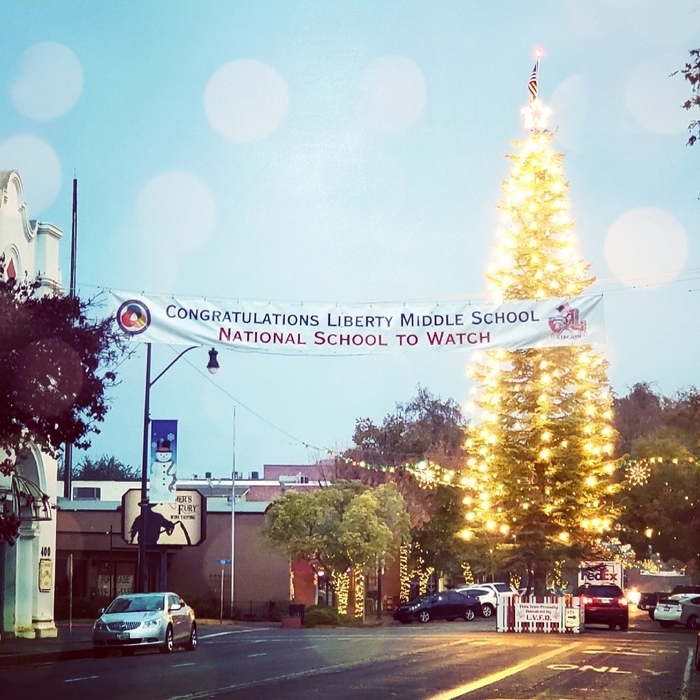 Wishing you and your family the best this holiday season from all of us at Liberty Middle School. 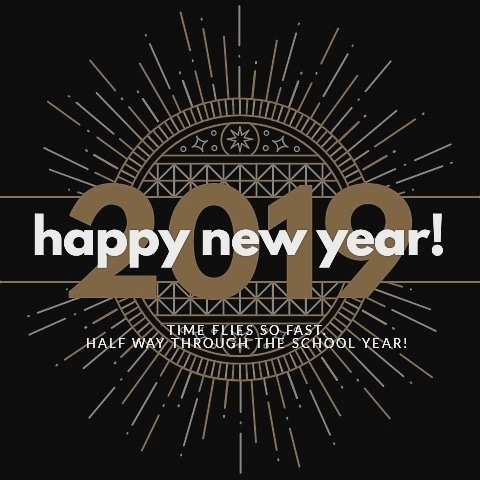 We will see all of our amazing Liberty students back in the new year on January 7th. UPDATE: Wrestling match against Clark intermediate on 12/13 has been canceled. It has been rescheduled now for 12/27 with departure time of 10 am, weigh ins 12:00 pm and start time of 12:30 pm. Return time of 3:00 pm. We are sorry for the inconvenience. Thank you for your support. 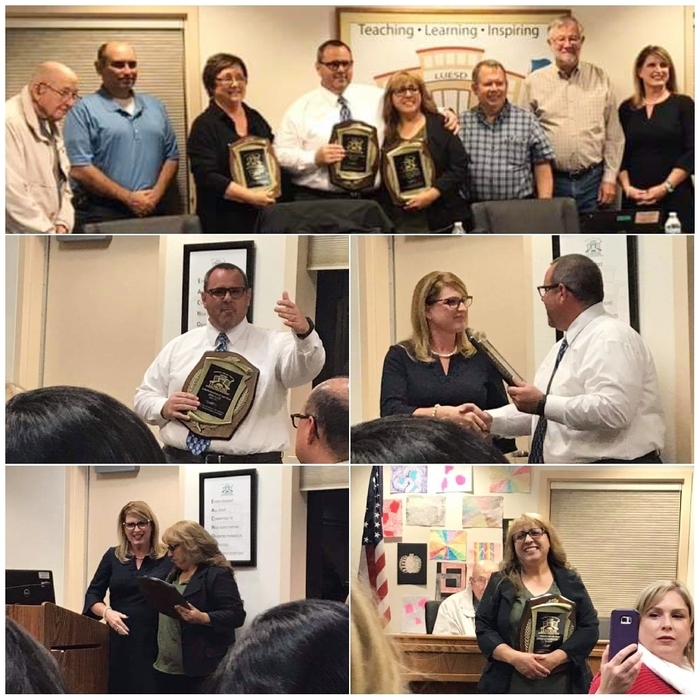 Our LUESD school board adopted a resolution to recognize the Month of December, as Disability Awareness Month, this past Tuesday. 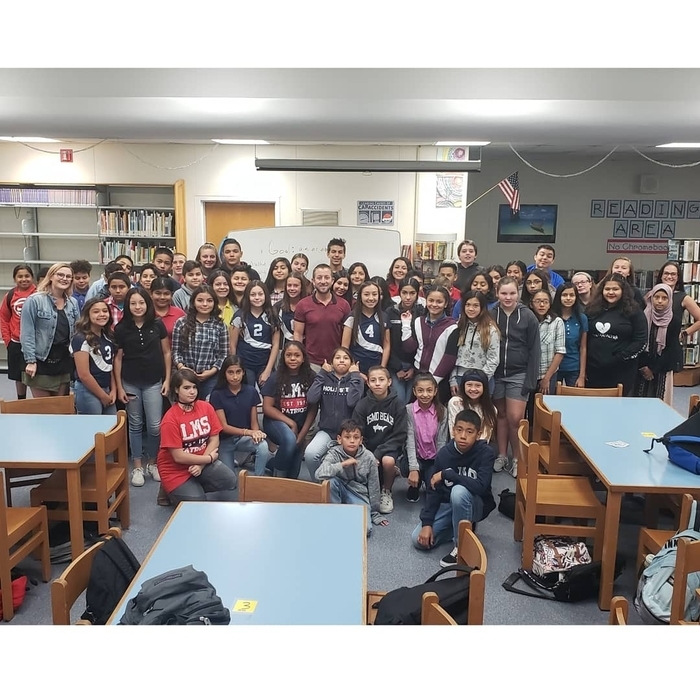 We are so proud of Dylan Hyer, who was chosen to represent Liberty Middle School, as a student who always works hard and shows Patriot PRIDE every day. 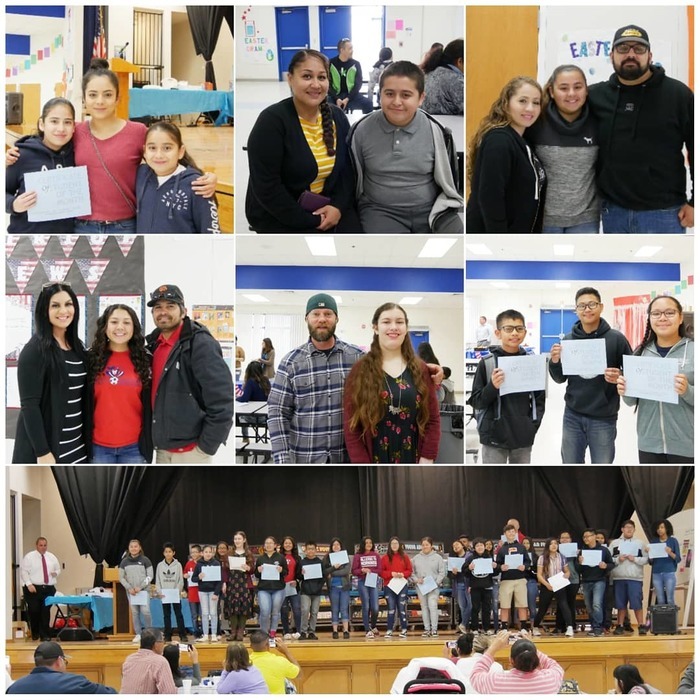 We enjoyed celebrating these students with their families as they were recognized as Students of the Month. So proud of them all and their representation of integrity on campus. 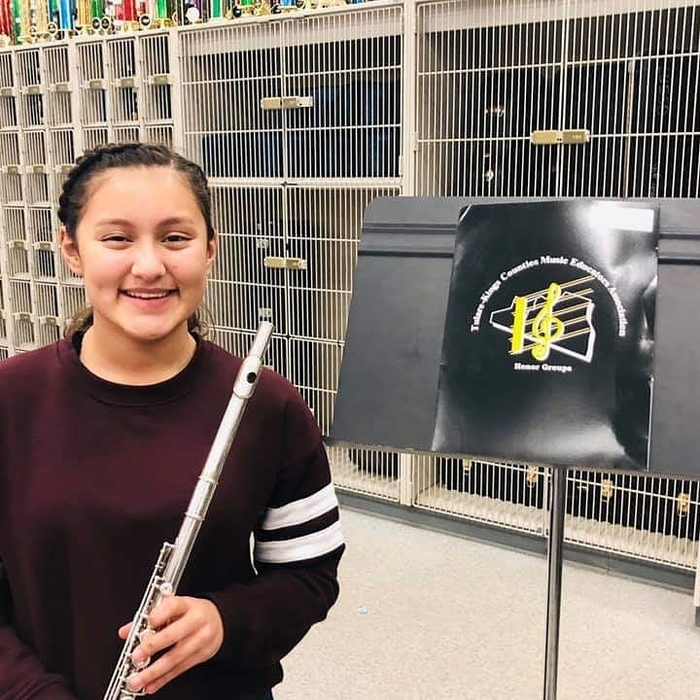 Congratulations to 8th grade student Maritza Ordaz for making the Tulare-Kings County Honor Band this last weekend on flute. She will represent Liberty at the honor band concert in January at Hanford High School. Great Job! 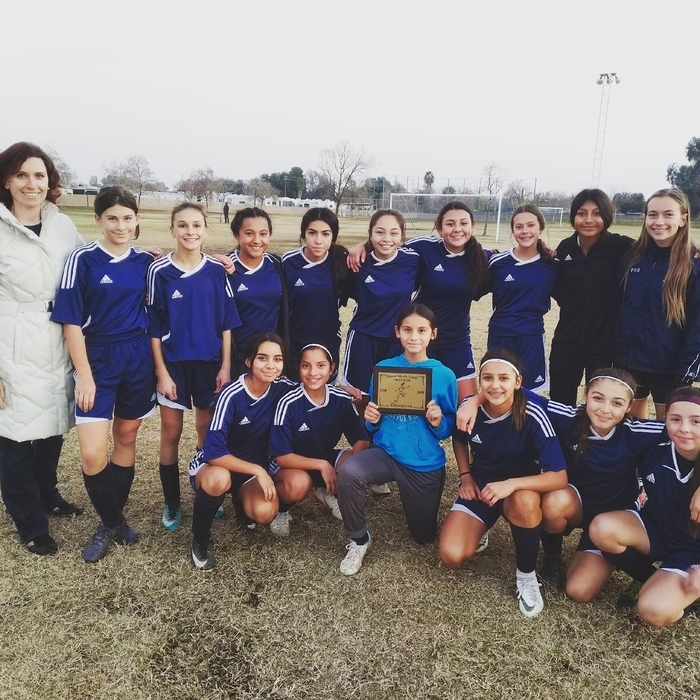 A BIG Congratulations to our Girls Soccer team and Coach Johnson who took 1st place at the SAL tournament today! 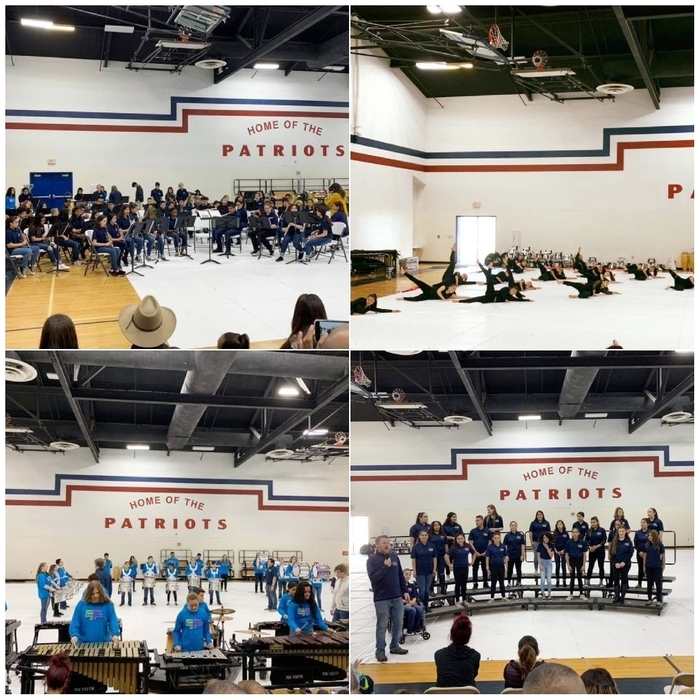 Amazing job, Patriots! 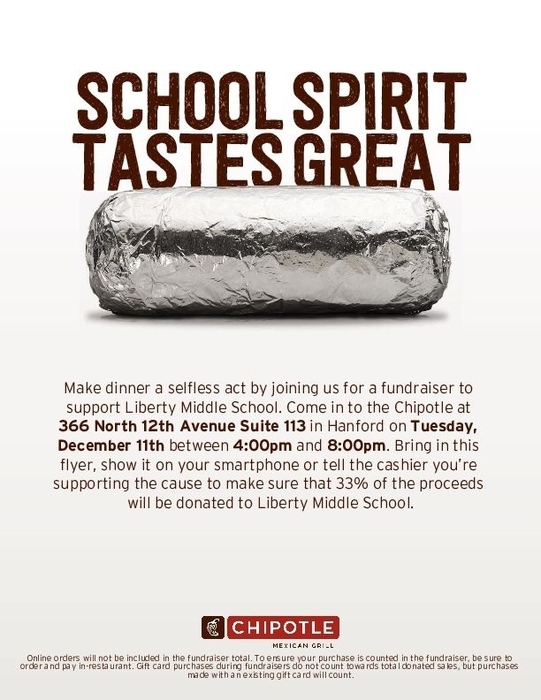 Our Chipotle fundraiser is tonight. We hope you can join us in Hanford from 4pm to 8pm. 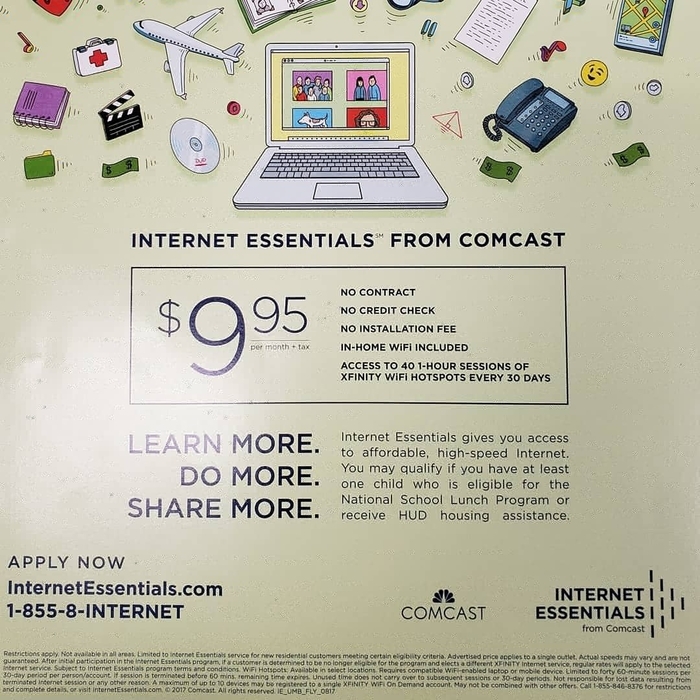 Don't forget to show them the flyer. Thank you for your support. 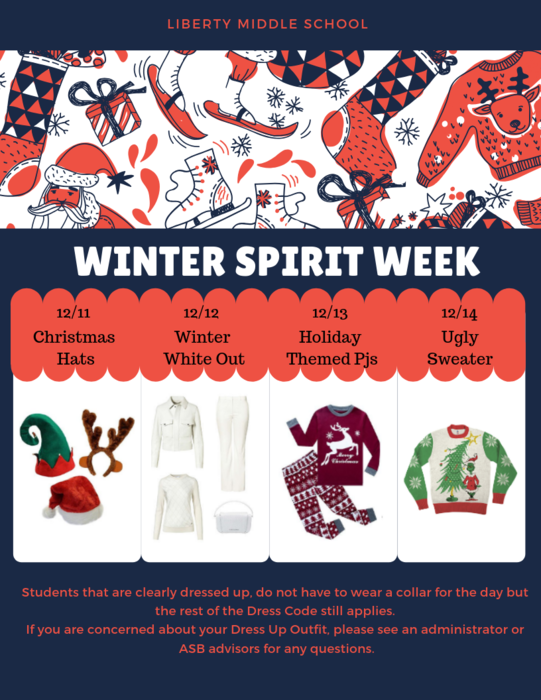 Liberty Winter Spirit Week Dress up days. 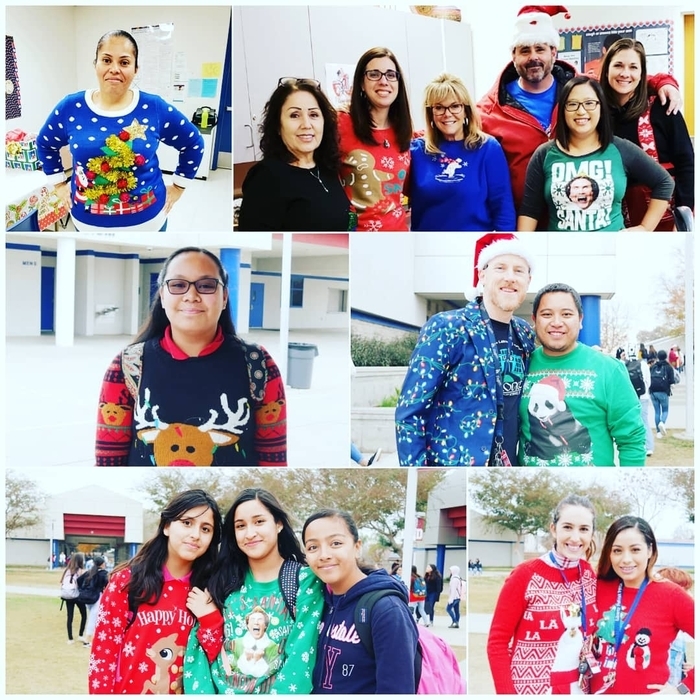 All students and staff are encouraged to dress up as we head into winter break. 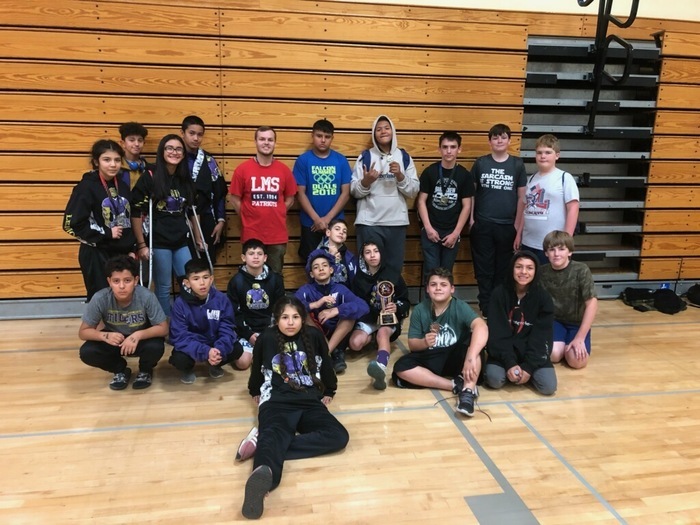 Our Liberty wrestling team took 2nd place as a team at the Exeter Invitational tournament, this past Saturday! 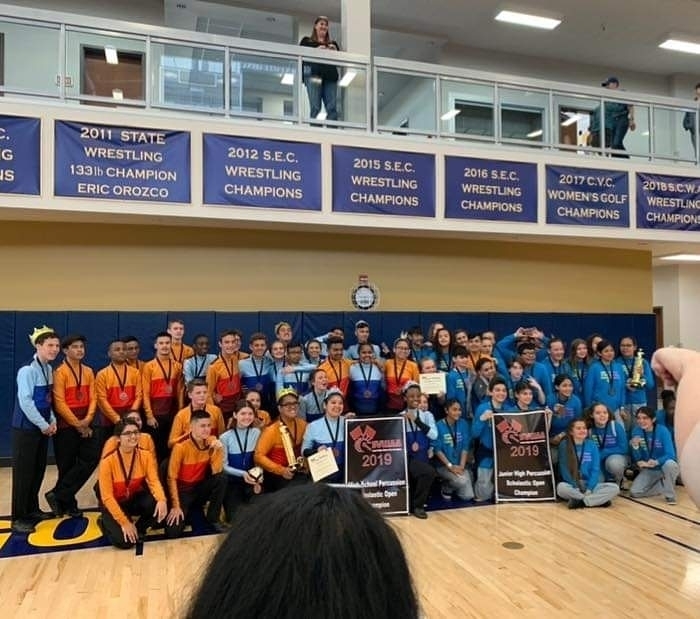 We are extremely proud of these young athletes and all their hard work. 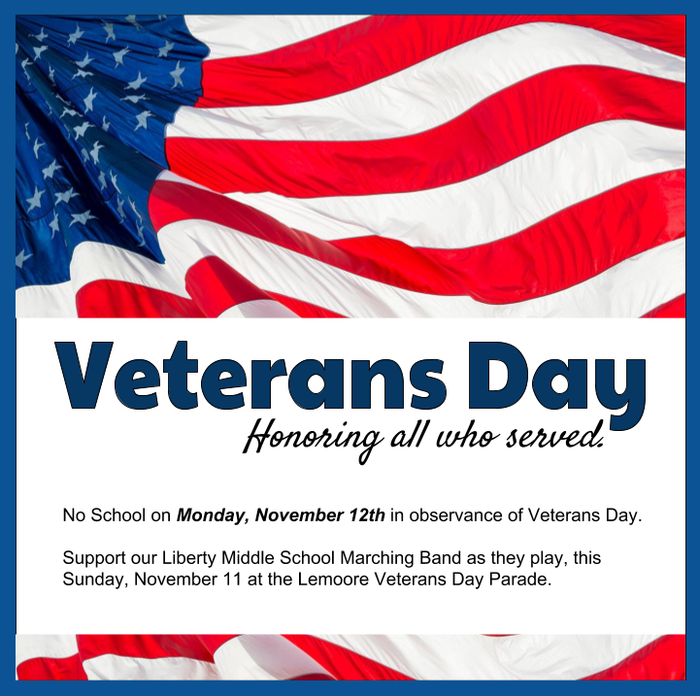 Thank you for supporting our Liberty students. Go Patriots! Just a reminder that tomorrow, December 10th is NOT an early out day. School ends at 3pm. 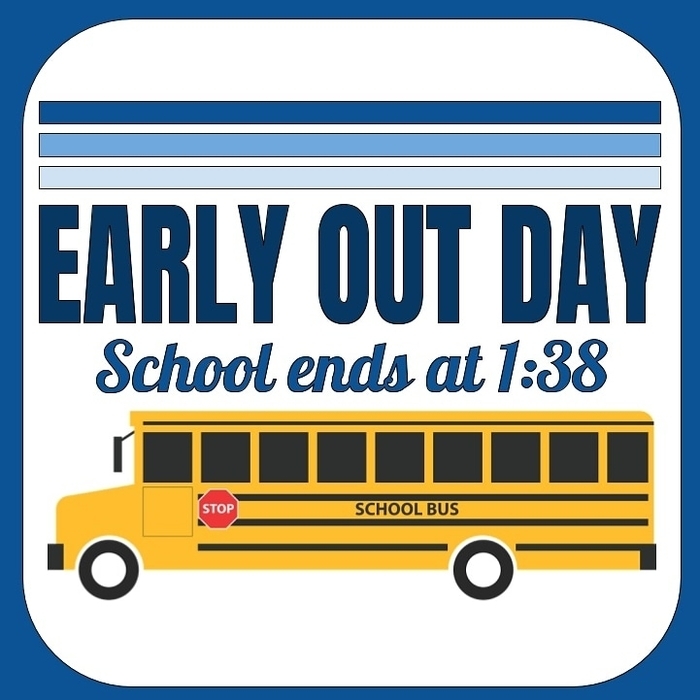 Friday, December 14th is an early out day; school ends at 1:38pm, for winter break. A GOOD Luck to our wrestling team that will be traveling to The Exeter Invitational bright and early tomorrow morning at Exeter High School. 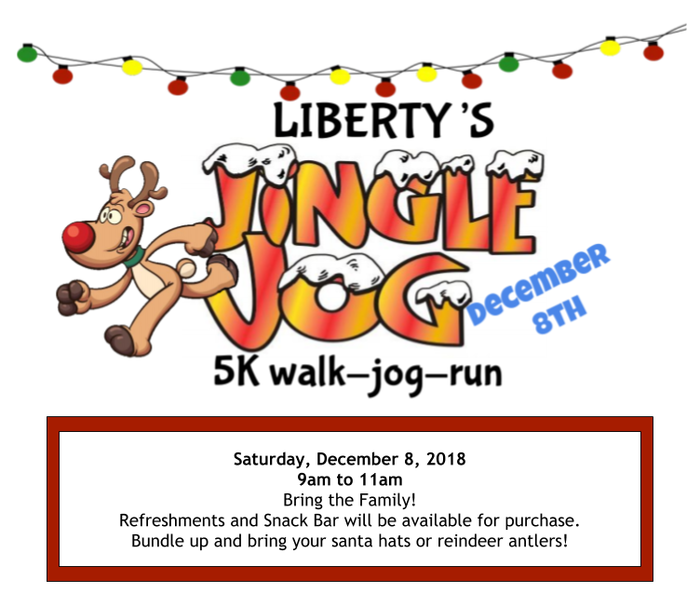 Join us this Saturday for out Jingle Jog at Liberty from 9am to 11am. 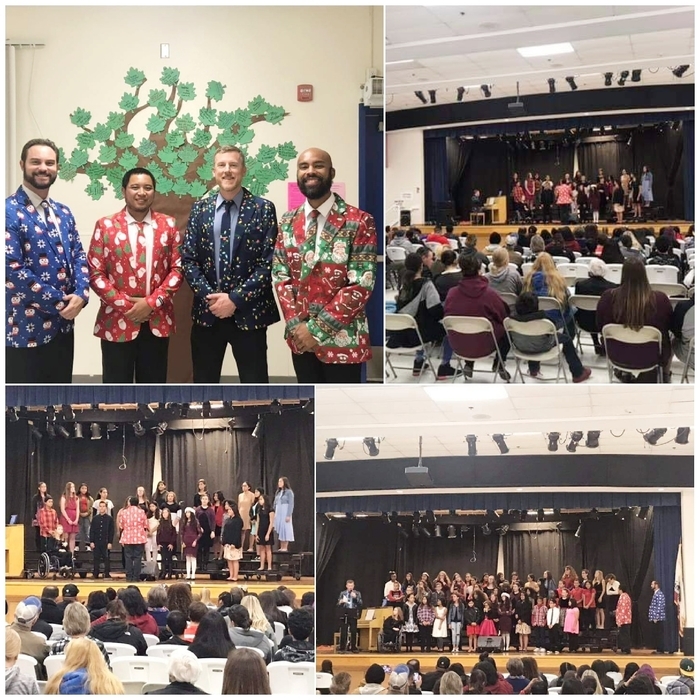 Had a great evening watching our talented choir students perform under the guidance of our fantastic music department at the District Winter Choir Concert. 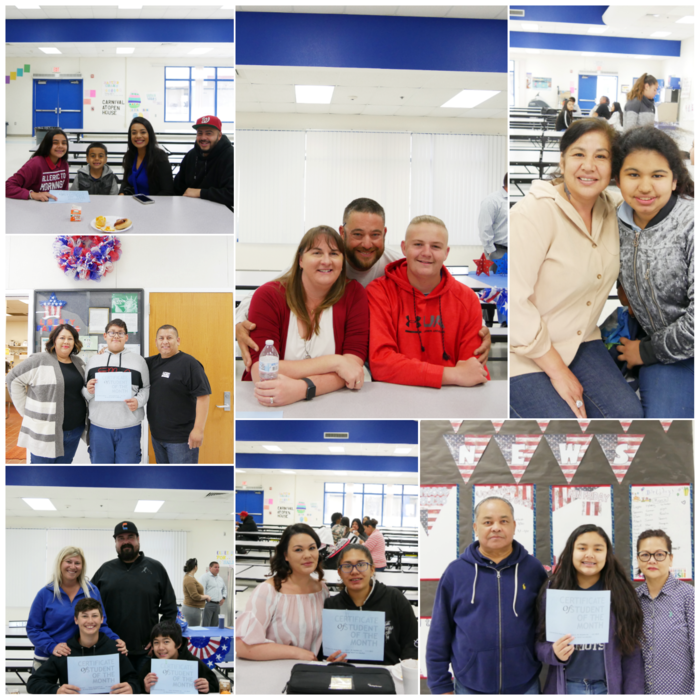 Thank you to all of the families and staff members who came to support them! Forgot your jacket or coat at school? Drop by the Media Center and get your LOST and Found coat before winter break. 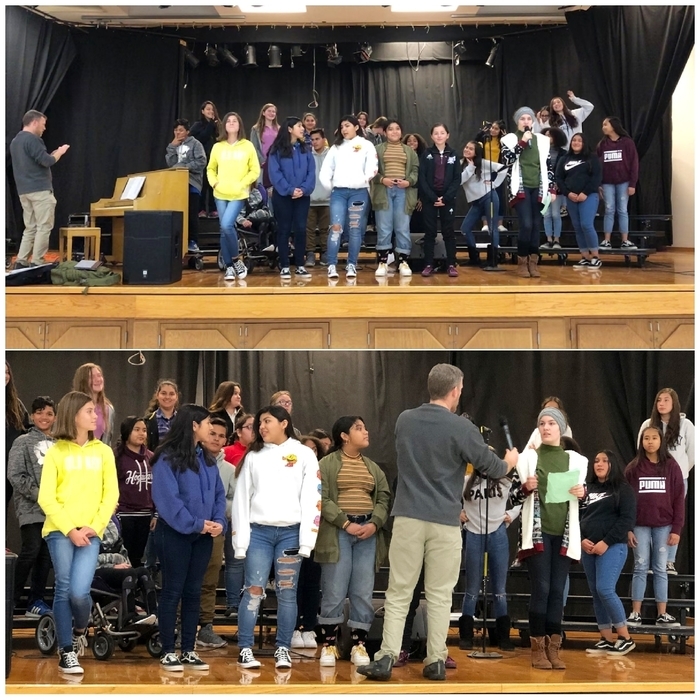 Don't forget to come and join us for the district choir concert held in the Liberty cafeteria at 6pm tomorrow night, Wednesday December 5. 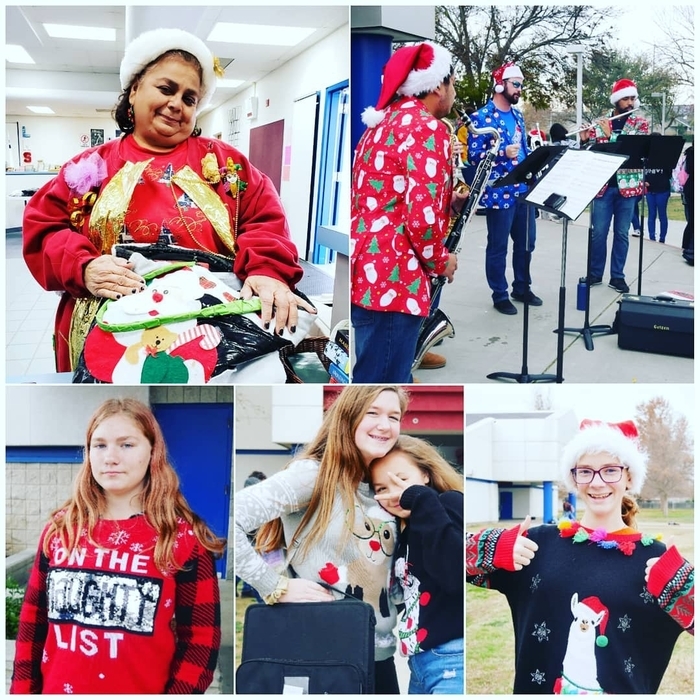 Just a reminder that Band students are to wear their uniforms and Santa hats tonight for the Christmas Parade. Please make sure to be at the arbor across from Lemoore Cinemas by 5:45. We hope to see everyone there tonight, so bundle up, grab an umbrella, and bring the family. 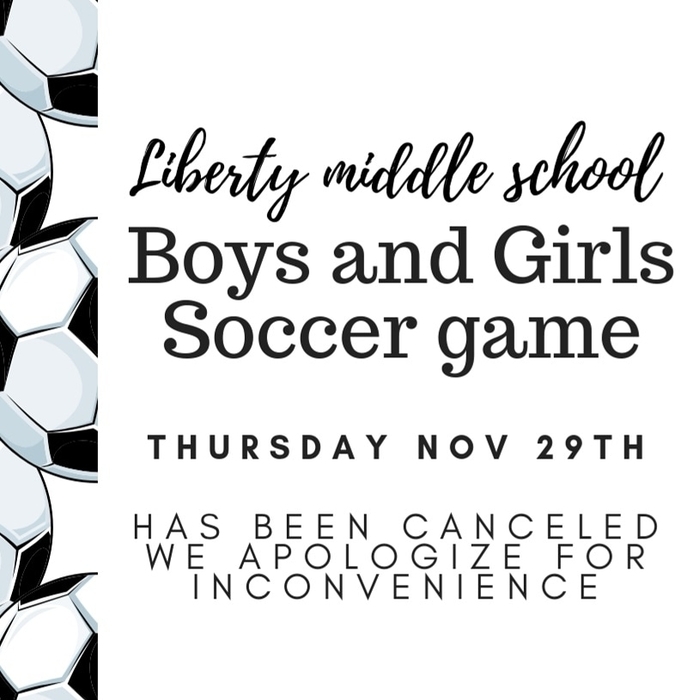 Just a notice that the soccer games scheduled for tomorrow, Thursday, November 29th have been canceled. We apologize for the inconvenience. 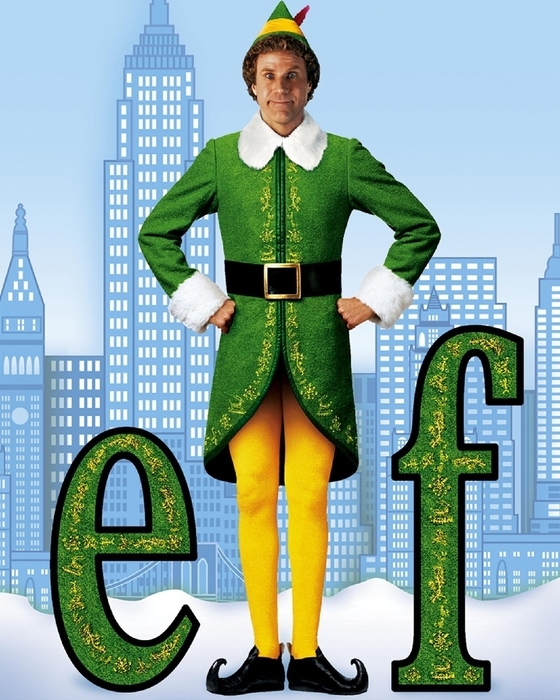 Don't forget to join us on Friday for our ELF family movie night at 5pm. 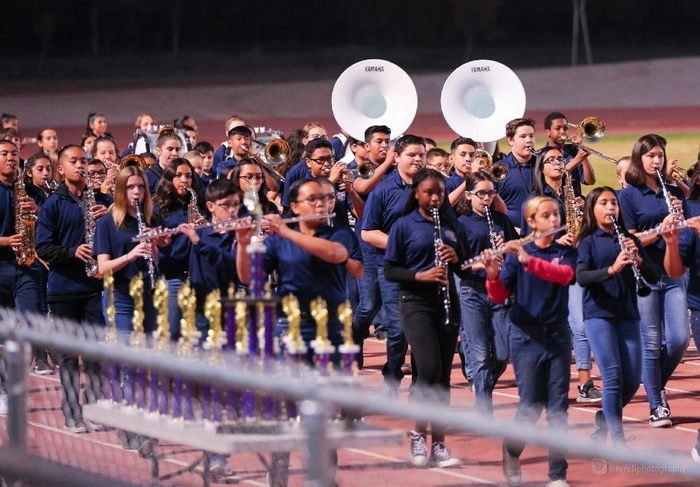 And check out our Marching Band and float this Saturday, December 1st at the Lemoore Christmas parade, starting at 6pm. 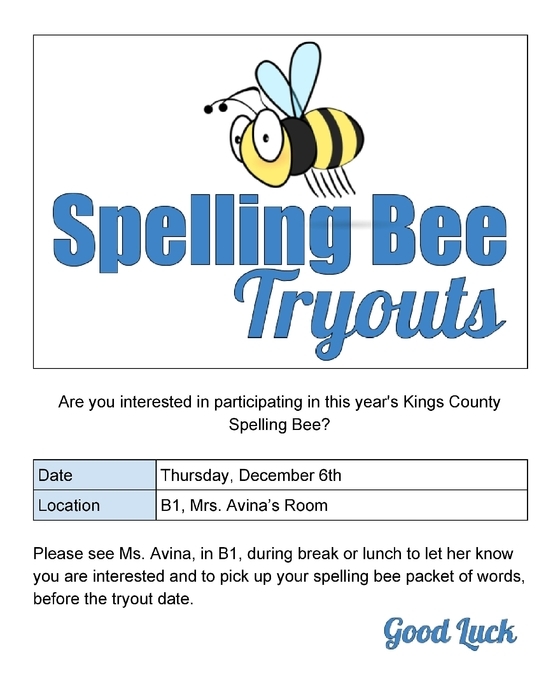 All students are welcomed to try out to represent Liberty at the Kings county spelling bee. Please see Mrs Avina if you are interested. 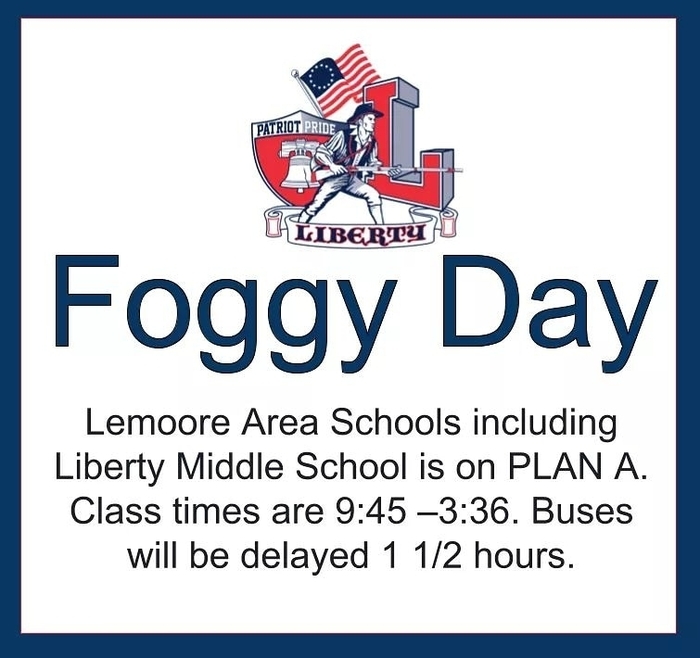 As we get into the colder weather months, please refamilarize yourself and your student(s) with our foggy day schedule, in order to plan accordingly. Thank you. Happy Thanksgiving to you and your family. Have a wonderful day with your loved ones today. All are welcome to our family movie night on November 30th from 5pm to 7pm, in our Liberty cafeteria. Wear your comfy pajamas, even bring your pillows, and watch this amazing family film ELF on the big screen. There is a $2 entry fee but with entry comes unlimited popcorn. Other concessions will also be available. We hope you can join us for this event. 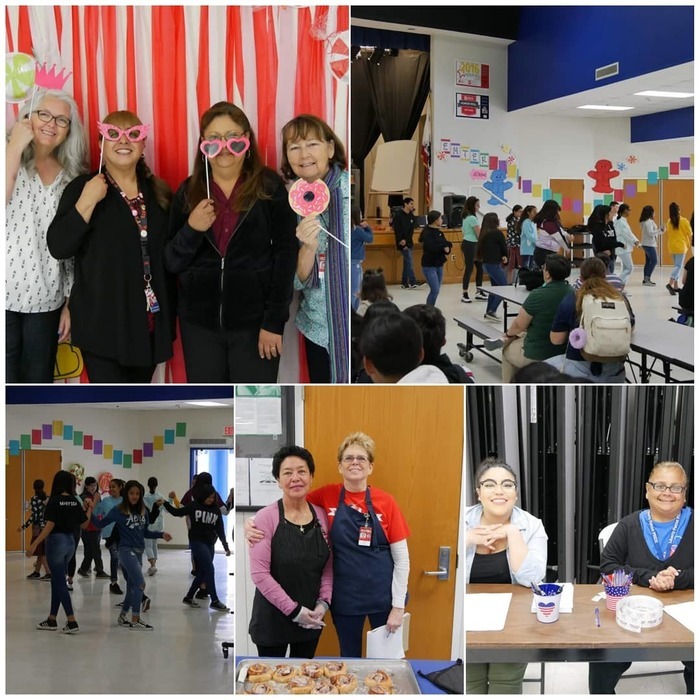 Thank you to all the parents, grandparents, aunts, and uncles that were able to attend our GRAND event at Liberty. 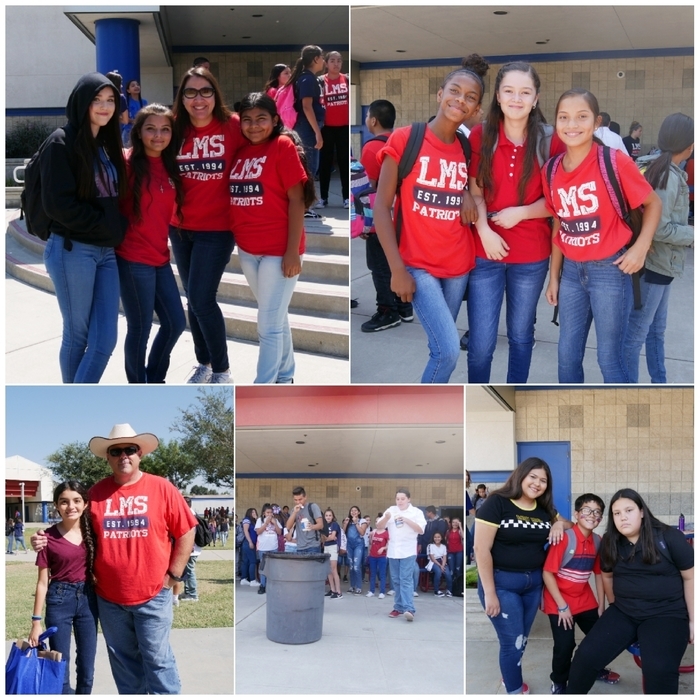 We hope you enjoyed your time with our Liberty Students. Have a Great Thanksgiving break 11/19-11/23. We will see our students back on November 26. Our book fair continues until Friday, November 16th. Any grandparents, parents, Aunts, and uncles that did not sign up for our GRAND event are still welcomed to attend. 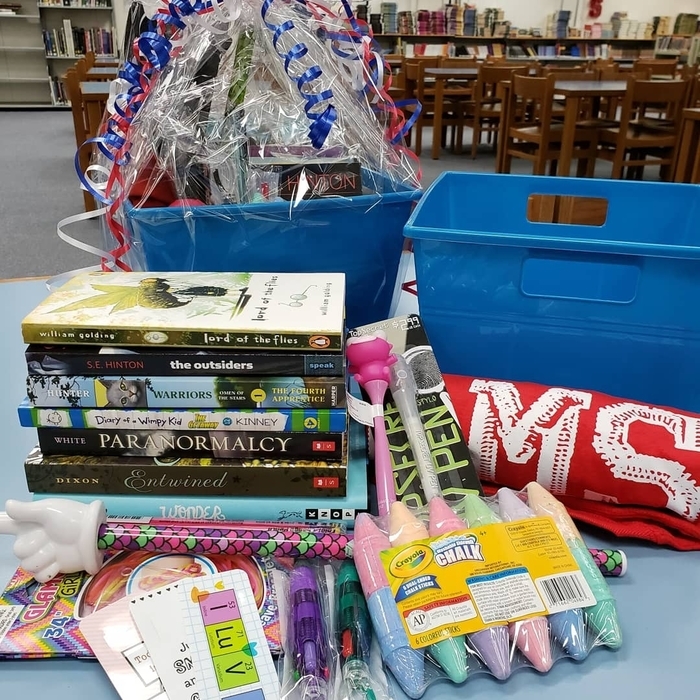 We will have a special breakfast for attendees, two raffle giveaways that include books, spirit wear, pens, and bookmarks, as well as photos and the book fair. We hope you can attend this Friday 7:30am to 8:30am. 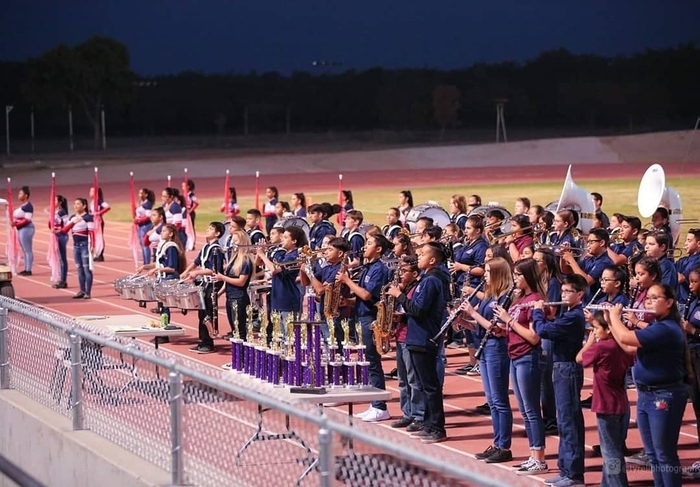 Thank you to Tyrell Photography for capturing these amazing photos of our band and color guard students at the Tiger Classic Band Competition this past Saturday. 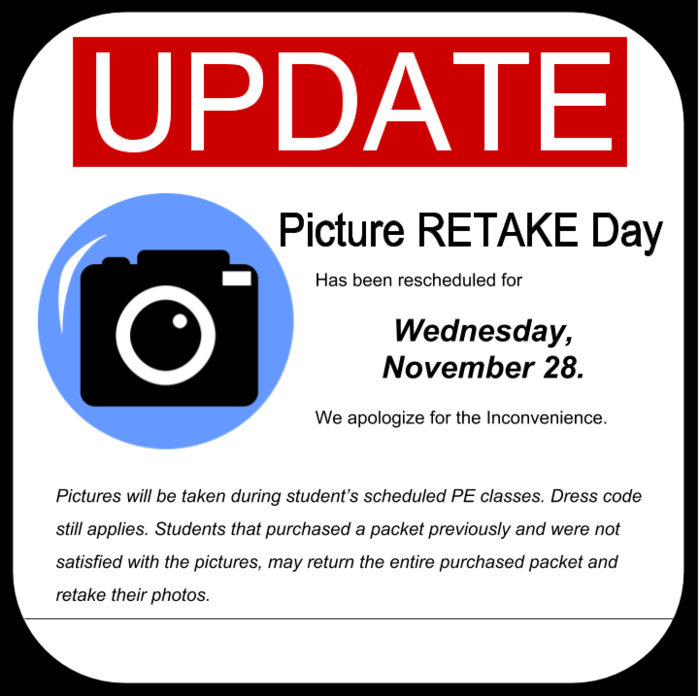 Picture Retake day has been rescheduled for November 28. We apologize for the inconvenience. 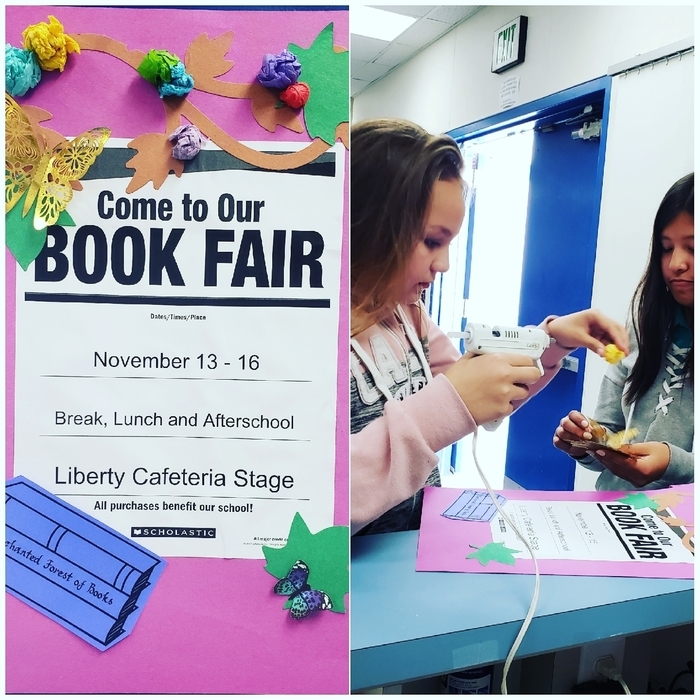 Thank you to our amazing ASB team for helping to make flyers for our book fair this year. Book fair starts tomorrow. If you'd like to join us for our GRAND event on Friday November 16th from 7:30am to 8:30am.please fill out the form asap. We hope to see you all there. Just a reminder that there is no school on Monday, November 12th. 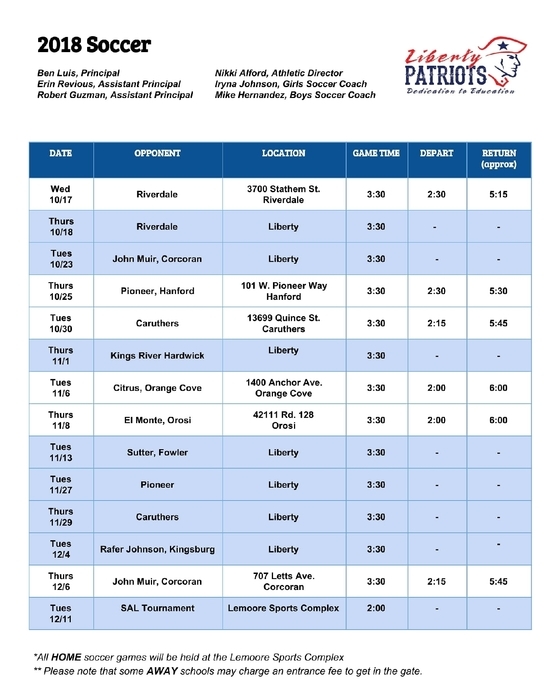 Wrestling Schedule for this season. We hope to see you at a few of our matches this year. You are invited to our GRAND event. 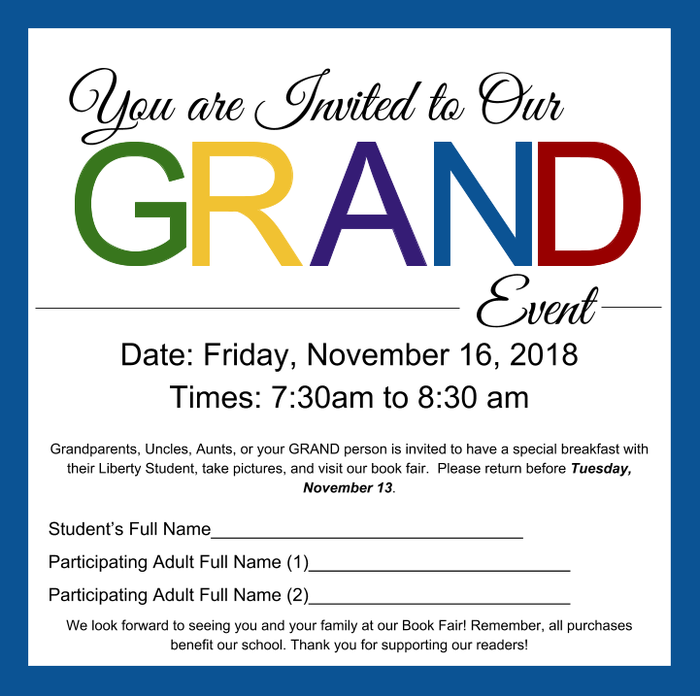 Grandparents, Aunts, Uncles, or your GRAND person is invited to join their Liberty Student for a special breakfast, take pictures and visit the book fair. Students received permissions slips today. If interested, please fill out and return it before Tuesday, November 13. 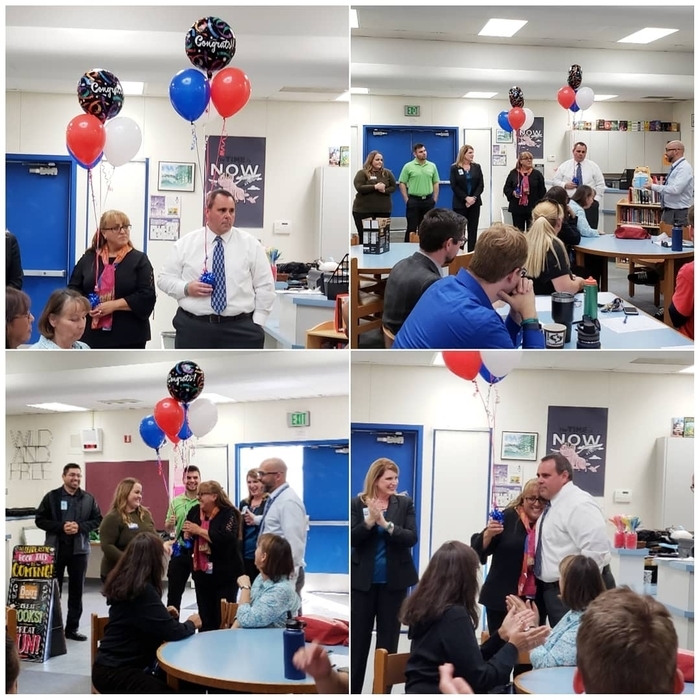 A well deserved Congratulations to Mr. Ben Luis, LUESD Administrator of the year, and Mrs Anna Covarrubias, Employee of the year. 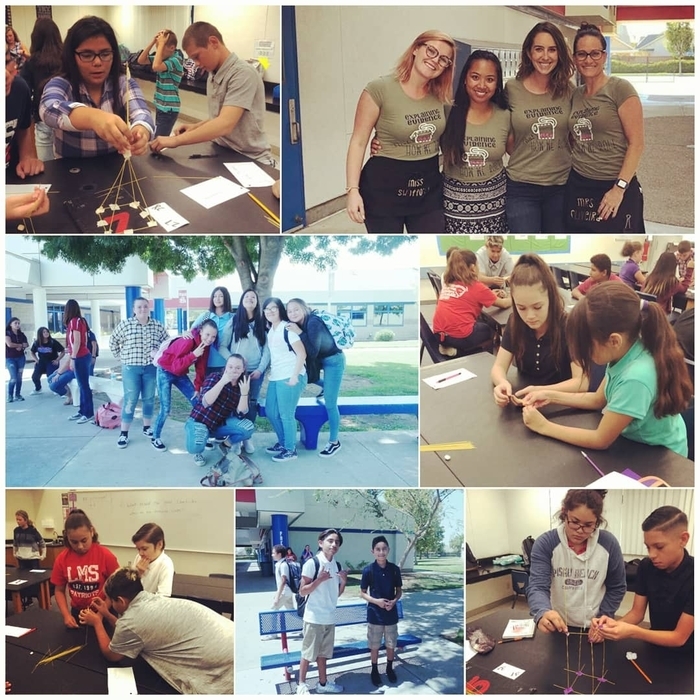 Thank you for helping to improve our Liberty campus and Lemoore community. 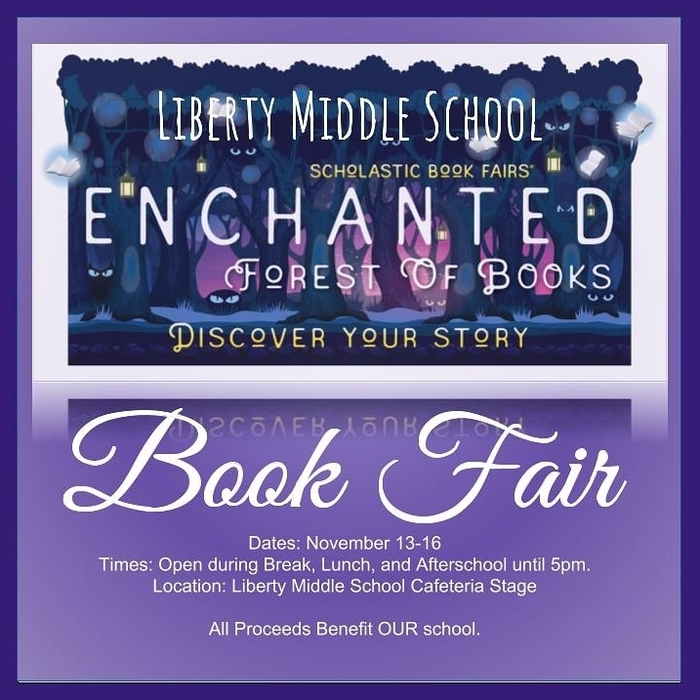 Our Liberty book fair starts on November 13th to 16th. Students may come during break, lunch or after school with parents and families until 5pm. It will be located at our Liberty cafeteria stage. 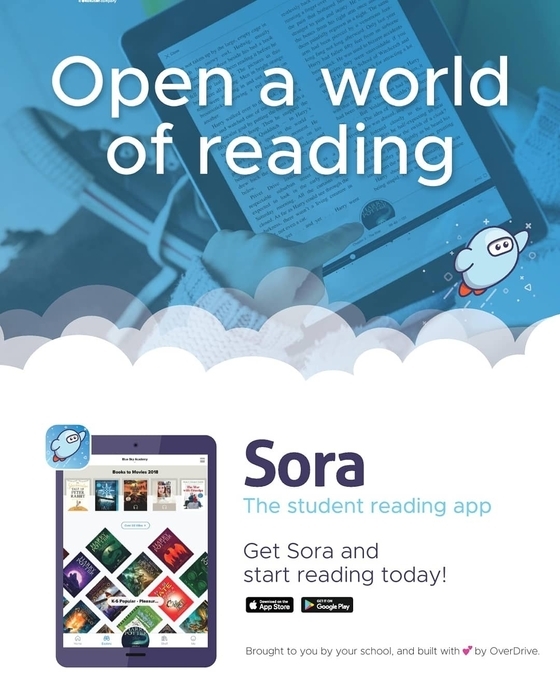 Books for Middle schoolers, Adults, and even some for elementary. Come by before Thanksgiving break for amazing books or even early Christmas presents. All proceeds benefit our school and helps update our book inventory for all OUR students on campus. 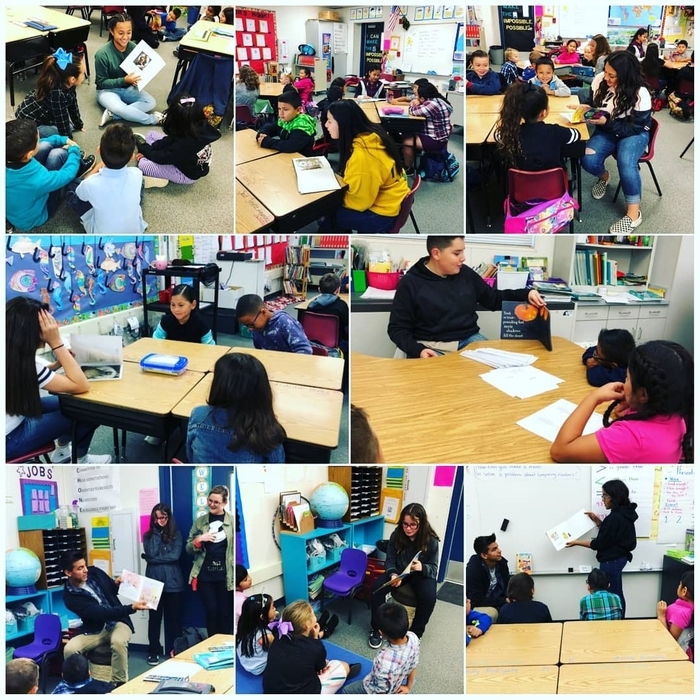 Thank you to Cinnamon Elementary School for allowing our ASB students to come read spooky Halloween to your students. Be safe tonight. 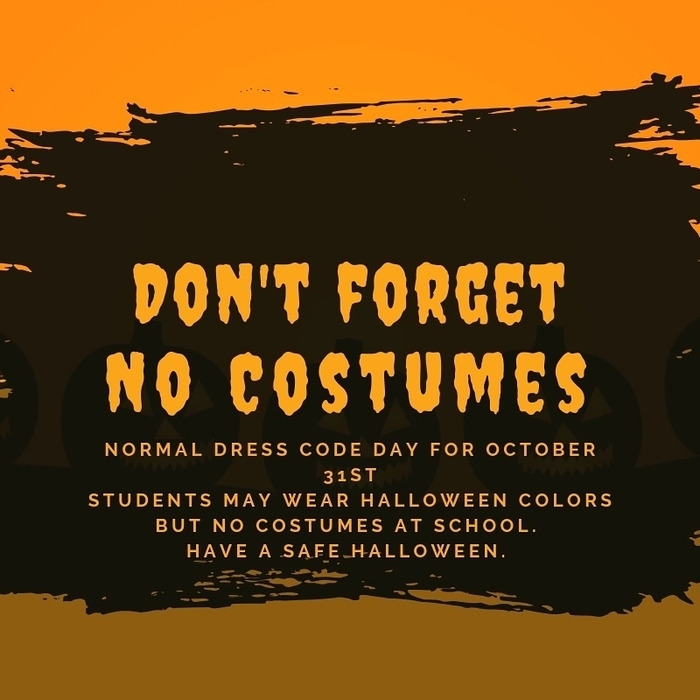 Just a reminder that students are not allowed to wear costumes at school tomorrow. We hope you were able to join us. 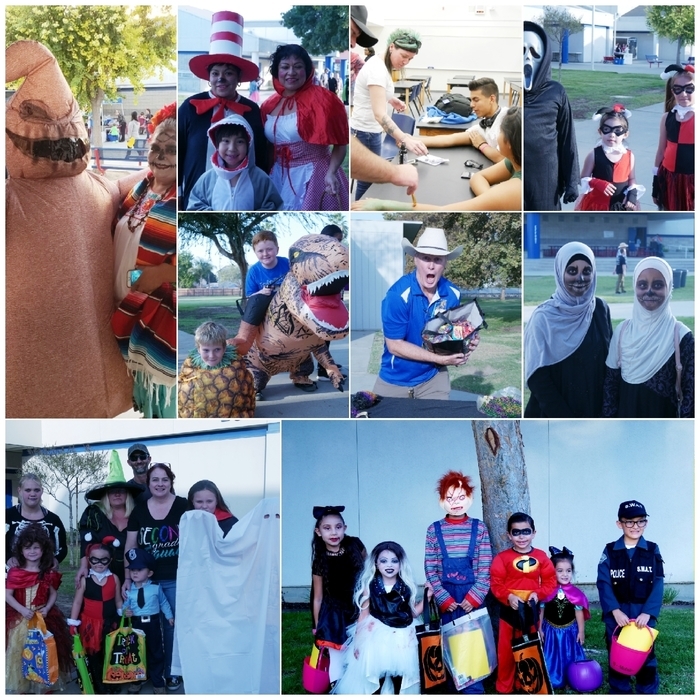 Thank you to all the Liberty and Meadowlane staff, students, and families that came out to support our Trick or Treat night! 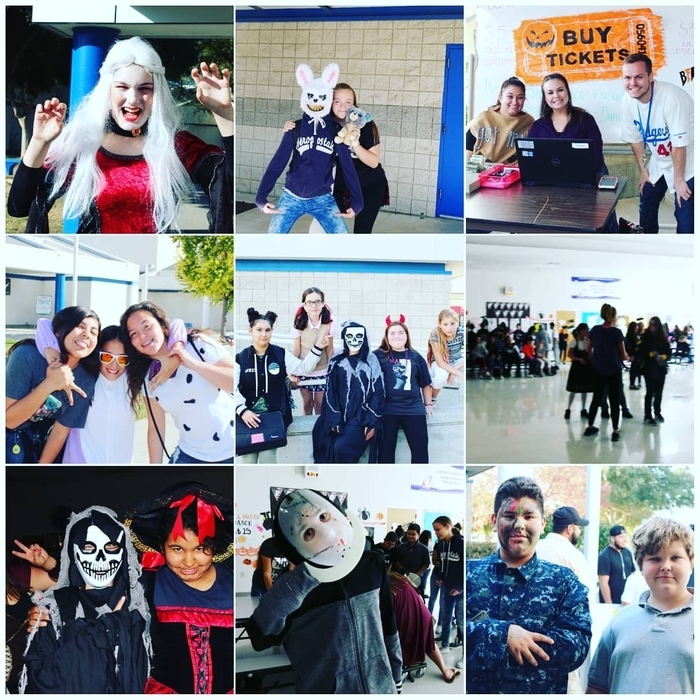 Amazing success for our vendors, contests, and haunted classroom! Can't thank everyone enough! 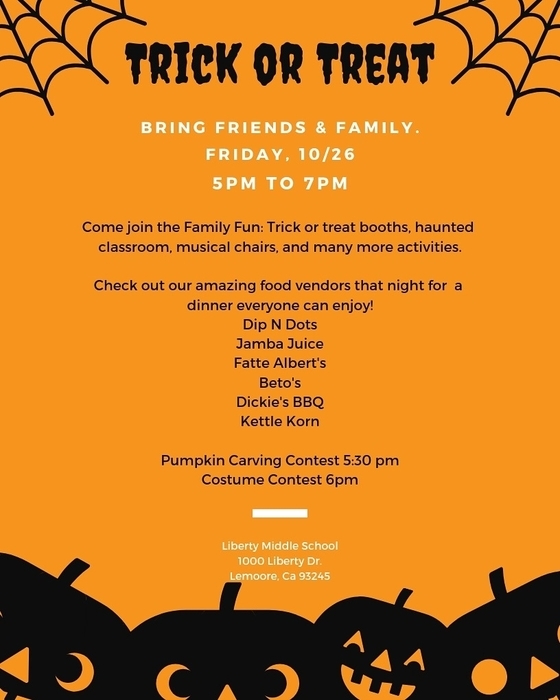 Join us tomorrow night for family fun! Another successful dance. Thank you to all the staff and students that came out tonight. 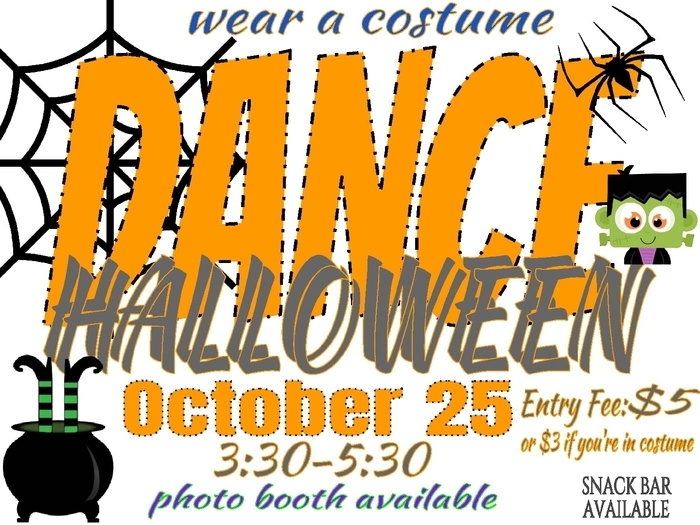 Don't forget your costumes for trick or treat night tomorrow 5pm to 7pm. 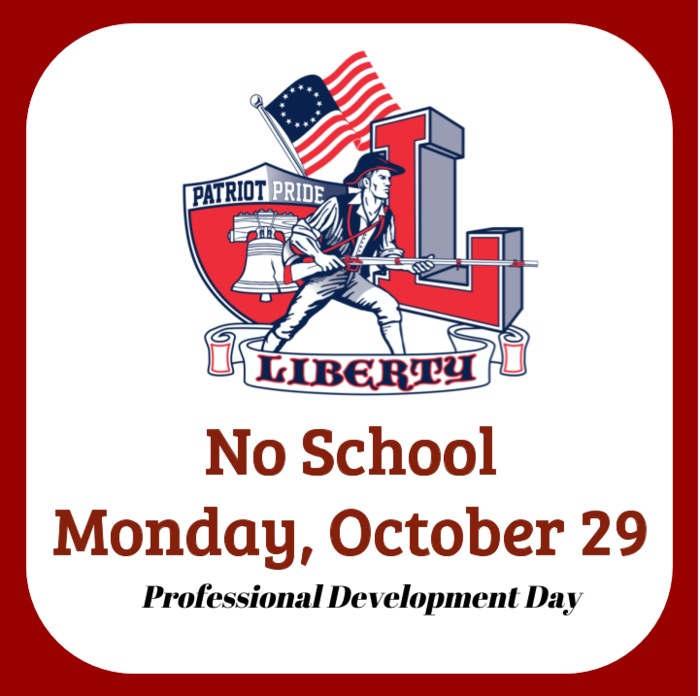 No School on Monday, October 29 for Professional Development Day. We resume school on Tuesday, October 30. Benchmark testing on Chromebooks continue in Math and Science. We are continuning testing this week in ELA then Math class. Please make sure your student has a charged Chromebook for testing everyday. 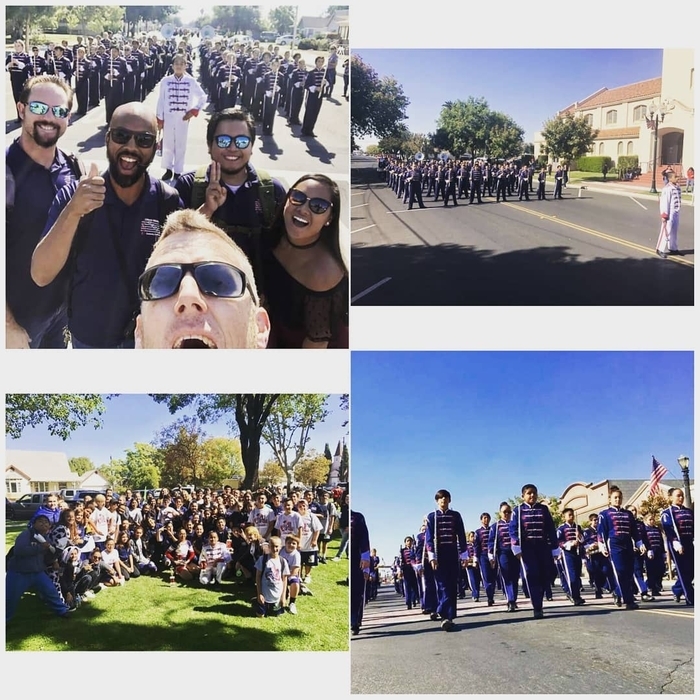 Congrats to the Liberty Marching Band and Colorguard at the Visalia Band Review. 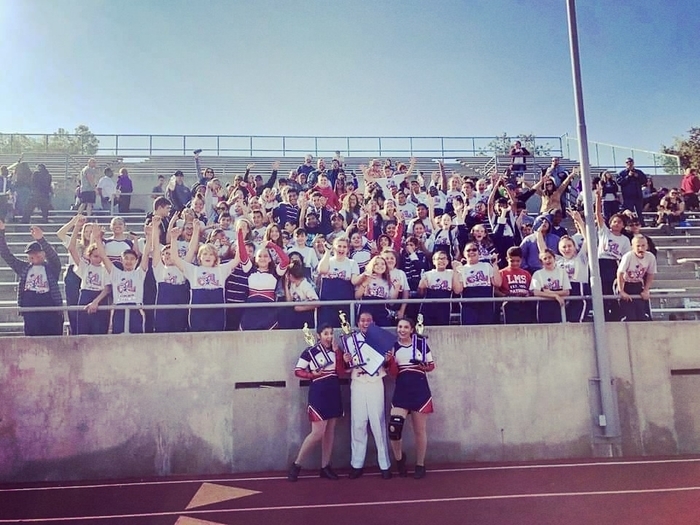 3rd place Band, 2nd place Colorguard, and 1st place Percussion. Great Job! 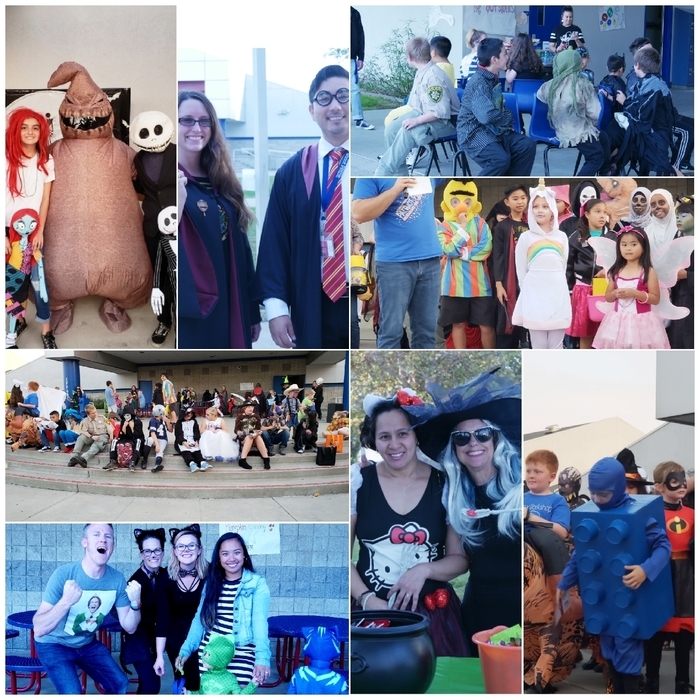 Lots of amazing things happening next week during RED Ribbon Week including our dance Thursday after-school and ending the week on Friday with our trick or treat night. 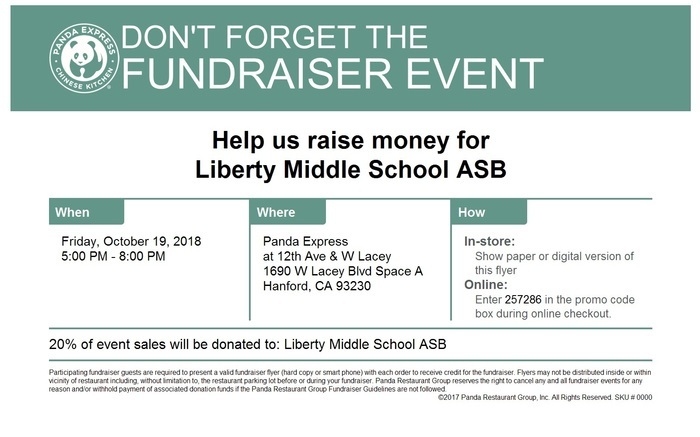 Having dinner with our ASB students at Panda Express. Get here before 8pm. 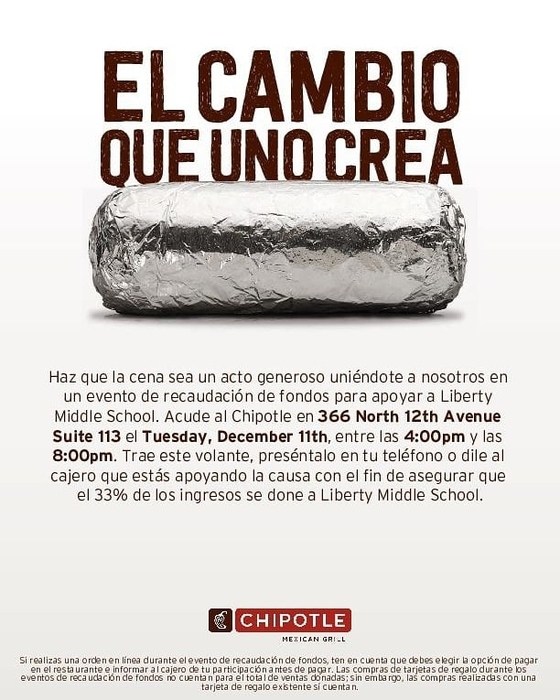 20% gets donated to Liberty Middle School. Just a reminder that our dine out fundraiser is Today at Panda Express. Thank you for your continuing support. First home soccer game today at the Lemoore Sports complex. 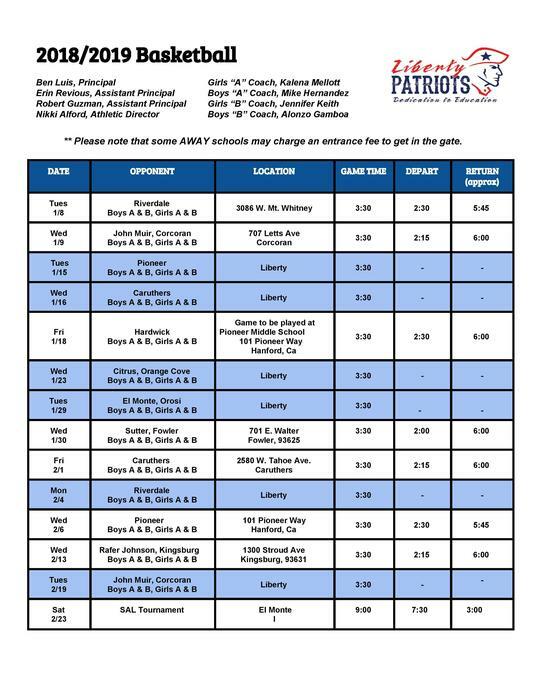 We hope to see you at one of our games this school season. Good luck to our teams! 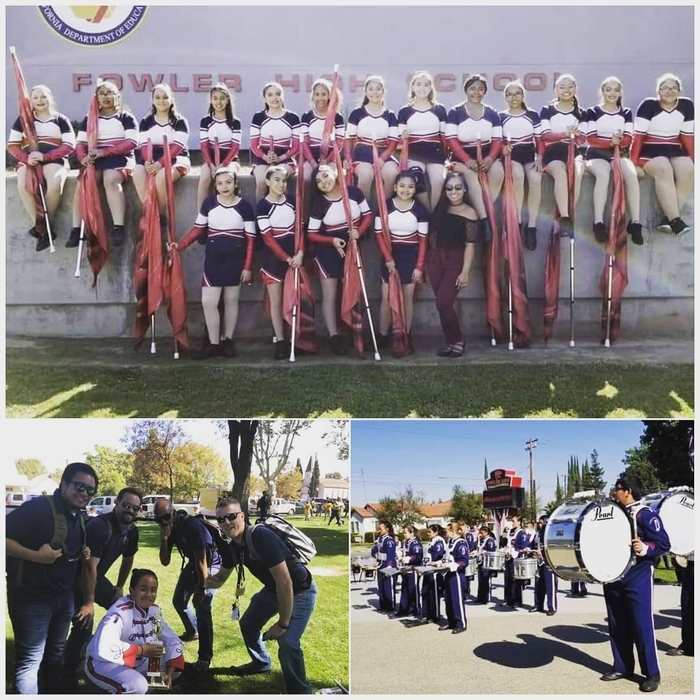 Great Job Marching Band and Colorguard at the Fowler Band Review yesterday. Band took 4th, Colorguard 3rd, Percussion 2nd, and our Drum Major, AJ Caballero, took 1st place out of all 19 drum majors Competing. 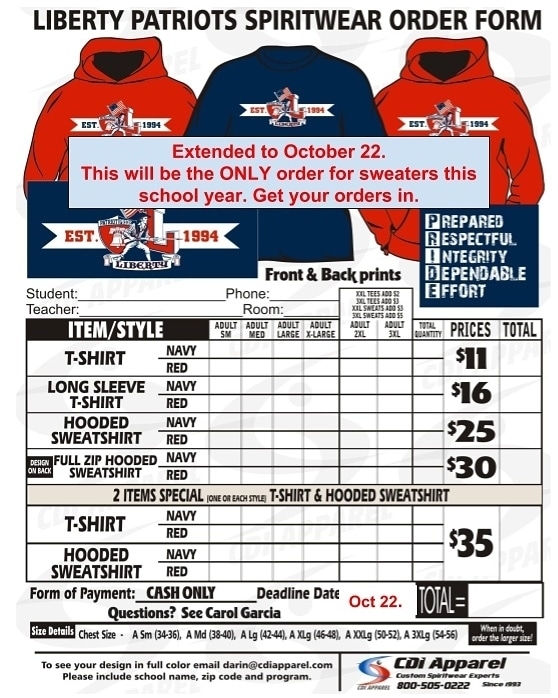 Liberty spirit wear orders has been extended to October 22. This is the only order for sweaters this school year. Get your orders in. Due to transportation issues, our volleyball game against John Muir has been canceled. We are sorry for the inconvenience. 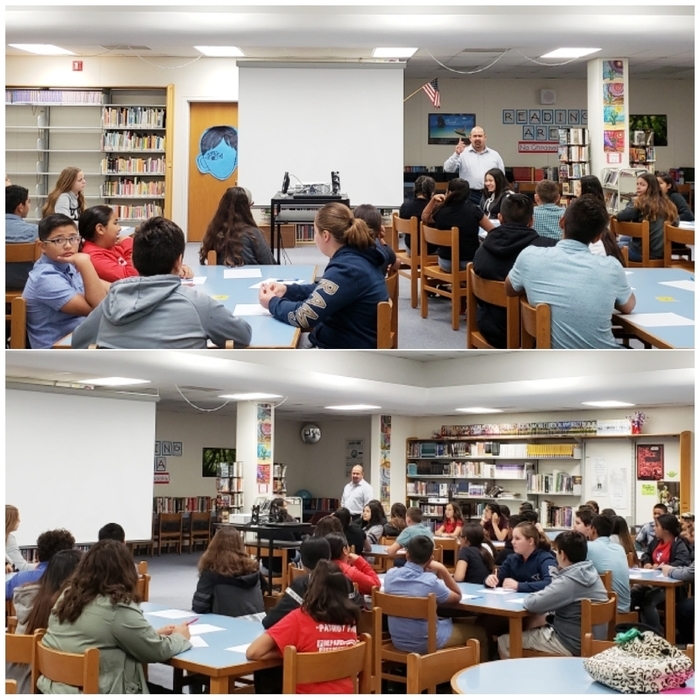 Thank you to all the parents and guardians that were able to attend today. 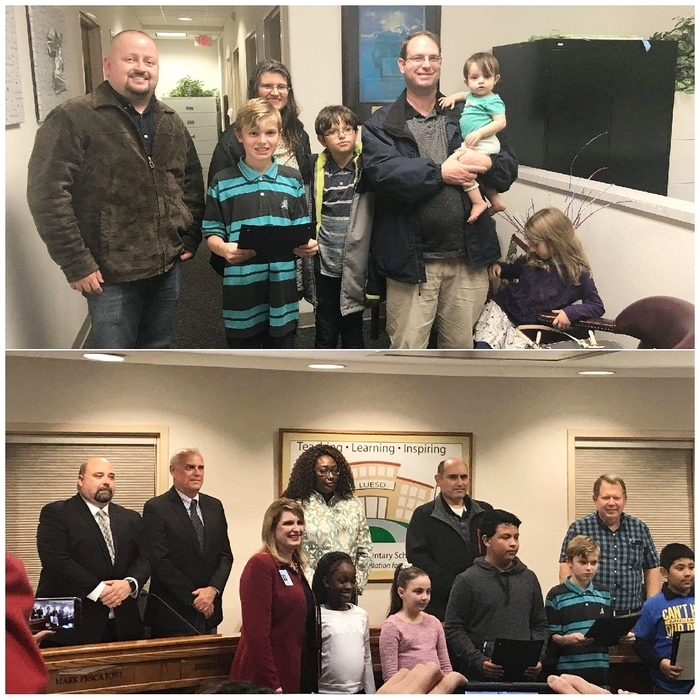 We enjoyed celebrating these students with their families as they were recognized as Students of the Month. So proud of them all! 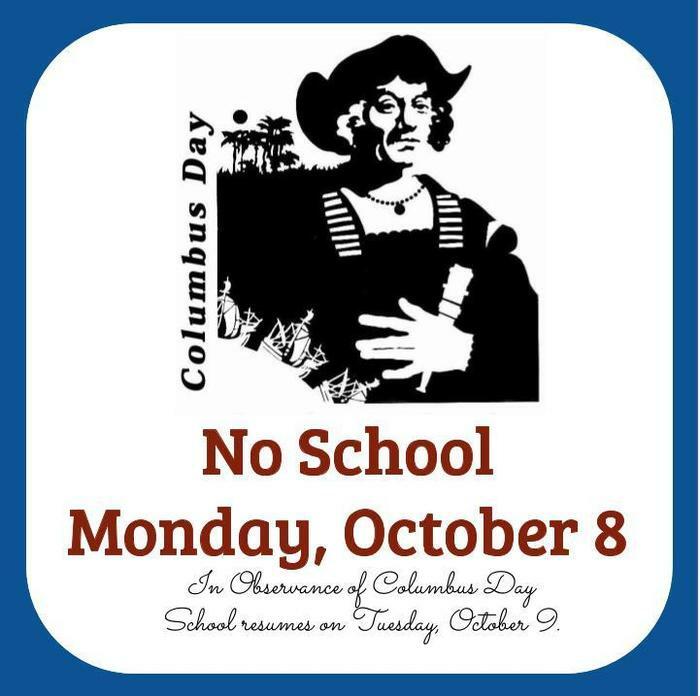 No School on Monday, October 8th in observance of Columbus Day. 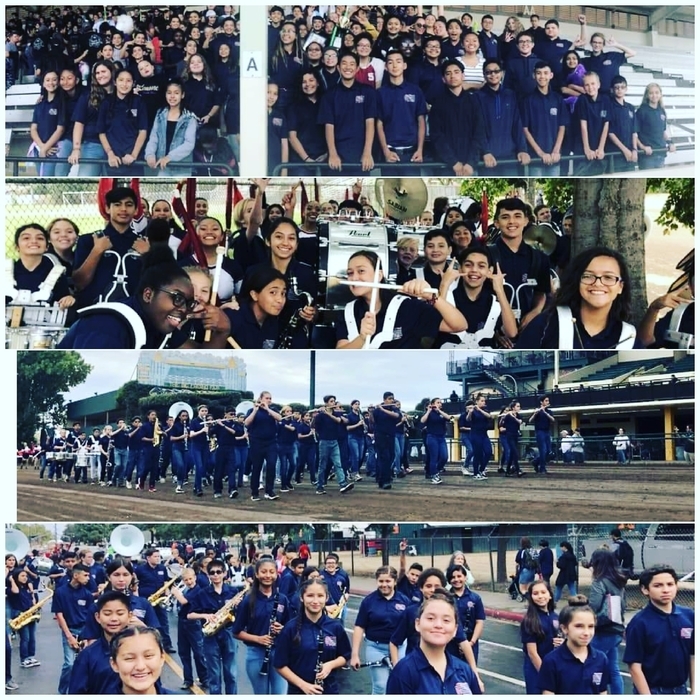 Congrats Liberty Marching Band and Colorguard who braved the rain to help open the Big Fresno Fair today, along with 24 other middle school and high school marching bands from around the Central Valley. 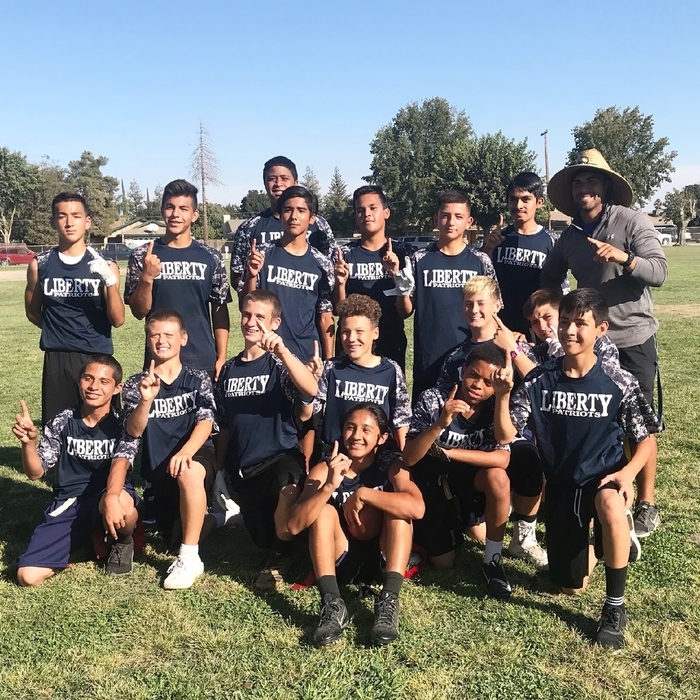 Congrats to the Liberty flag football team who won our league championship today against Kings River Hardwick 42-6 to finish their undefeated season! Congratulations on all your hard work and for representing Liberty with pride! Just a reminder that all next week 10/1-10/5 is early out days. Schools ends at 1:38pm for parent teacher conferences. 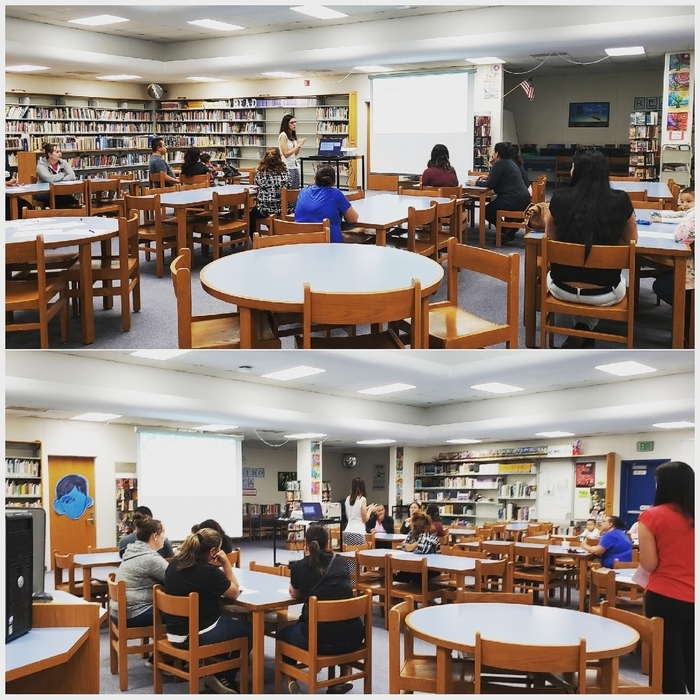 Thank you to the parents and guardians that were able to attend our ELAC (English Learner Advisory Committee) parent meeting this morning to learn about our school's programs and grading. Parent teacher conference information was given to your student today. Please go over the information and have your student return it as soon as possible. Thank you. 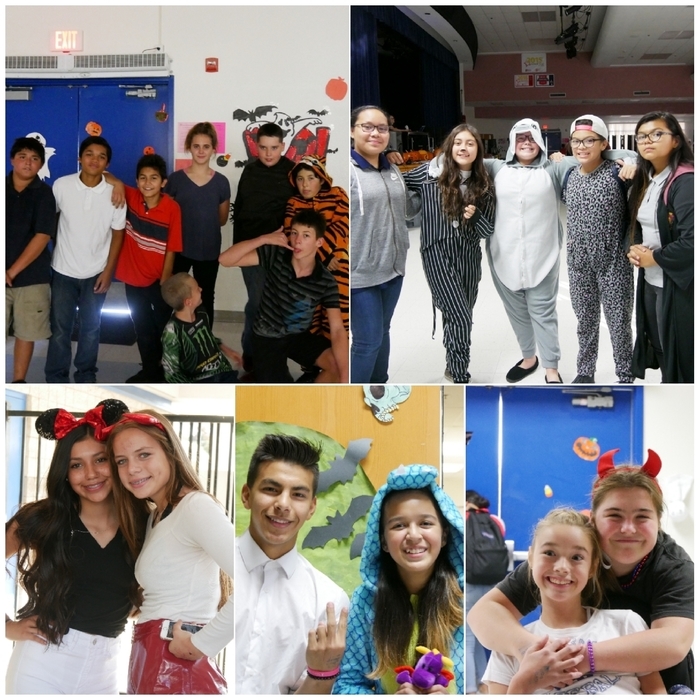 We hope everyone had an amazing time today at the dance. A job well done by our ASB and staff. 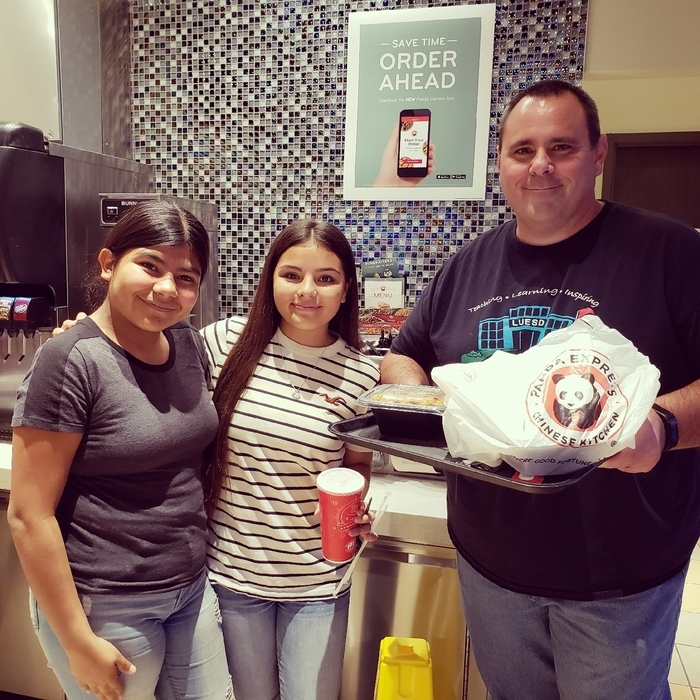 Have a great weekend and we will see everyone at our family movie night next week or hopefully the Applebees dine out next Saturday. 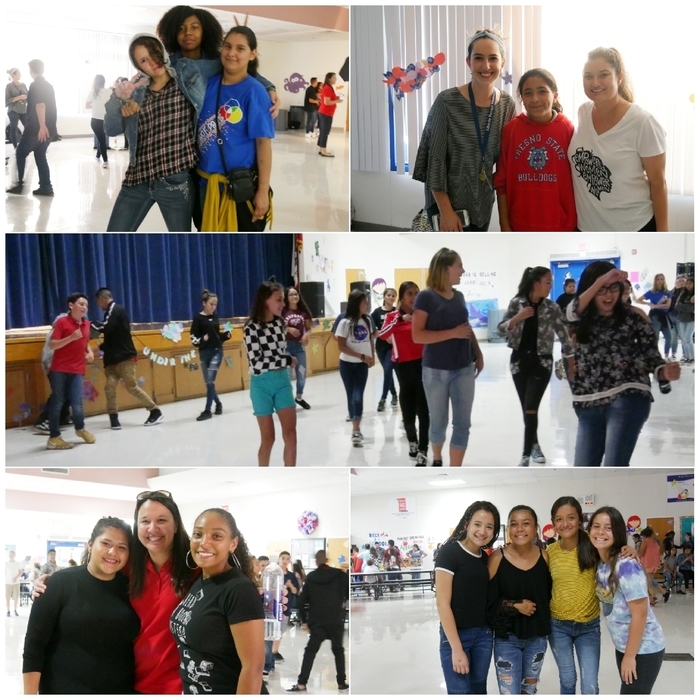 Just a reminder that all of our current students are welcomed to join us for our Back to School dance, this Friday at 3:30pm to 5:30pm. 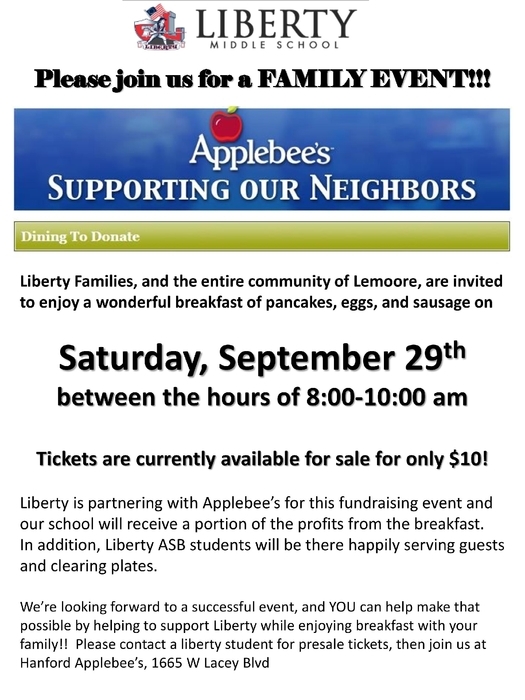 Save the date: Join us for our applebees fundraiser on September 29th. 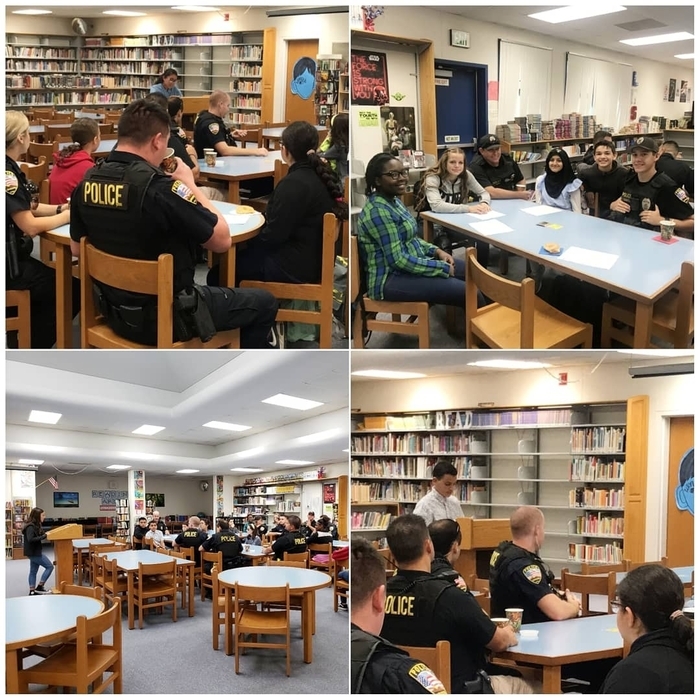 Thank you to all of the amazing first responders @lemoorepd that were able to attend today and allowed our students to show how grateful they were for their help in their Lemoore community and families. 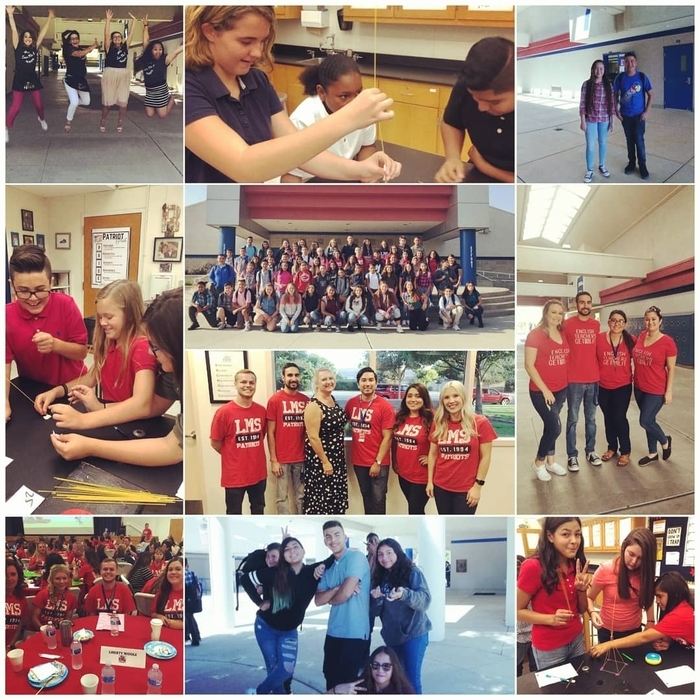 What an exciting week it has been for our ASB leadership students. 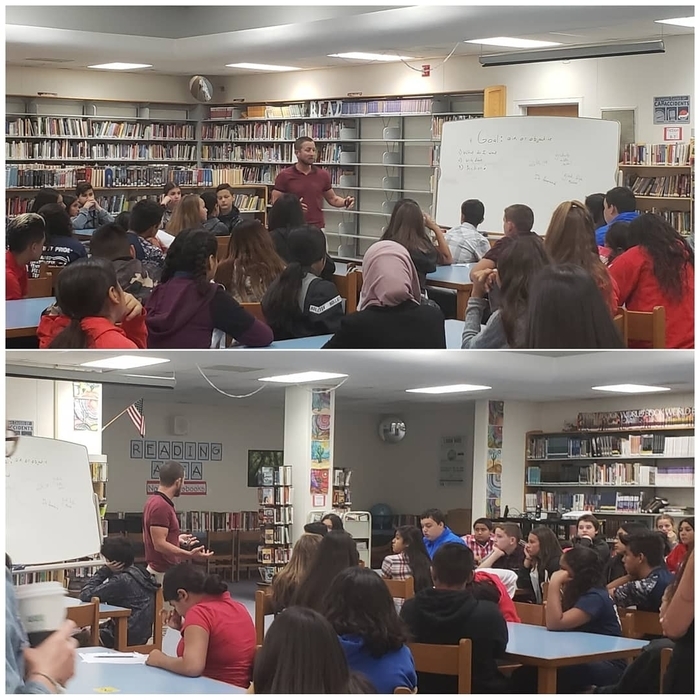 Today we had motivational speaker, Mr Justin Levine, come and speak to the students on their future and goal setting. Thank you for everyone who came out to our Annual Music Pulled Pork Drive Thru Dinner last night! 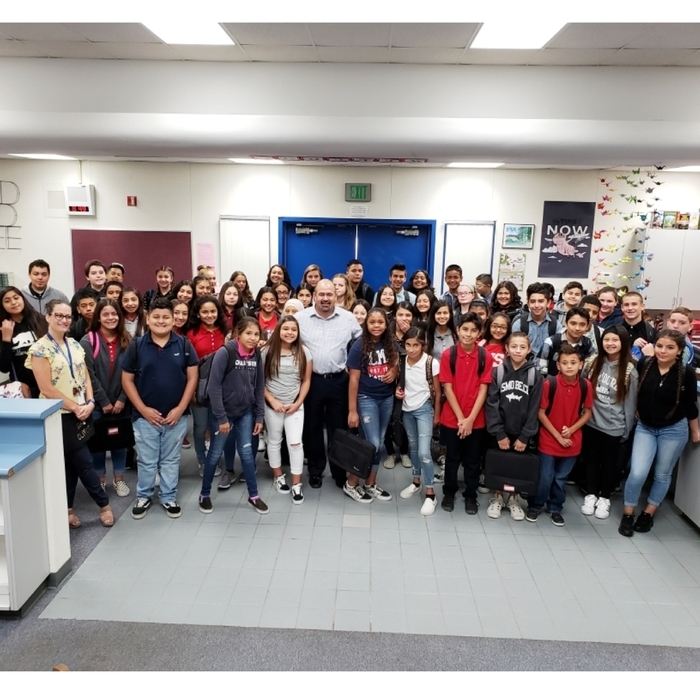 The Mayor of Lemoore, Ray Madrigal, visits Liberty Middle School's ASB leadership team. 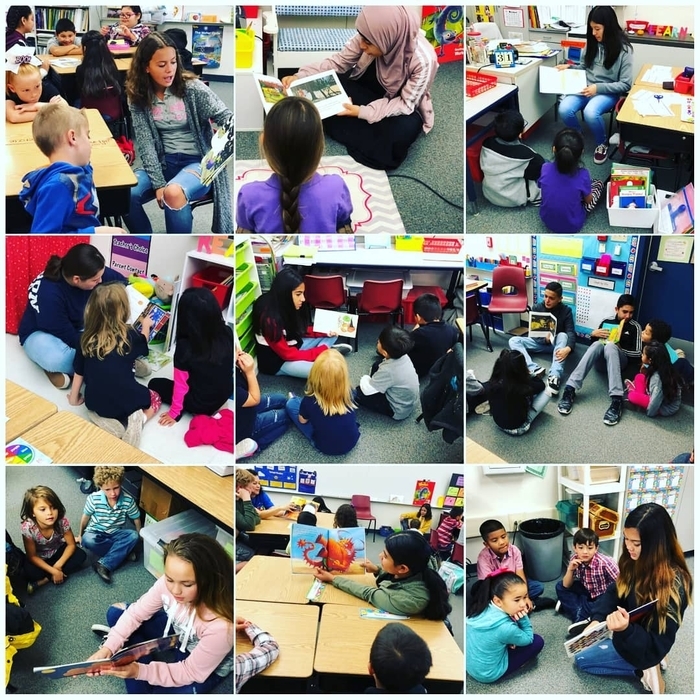 It was a fantastic opportunity for our leadership students to learn about the good qualities of a leader and how to best improve their school and community. Please join us for our second HOME game this Thursday, Sept. 13. Our AWAY Volleyball and Football games against Kings River Hardwick has been rescheduled from Wednesday to FRIDAY, Sept 14. 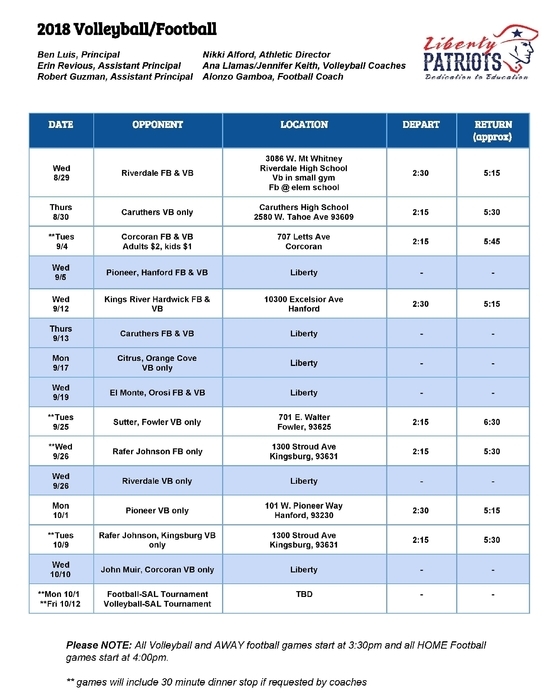 Please also note that the game originally scheduled against Riverdale, August 29th has been rescheduled for Sept 18. Thank you for your support and we hope to see you at a few games this year. It is our 1st home game at Liberty. We hope to see everyone out supporting our football and volleyball teams. Please note that the football game will also start at 3:30 today. Our ASB will also be out selling concessions. Fun Friday: Patriot PRIDE is what we like. Have a great 3 day weekend. We will see everyone on Tuesday September 4th. UPDATE: The football and volleyball game was canceled today due to the transportation delay. We will update when there's a rescheduled date. We again apologize for the inconvenience. Unfortunately due to transportation delay, the football and volleyball games will start at a delayed time. Please note that students will also arrive home later than originally stated. We apologize for the inconvenience. We have a few things coming up this week. 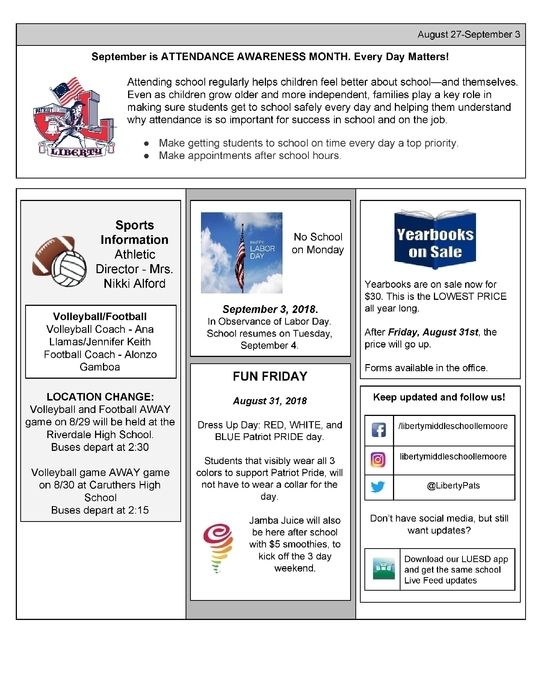 Please check out the newsletter for all the information. Thank you to all of our students that tried out for our fall sports. 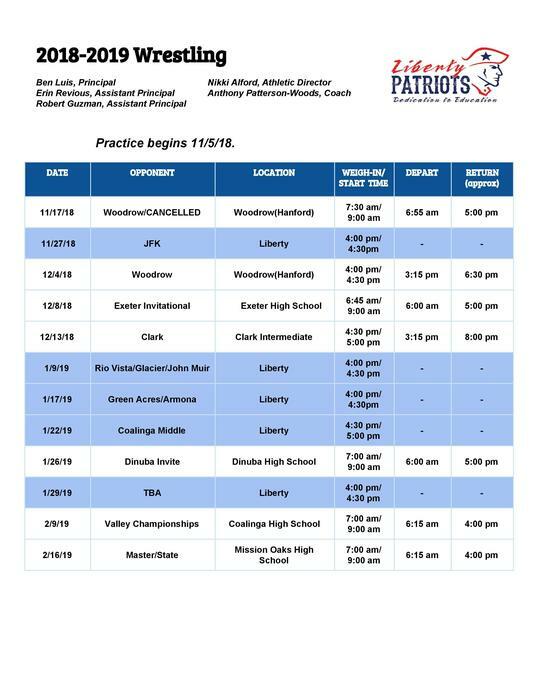 This is the 2018 volleyball and football schedule. We hope that you can join us for some games this year. Just a reminder that volleyball games and AWAY football games start at 3:30pm and HOME football games start at 4:00pm. 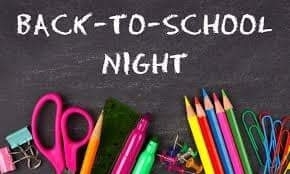 Please join us tomorrow, Tuesday the 21st from 6:00 p.m. to 7:00 p.m. for Back to School Night. 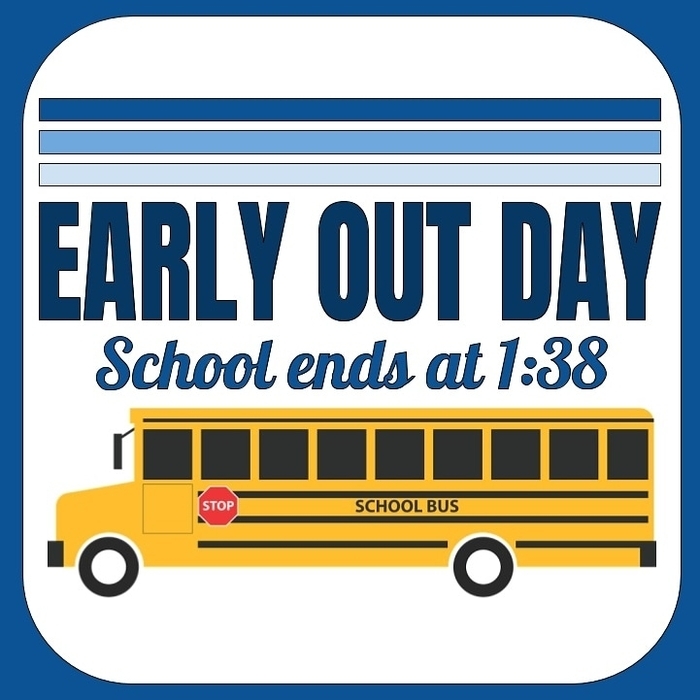 Just a reminder that it is early out day (Mondays) School ends at 1:38. Have a great day. 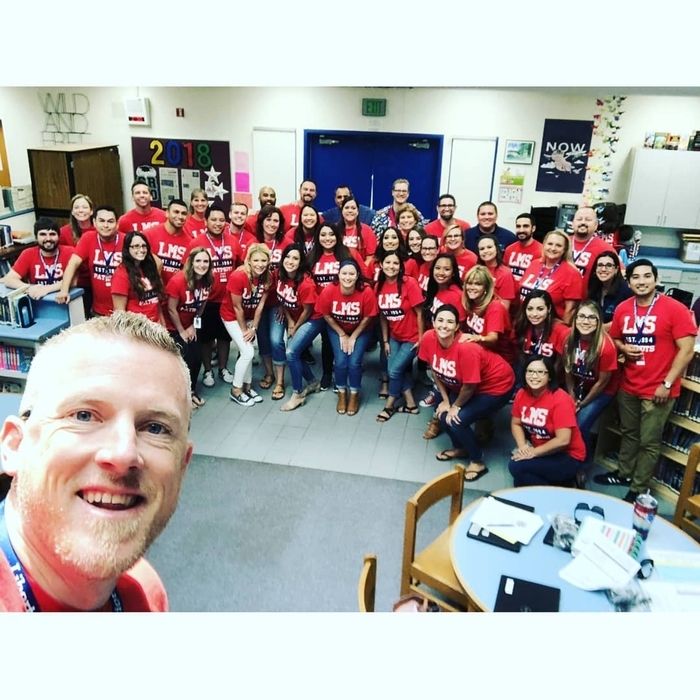 We hope you had an amazing 1st day at Liberty! 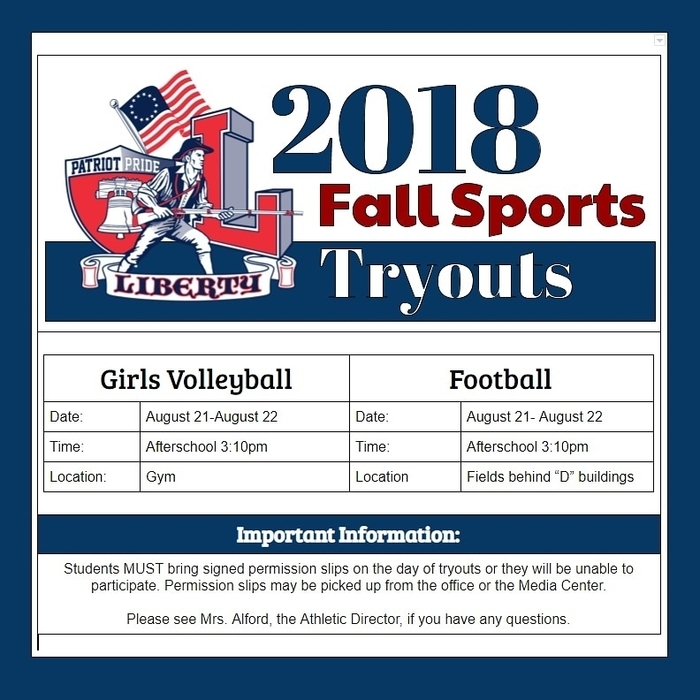 We are having our fall sports: volleyball and football tryouts next week. Drop by the Media Center or the office for permission slips. 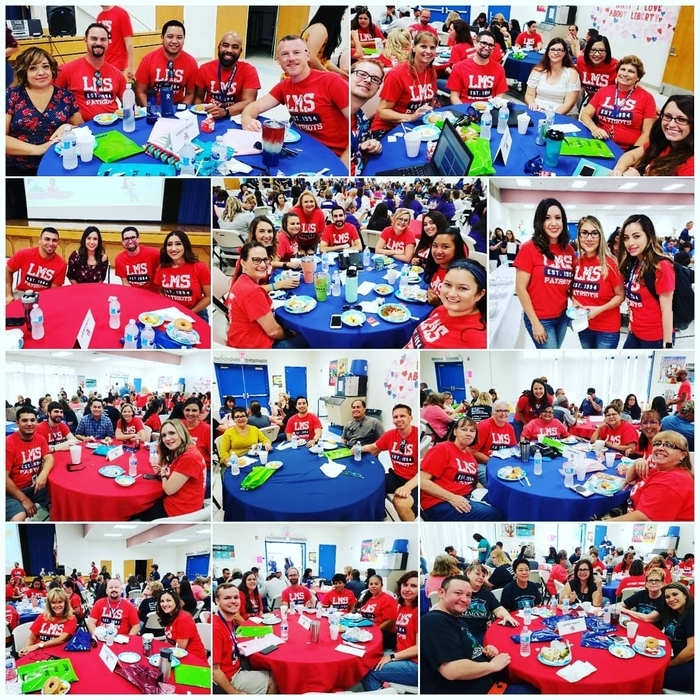 We are ready to start the new school year! We can't wait to meet our Patriot Family.